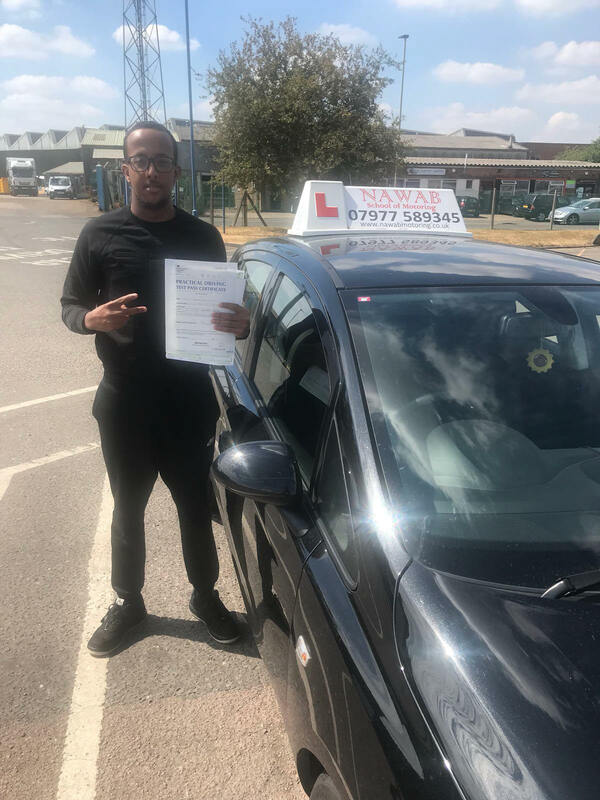 "Mr Navab is an excellent instructor he is good explained everything very clearly and made me feel at ease when driving he was always patient calm and thorough in his teaching.i can’t thank him enough thank to him I now passed my test and learn to how to be a confident and safe driver. 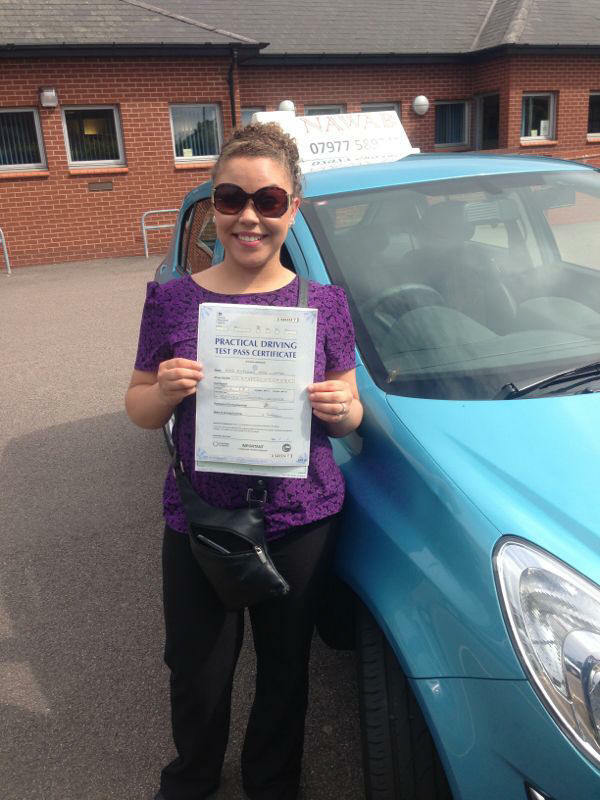 I couldn’t have asked for a better instructor thank you so much for your help." "I just passed my test in first attempt today. I really appreciate his work and I definitely reccomend him who really want to pass in short time and in first attempt. Excellent experience. Again thank you soo much." I was always nervous but the instructor was very calm and understanding. Very friendly and precise! So so grateful for everything that he has taught me and Im going to miss our lessons ! Thank you for coping with me." 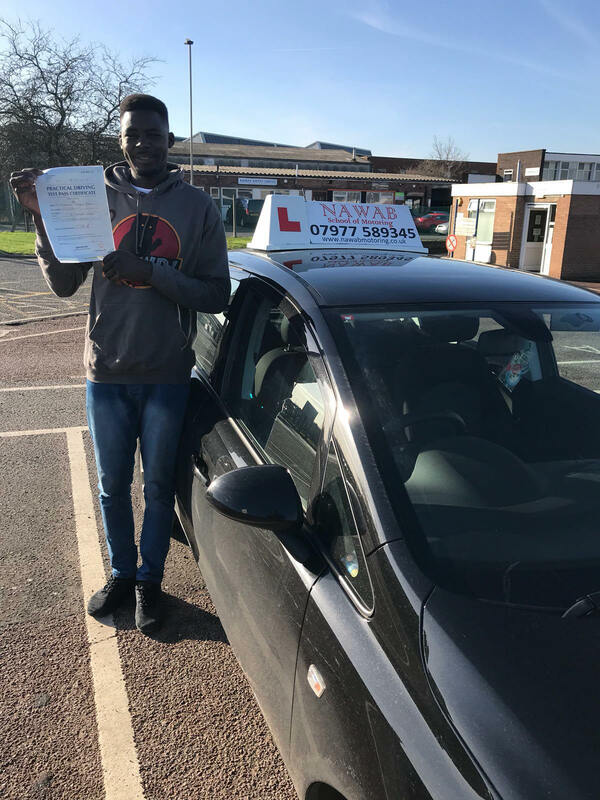 "First time passed ''' I decided to take my lessons with NAWAB as he had very good reviews coz other instructors that went but didn't give me the information I needed I struggled on big roundabouts . prior to going out with but feel so much more confident with Nawab" now he took the time talked me through it all anything I needed to know And he always help he's a great man calm very easy to get on with and I'd highly advise you take your lessons with him if you wish to pass ASAP With NAWAB" YOUR GREAT thanks"
"What can I say! He has put up with 1 year 7 months of my nervousness, slowness and stupid mistakes, until I finally passed! I am extremely grateful for his patience and his good attitude in being an instructor. Always tries to work around your schedule, which was good for me as I work shifts. Did not lose patience or get frustrated at me asking the same question over and over again. All in all never thought the day would come where I’d pass and it finally happened today!" 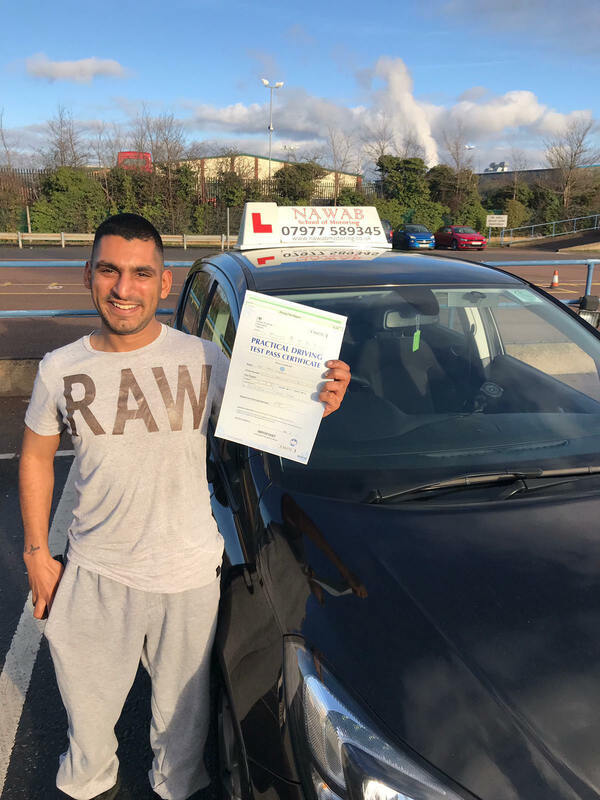 "Would highly recommend Mr Nawab is very patient and always accomerdates to your schedule and he always encourages to make you a better driver"
"Would totally recommend, he's a great instructor with a great track record, he answered all my questions and got me passed. Would recommend." 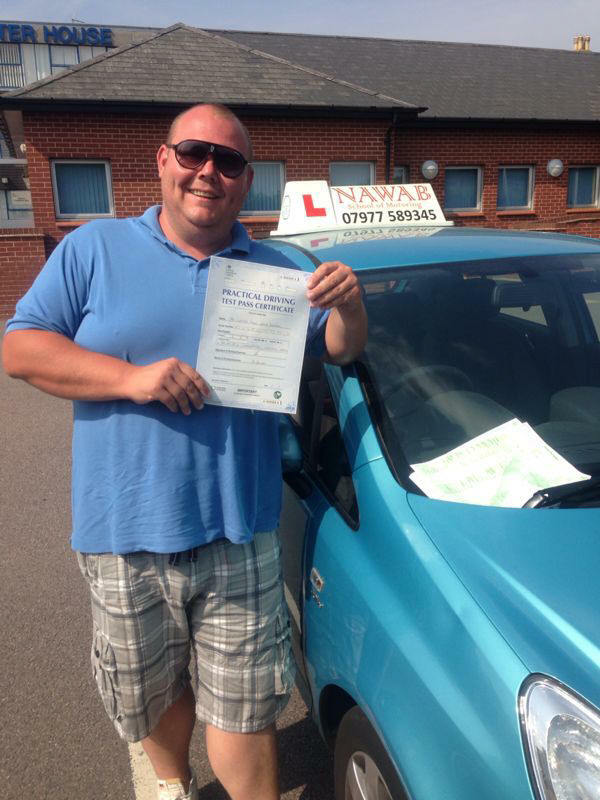 "Mr Nawab is an excellent instructor! He explained everything very clearly and made me feel at ease when driving. He was always patient, calm and thorough in his teaching. I can't thank him enoughThanks to him I now passed my test and learnt how to be a confident and safe driver. 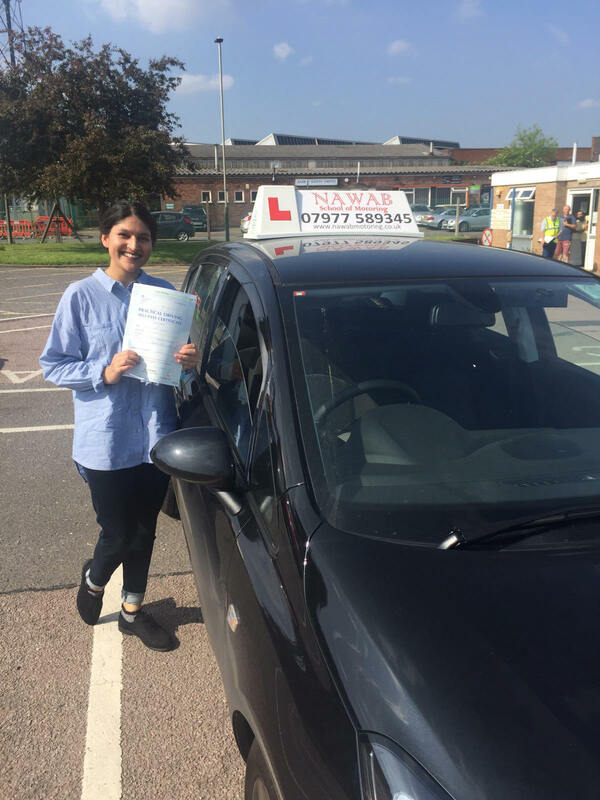 I couldn’t have asked for a better instructor!Thanks so much for your help"
"Excellent experience with Nawaab school of motoring. 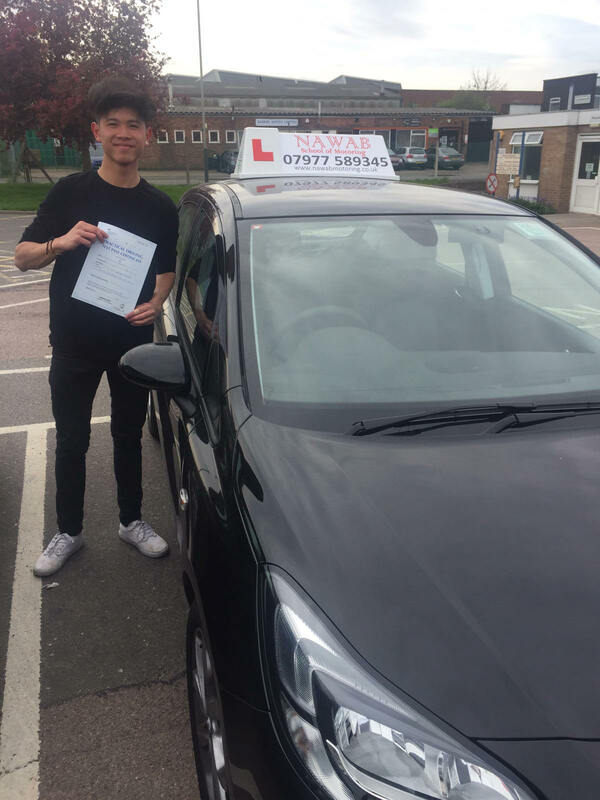 He is calm and very knowledgeable instructor he provided me with tips and put in a lot of effort to ensure I pass my test. 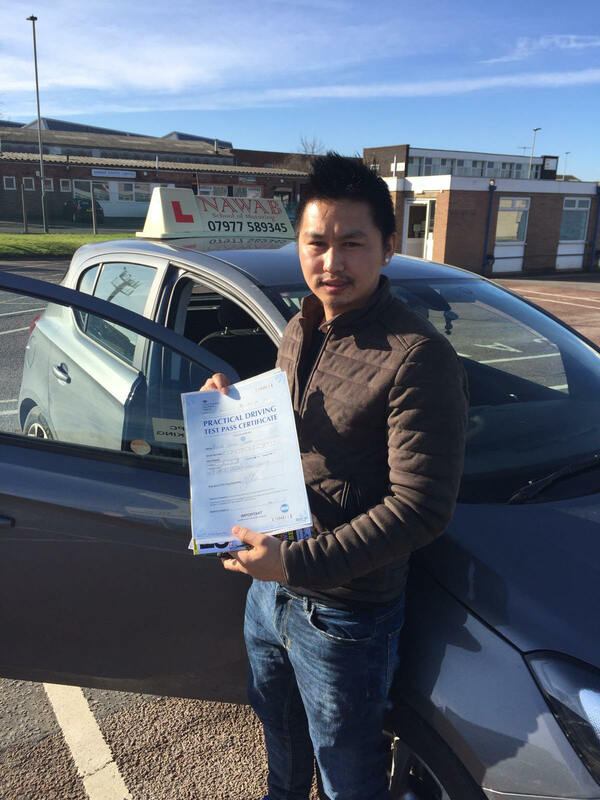 He is also very reliable I would definitely recommend him to those who are looking for a well informed instructor!" 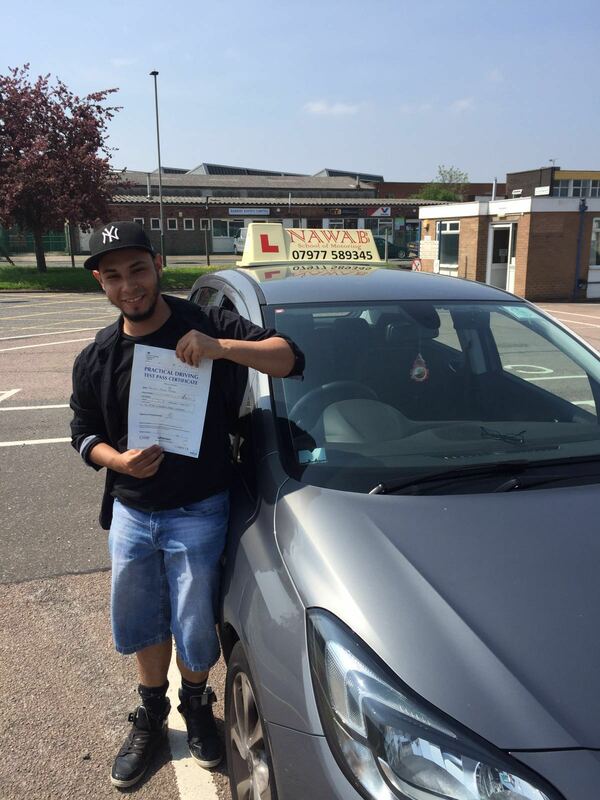 "Mohammed was a very calm and patient instructor. He is very knowledgeable of the roads and the rules. 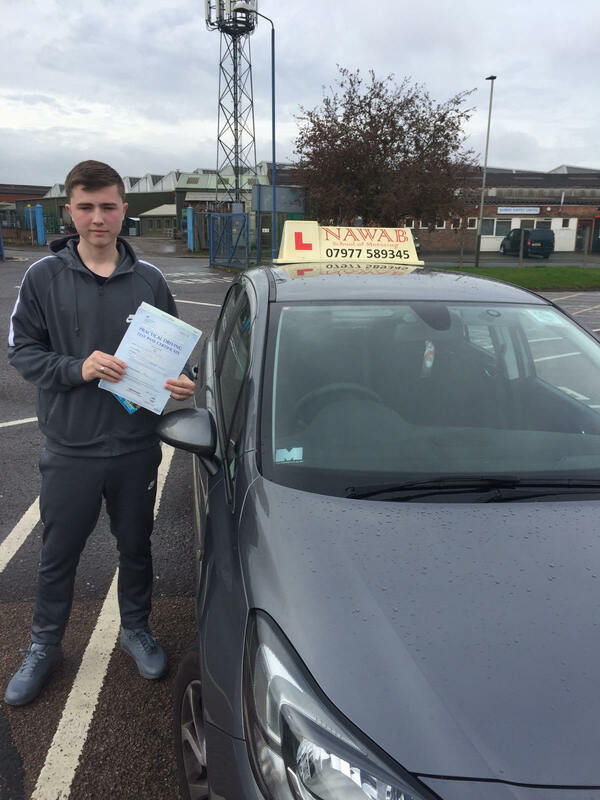 He carefully assessed my driving abilities and then planned lessons to fill the gaps - this got me test ready. Even when I made errors, he was always calm and professional and stuck to explaining the rules of the road. His main focus is getting all students to pass and become safe and independent drivers." "Excellent instructor. I passed the first time. Highly recommend." "Very good instructor. Passed within 3 weeks of meeting." "Mr Nawab is a very good teacher and is very calm when giving you lessons. I would highly recommend him as your instructor." "Mohammed Nawab is an excellent instructor. He is very Patient and professional. He accommodated me for lots of classes in short notice. I want to say thanks to him for teaching me how to drive and putting so much of his time and effort behind me. I'd definitely recommend him to everyone and anyone." "Excellent instructor! He was very patient and encouraging. Definitely feel I got excellent value for money and time. Would 100% recommend. Thank you very much Nawab!" "Excellent instructor. Calm and thorough in his teaching. Mr Nawab always offered great tips and explained what I was doing well and how I could improve. Extremely patient and meets your needs and availability.I would defiantly recommend to anyone!" 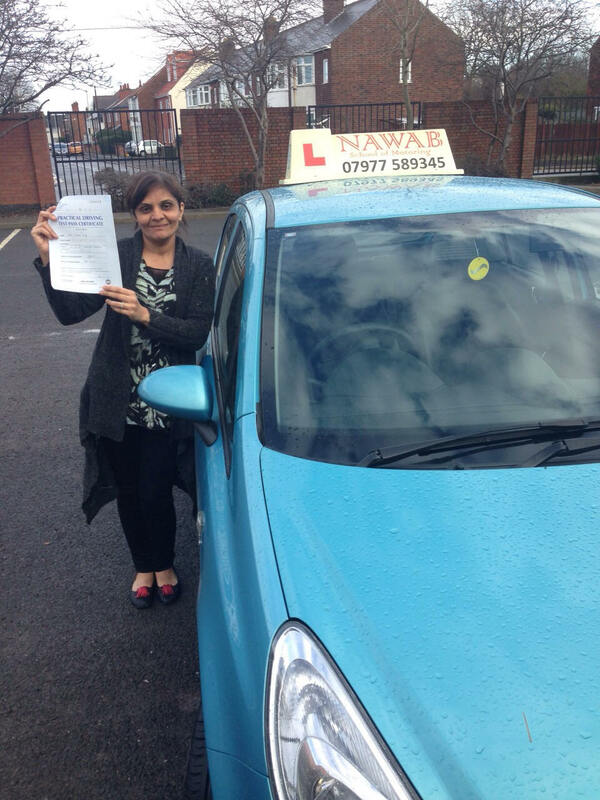 "AMAZING INSTRUCTOR who has help me pass my practical test first time. 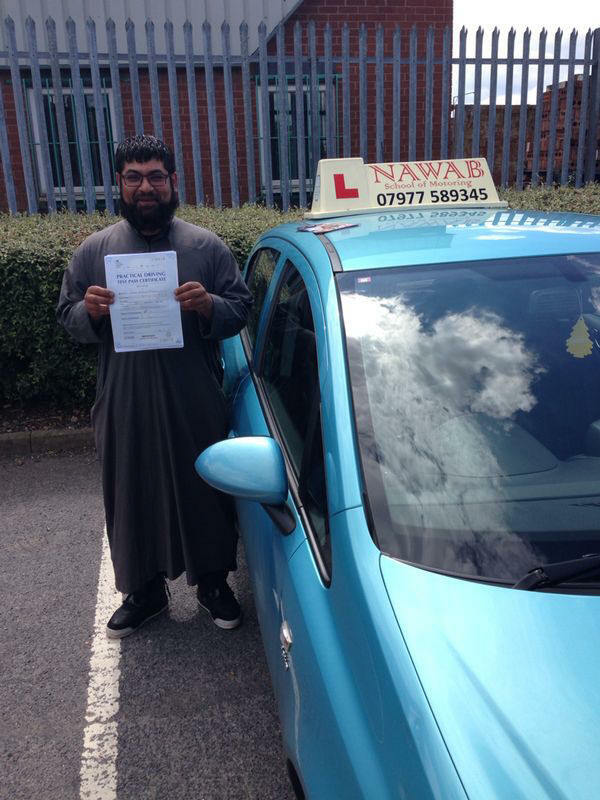 I recommend everyone to join Nawaab school motering for the driving lesson and pass first time. Many thanks Mohamed Nawab." 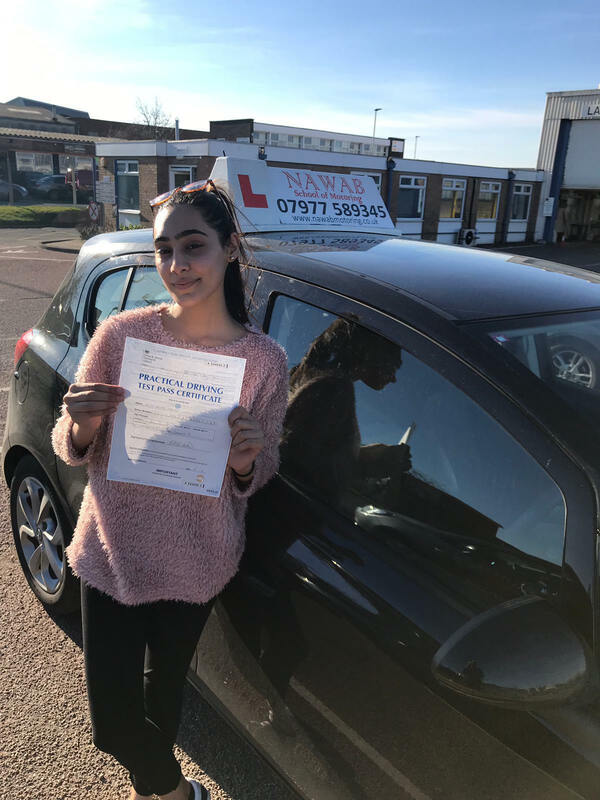 "I have passed the driving test today, I would like to thank my driving instructor Mr Irfan Nawab for his professionalism in making me ready for the test. I recommend him as an excellent instructor." "Thanks to mr.Nawaab as a my good instructor he gaves me all perfect Lessons even if i am not understand he teach me again and again with patients. 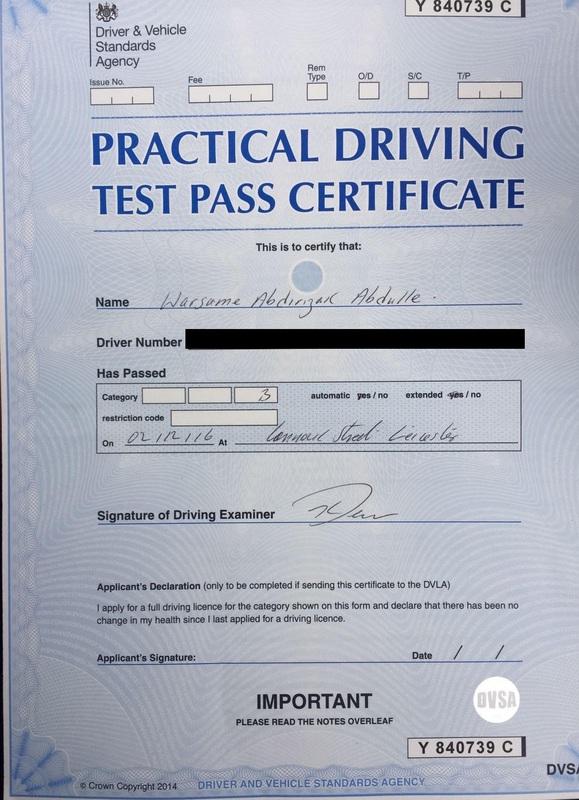 I passed in my First time Test. 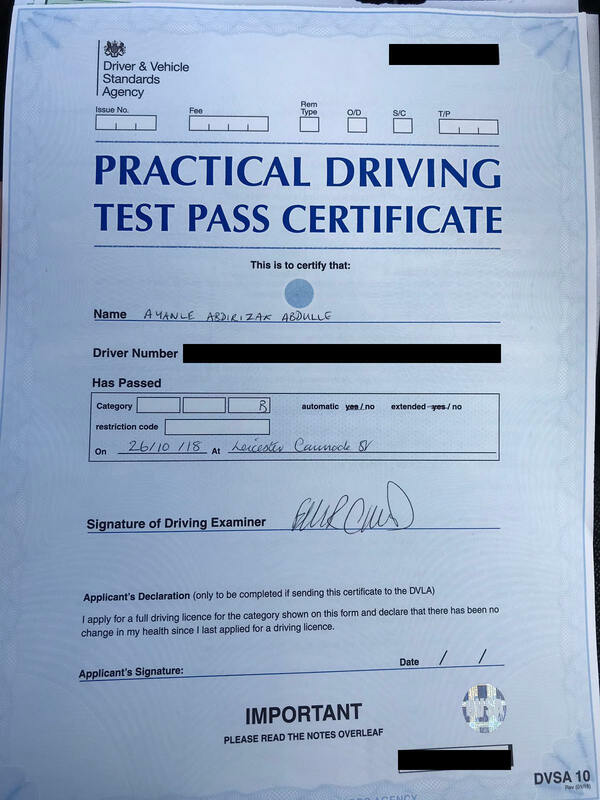 20th Sept.18"
PASSED FIRST TIME !!! Only with one minor ‘ wowwww ??. Mr Nawab is excellent instructor. He is a superbbb, and very friendly.. 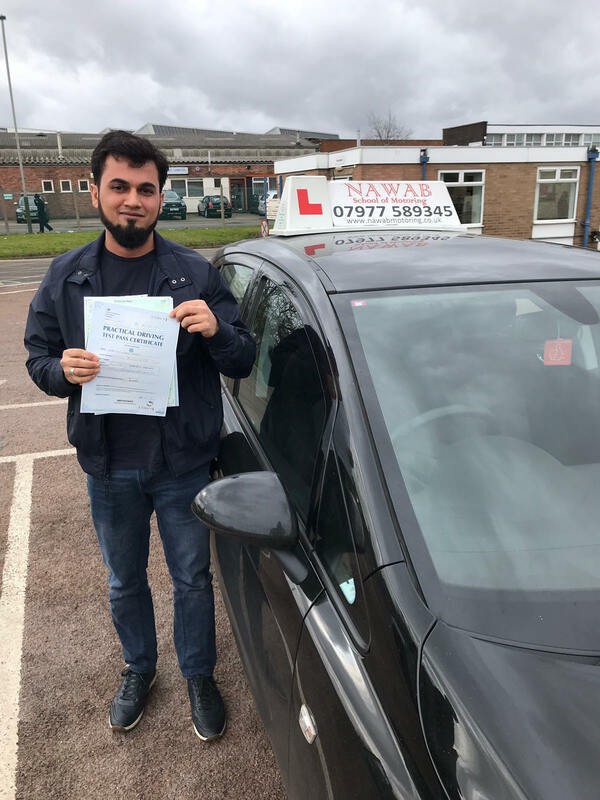 I took too many lessons from my previous instructor but once I came to NAWAB He trained me to pass quicky in less lesson and first time He is extremely calm and patient. His lessons are highly enjoyable. With his help I passed my test the first time. Thank you Mr Nawab. 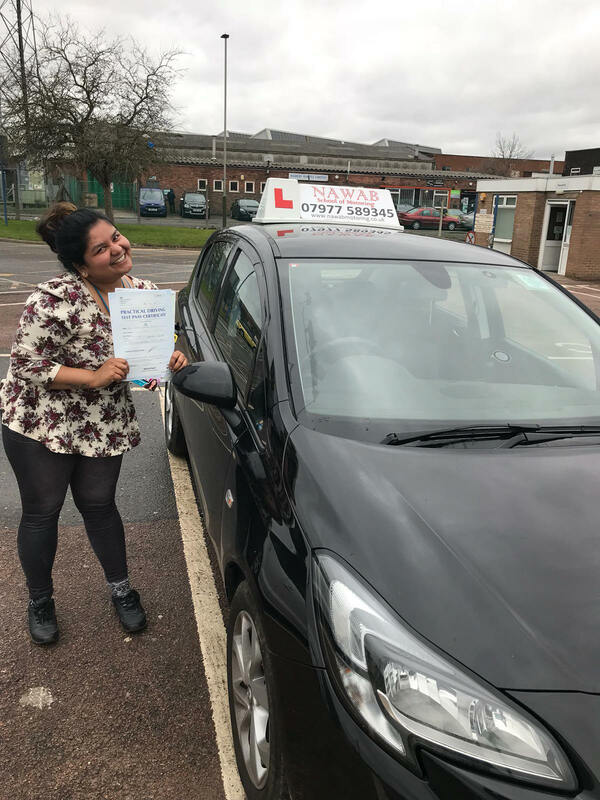 Highly Recomond to others plz thanks..
"Passed at first attempt with nawab driving school,highly experienced instructor,well manared,good teaching technique,more importantly very patient.well worth every penny if you want to pass your test." 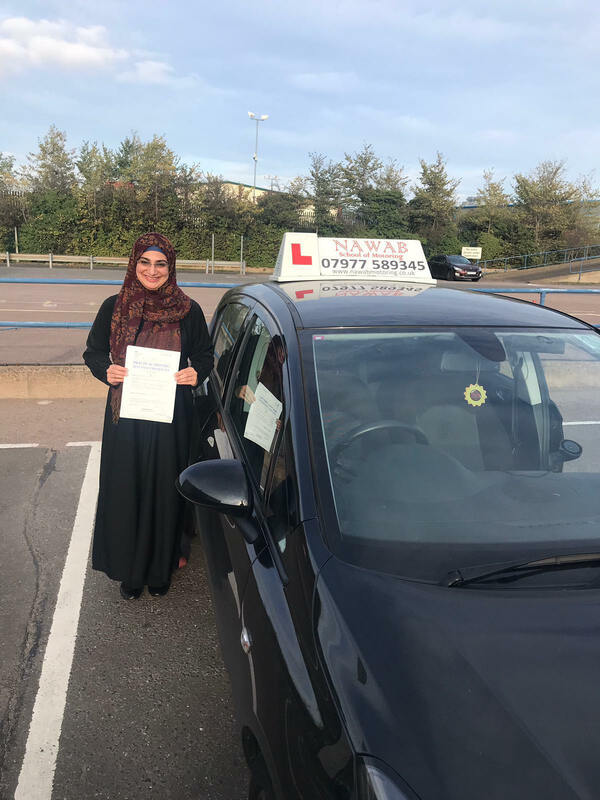 "Mr nawab is very nice experienced driver who helped me learn a lot I never knew on the road and also helped me pass first time his calm and made sure I understood everything he said to me"
"Mohamed Nawab is a fantastic instructor.He is patient, professional and punctual and accommodated me for lots of classes in short notice. 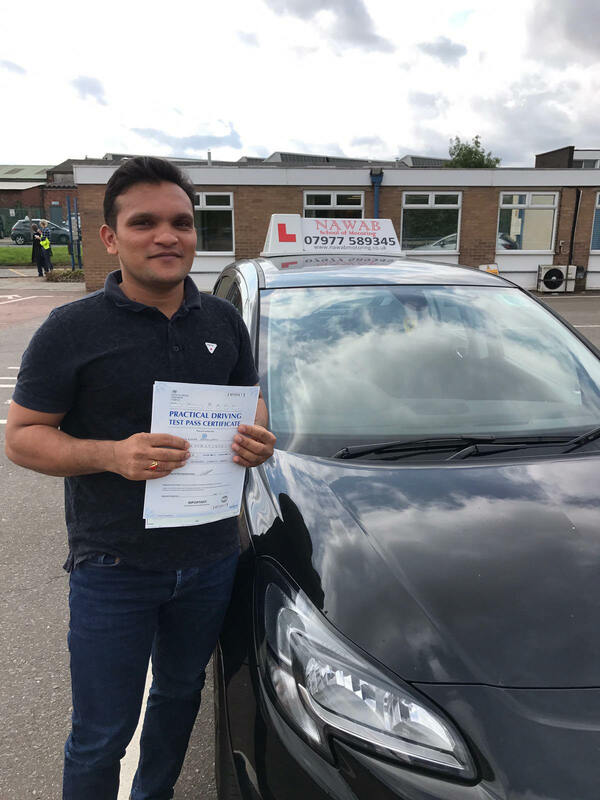 I joined his classes on 24th June and passed my test first time on 18th July.That itself shows that he is very committed to his students and always delivers the best lessons as he comes prepared. He works his way around your schedule to make it convenient for you and makes driving fun and easy. I definitely would recommend him to everyone. Thanks." 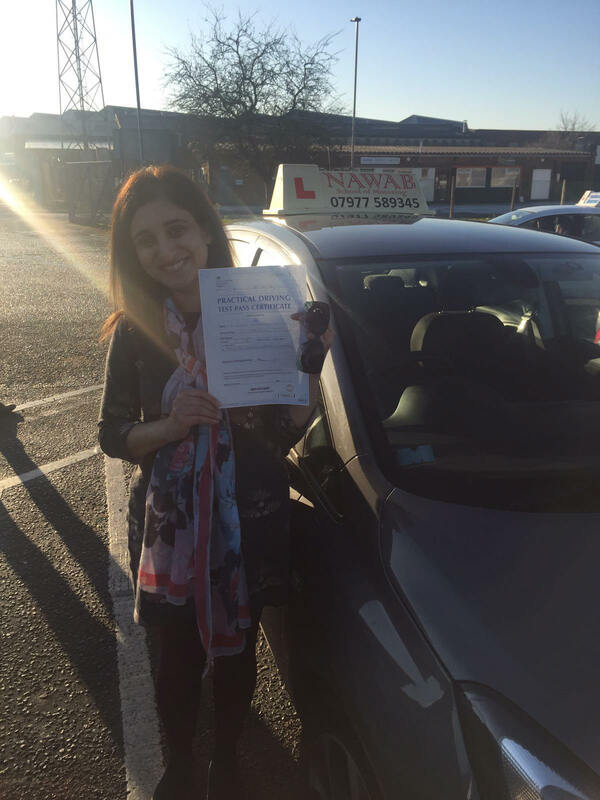 "My instructor is a very goid calm person very professional and respect others. Today I pass my test I am very happy thanks to my instructor. He is very nice person and teach very good and professionaly." 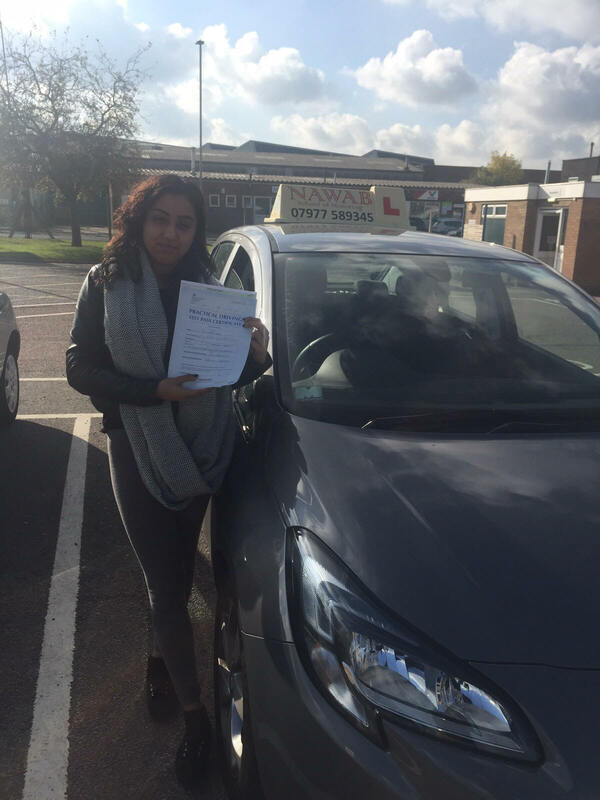 "Nawab helped me pass with 3 minors and was very patient in teaching me. He took me through all the test routes and helped me improve on my flaws. Brilliant instructor who I highly recommend for people to learn with." "Nawab Bhai such a good man, and very useful man for teaching. He helped too much for me to pass my driving. Thanks to much Bhai"
"Mr Irfan is the most professional instructor that has ever taught me. Thanks to him I have passed from the first go after just 10 lessons. Would highly recommend. Thank you sir." 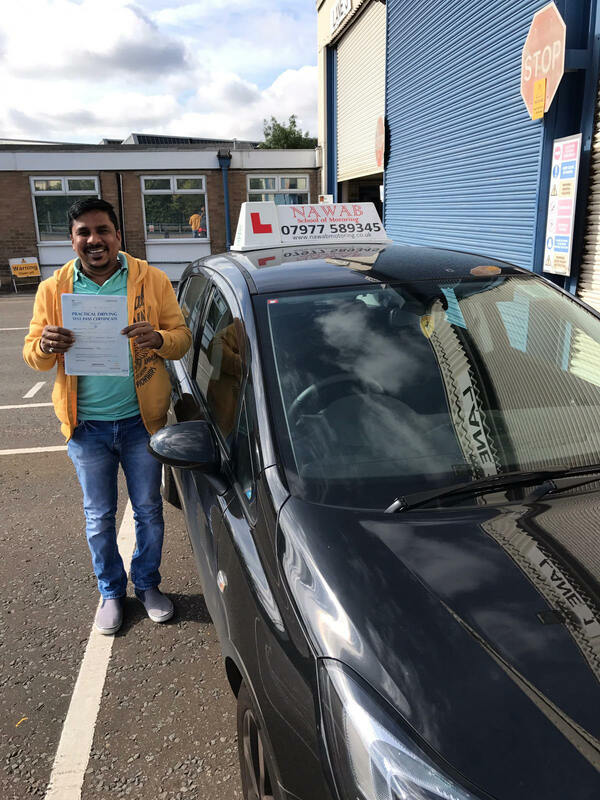 "Mr nawab is brilliant driving instructor he is excellent in explaining very very professional and experience teacher he help me a lot thank u." "Great calm instructor highly experienced. Would recommend." 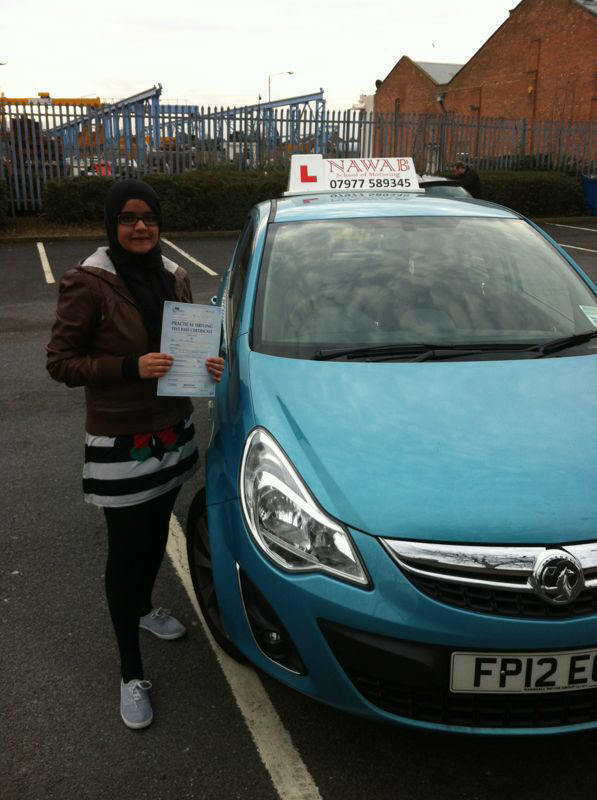 "Mr Nawab made sure I went through all the possible test routes and prepared me well enough for me to pass my driving." "Very good instructor. Patient and polite. 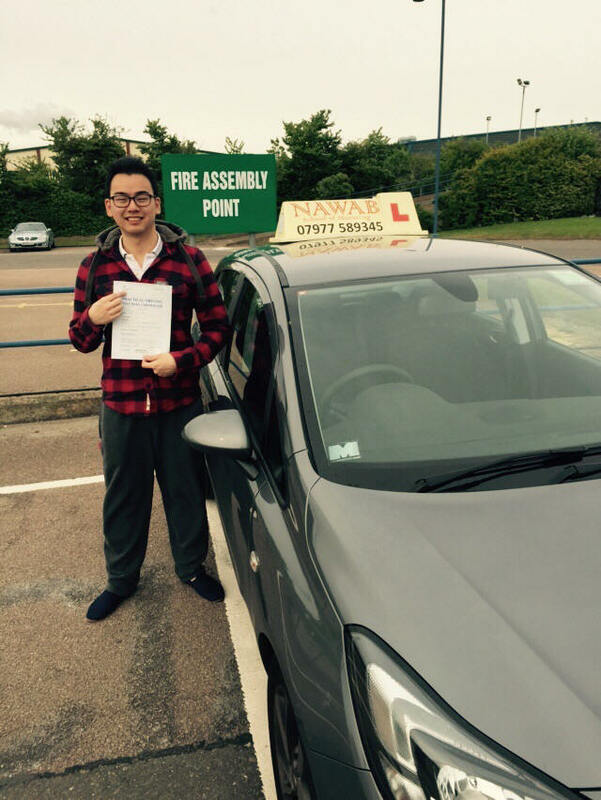 Glad to have passed with him." "Very professional teacher. I would recommend to everyone. 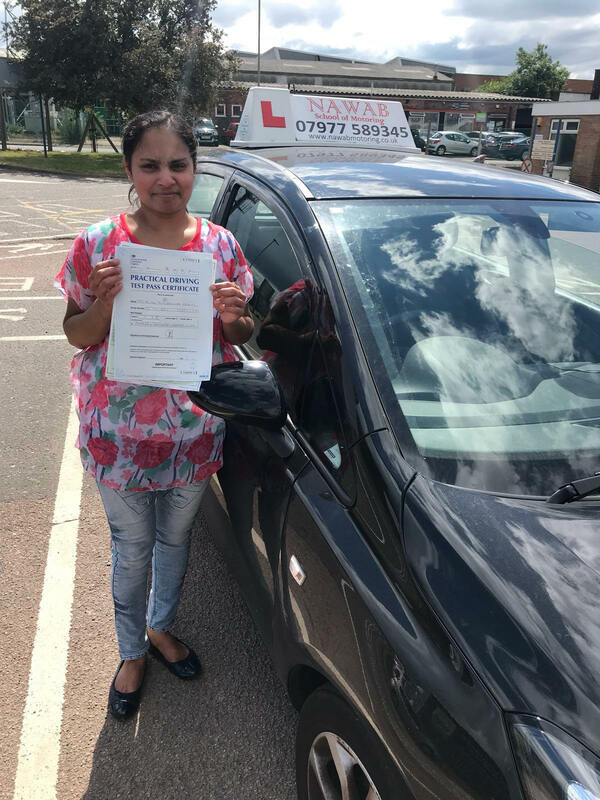 Very good at teaching and was a big help in learning to drive"
"He is a great instructor who is very supportive and explains everything in ways ud understand"
"Really calm and friendly driving instructor. My previous driving instructor was very anxious which made me feel uncomfortable. After having 10 lesson with him, I moved over to nawab driving school! From my first lesson he showed faith in my driving and helped me pass. Would highly recommend this driving school! Thank you!" 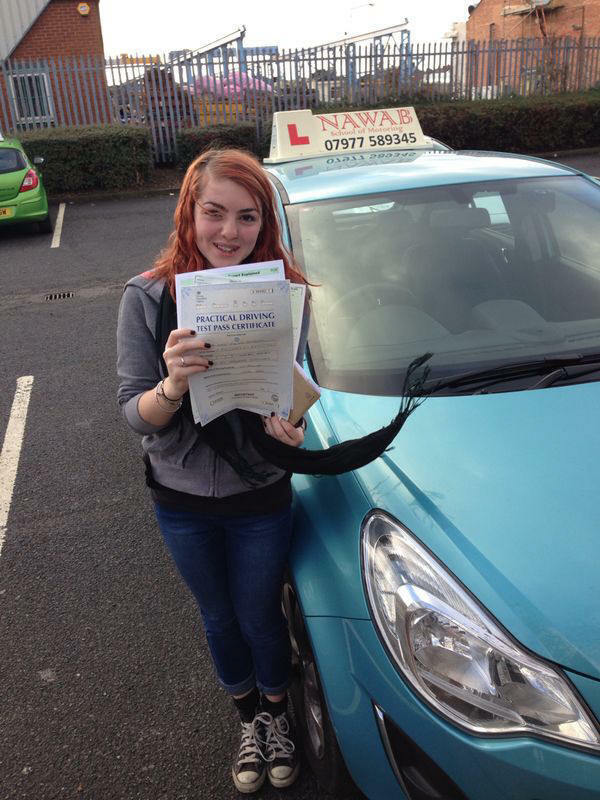 "Very good driving instructor taught me everyhing I know about driving, that I thought I’d never learn. Very kind and friendly teacher with excellent time keeping and never let me down!" "I want to thank my instructor for all his time and effort that he's put into teaching me how to drive. 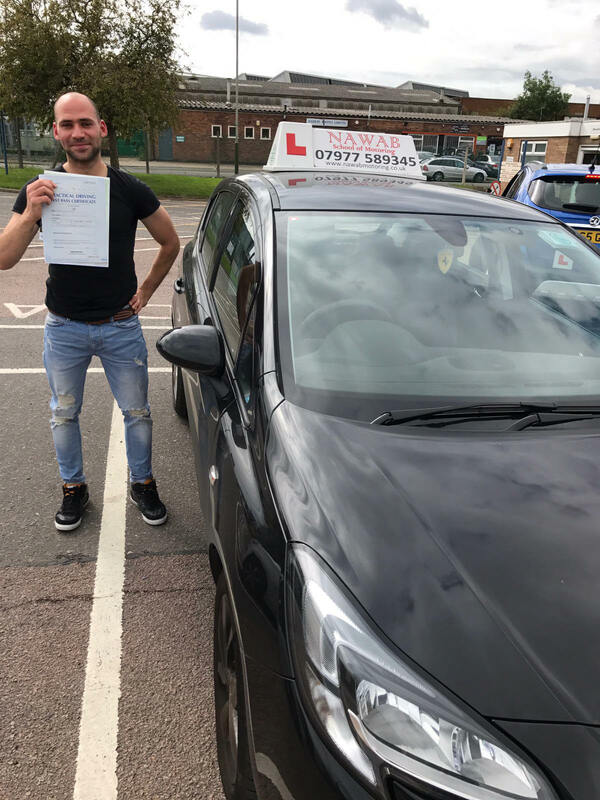 He took me from the beginning to the end and i have passed my test.I would truly recommend him to anyone.He is very nice, polite and understanding. He believes in his learners. He was positive and believed that i could. Now it's all over and i got my licence. I'm very happy and pleased. Big thanks to Mr.irfan (Nawab)." "I came to Nawab thinking that I can drive, due to being able to driver automatic cars previously. However, in my first lesson I did not seem to get the hang of the clutch which really annoyed me. NAWAB (THE LEGEND) then slowly help me gain knowledge on how the clutch opperated which really made me sense as to how to use the clutch. I slowly then felt confident in driving. 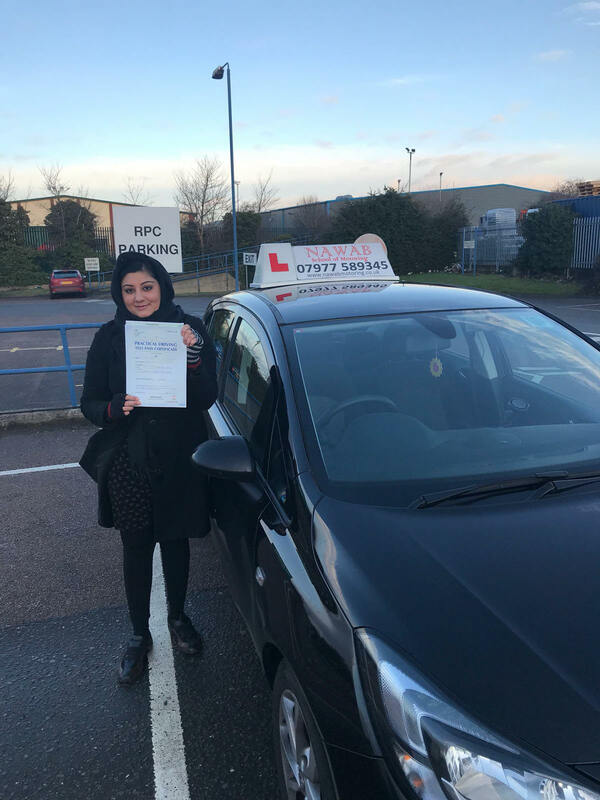 It was my biggest confidence boost when I overcame that problem, which led me to drive more safely on the road, I can guarantee that I am so reluctant that I had the best driver on my side. Which helped me to complete my driving test in less than 2 1/2 months, shout out the legend barakallah. Also a great personality, always had some really good conversation. Would love to have spent more time, but in life our time is very short and you got move on. But I am always gonna be grateful for my teacher." 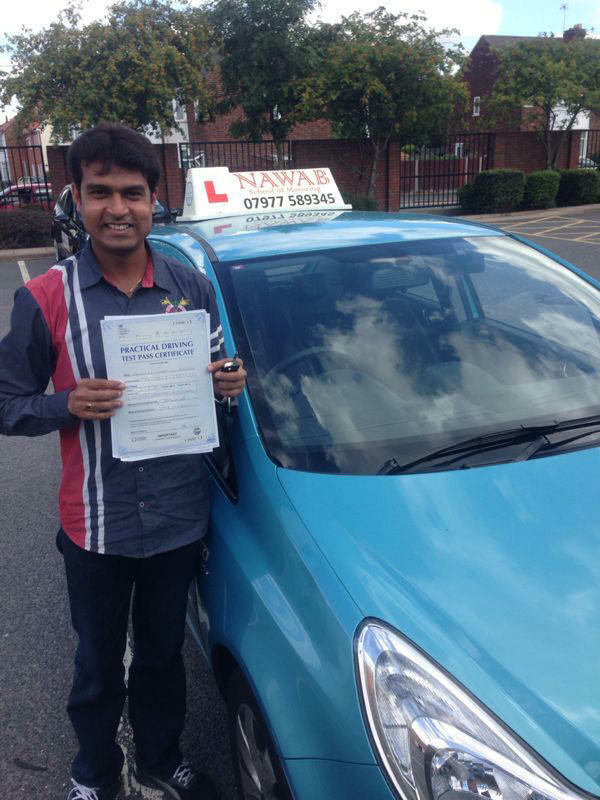 "Mr Nawab is a great driving instructor with confidence, a good way of teaching and a lot of patience. His calm nature made me feel comfortable throughout my learning experience which allowed me to pass on my first attempt. I would definitely recommend!" 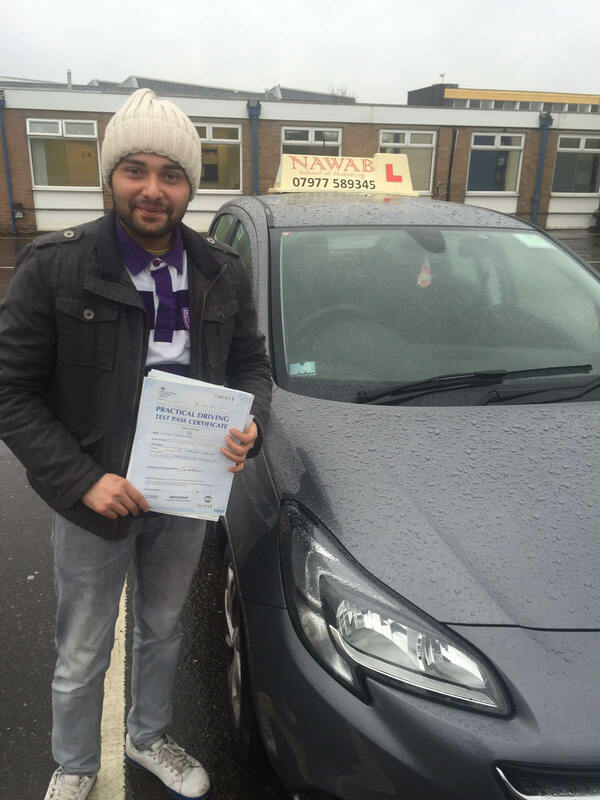 "Mr Nawab was an excellent instructor. He is extremely calm and patient. His lessons are highly enjoyable. With his help I passed my test the first time. Thank you Mr Nawab." "Mohammed is a perfect driving instructor. 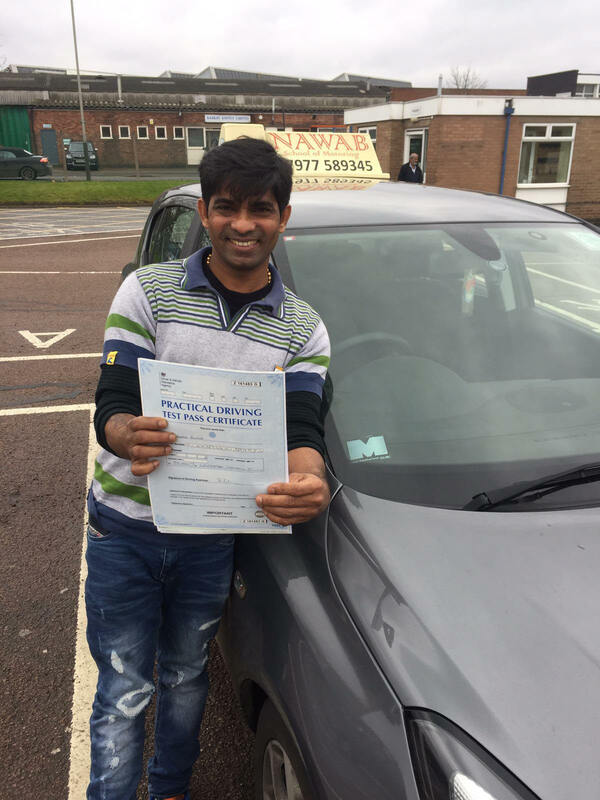 Had a first time pass, thanks to him." "It was amazing wonderful experience with Nawab! I was very new with cars never driven before! But Mr Nawab was excellent in explaining stuff to me! 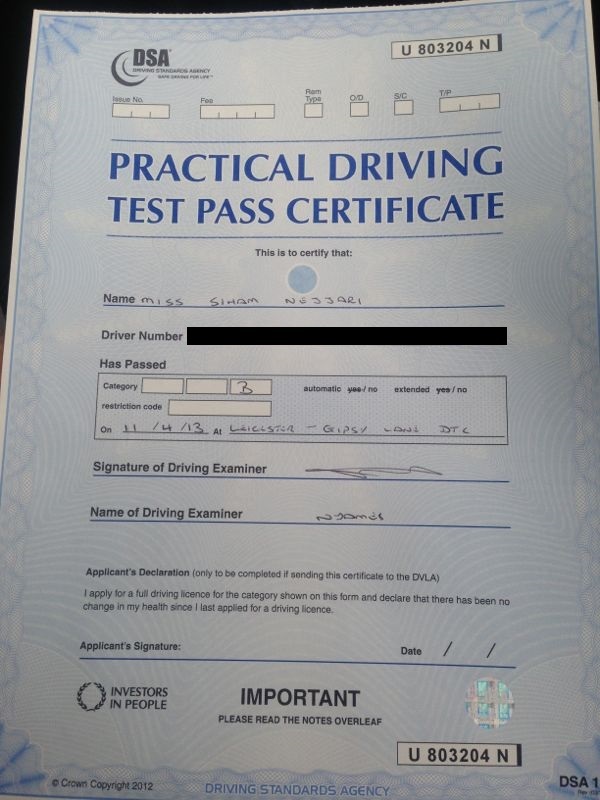 And i passed my practical first time!!!!!" 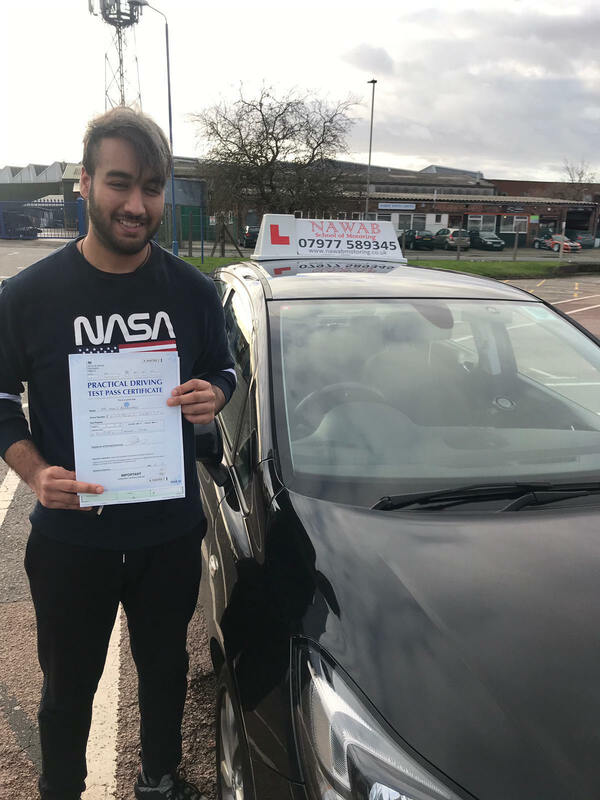 "I never thought I would pass but Mohammed was very patient with me, his friendly and enthusiastic lessons made me feel at ease and really calmed my nerves, he is a great instructor!" "Hi its been a good experience driving with mohammad bhai and i have pass my practical exam in 1st attempt. 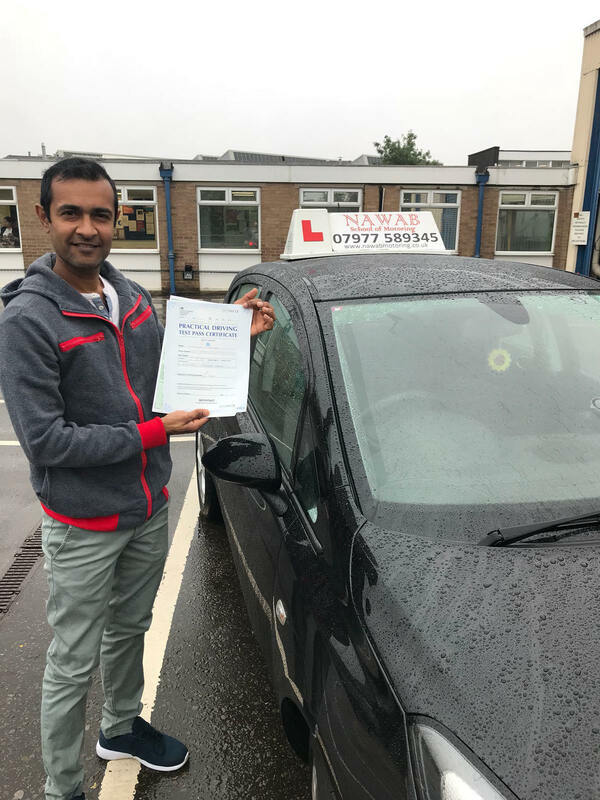 He is good instructor and a good person as well i was not confident but he guided me very well so please contact to take a lesson." "Hi passed my practical driving test on 1st attempt it's great moment for me I thankful to Mr. Nawabbhai who given me driving lessons He is very friendly and sincere instructer. He is very experienced too.Thanks"
"Amazing teacher and a very patient instructor." 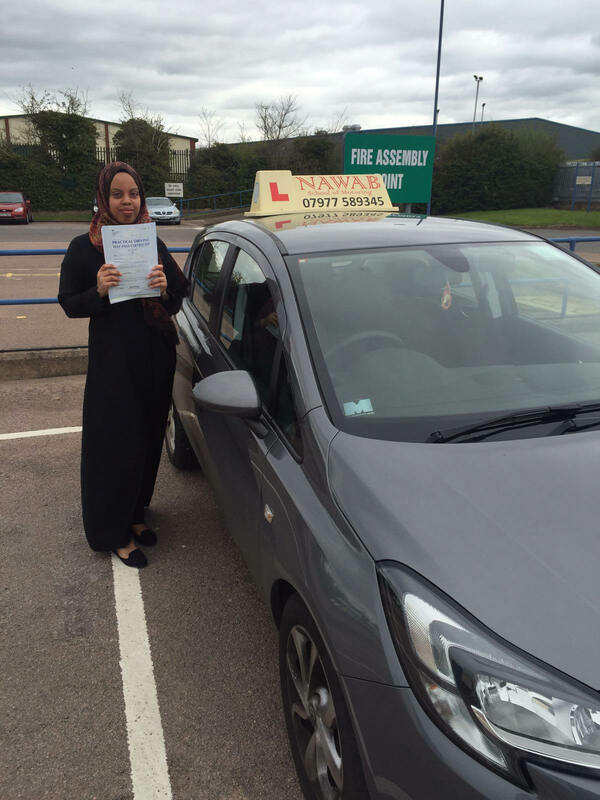 "Mr Mohammed is a top Driving Instructor, providing excellent and accurate courses on the road. If it wasn't for him I wouldn't have had a first time pass in a so little time. Many thanks to him for his big efforts to make us proper drivers on the road." 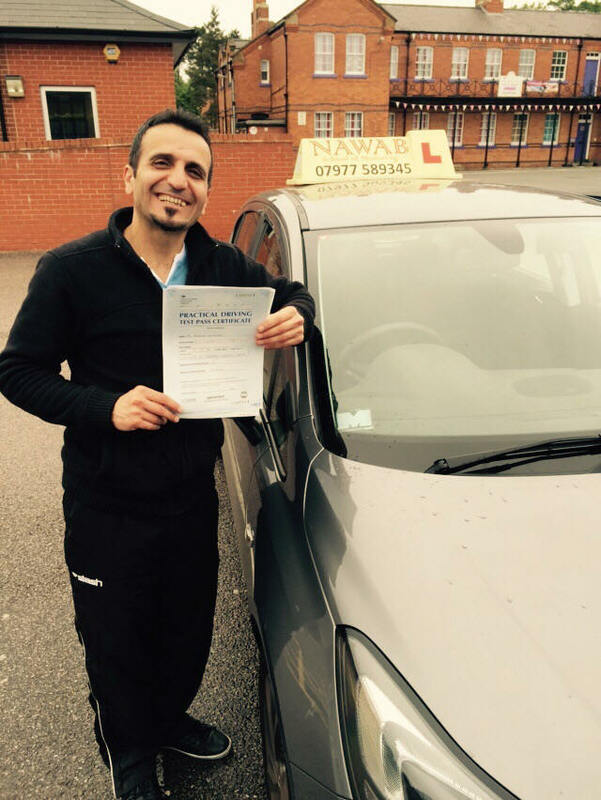 "Mr Irfan Nawab is an amazing driving instructor. He teaches in a very precise, calm and patient way. He gives the right advise at the right time and keeps working on your areas of improvement till its perfect. Due to his fantastic teaching skills I have passed my driving test on the first attempt!! 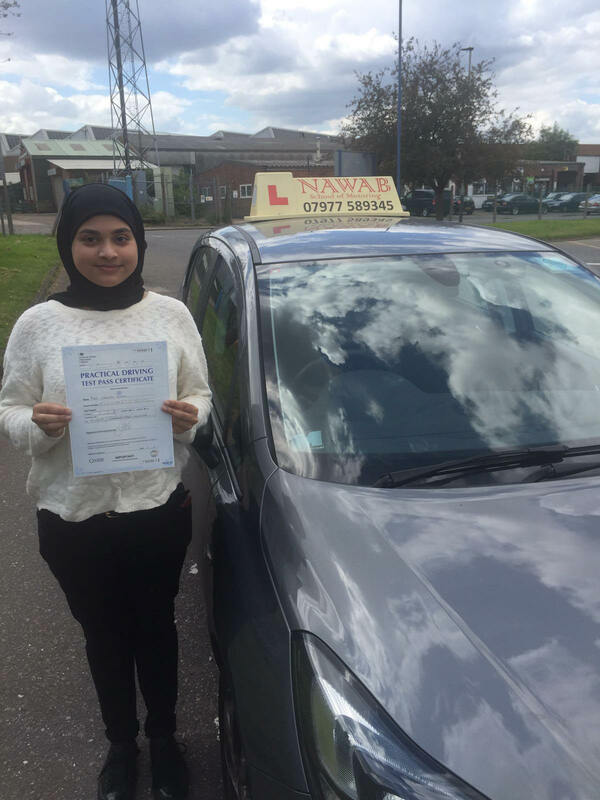 I would strongly recommend Nawab school of motoring to anyone looking for an outstanding instructor." 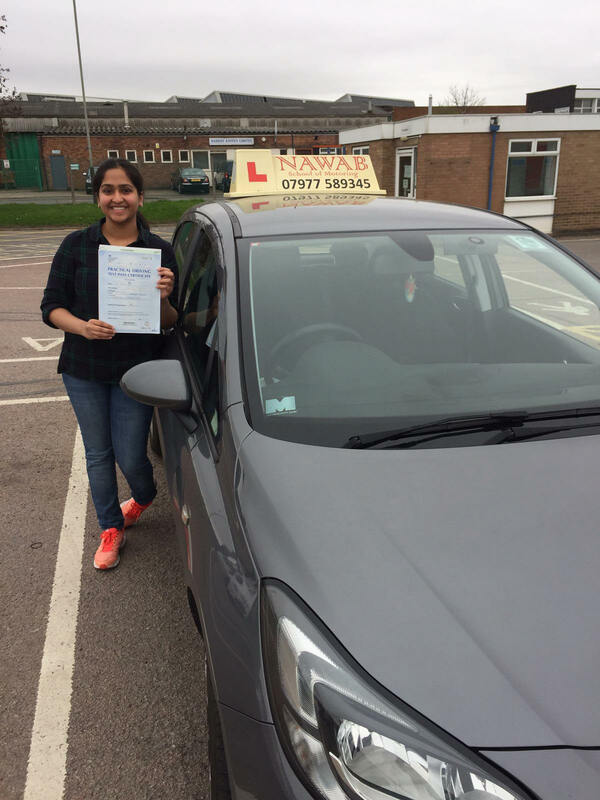 Nawab school helped me pass first time with very few errors. My instructor was patient, proffesional and gave great tips and advice on how to deal with the test. A great experience and would recommend all learners who want value and high quality to join Nawabs school. 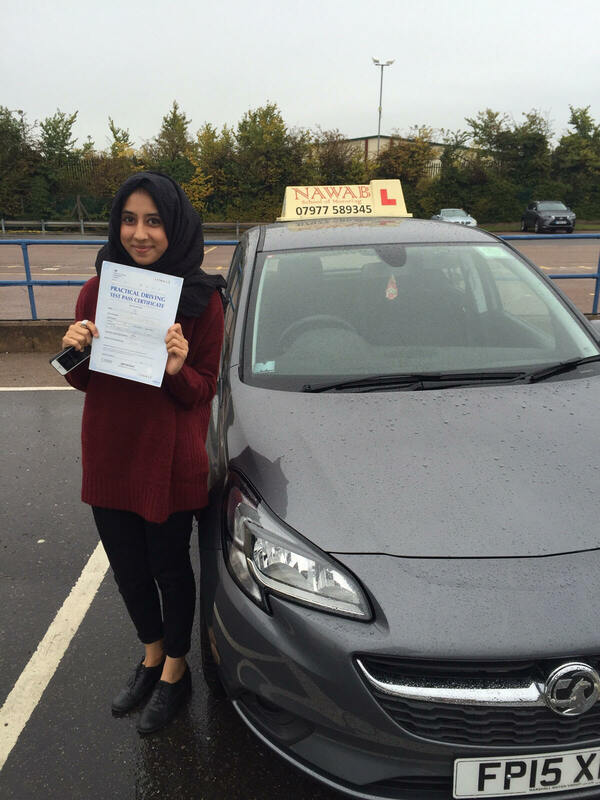 "I'm very pleased that I have passed my driving test and a big thanks to Mohammed Nawab . 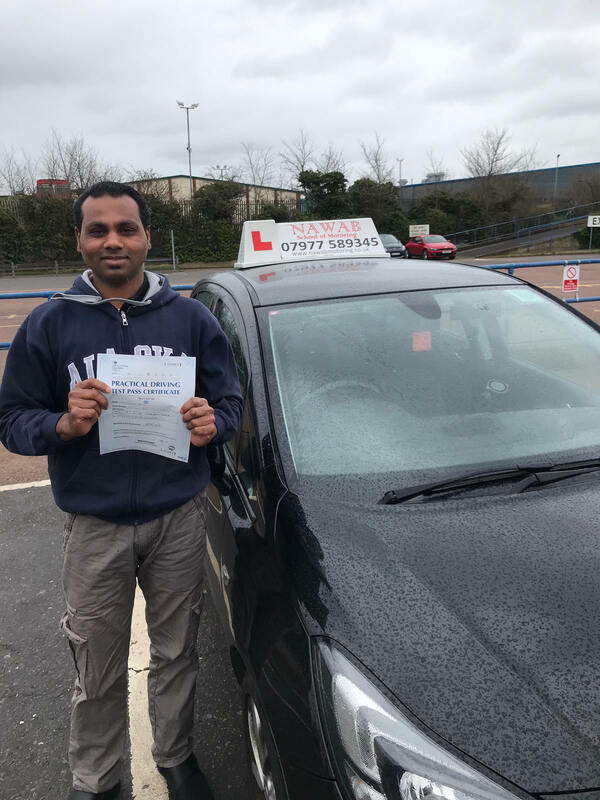 He is an instructor who is professional, punctual,calm and patience all the time which increasing my confidence in driving and also his teaching manoeuvre easy to understand for everyone. I would definitely recommended him to everyone. 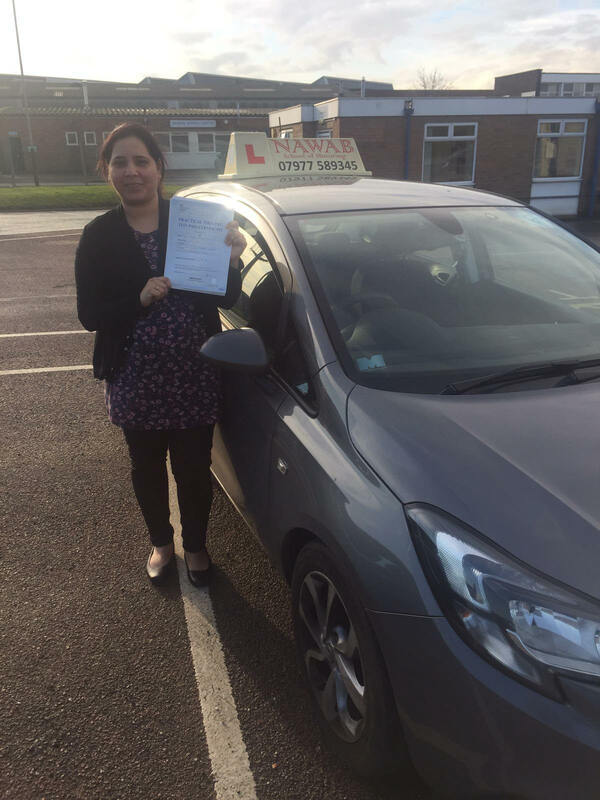 I passed first time from learning with Mr Nawab. 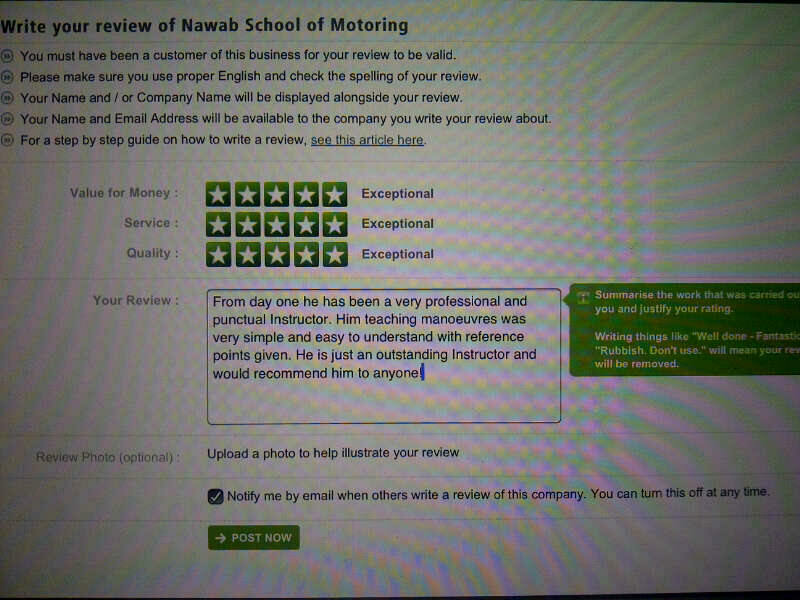 I chose to learn with Nawab school of motoring based on the good reviews and it certainly lives up to it. Mr Nawab is a very calm and confident teacher with lots of experience. I highly recommend learning with Nawab school of motoring. Today I am very glad and delighted as I passed my driving test in first attempt as beacuse of Nawab bhai. I was a bit nervous, always making mistakes but Nawab Bhai trained me very nicely, shown me how to do on perfect way. He supported me from the beginning. He is the best driving instructor. His advices, techniques always helps to drive safely. Excellent tutor with a huge level of understanding and patience. Nawab Bhai gave encouragement constantly, especially when I needed it most and was always prepared to help explain parts I was unsure of. Highly recommended. Again, brilliant instructor! 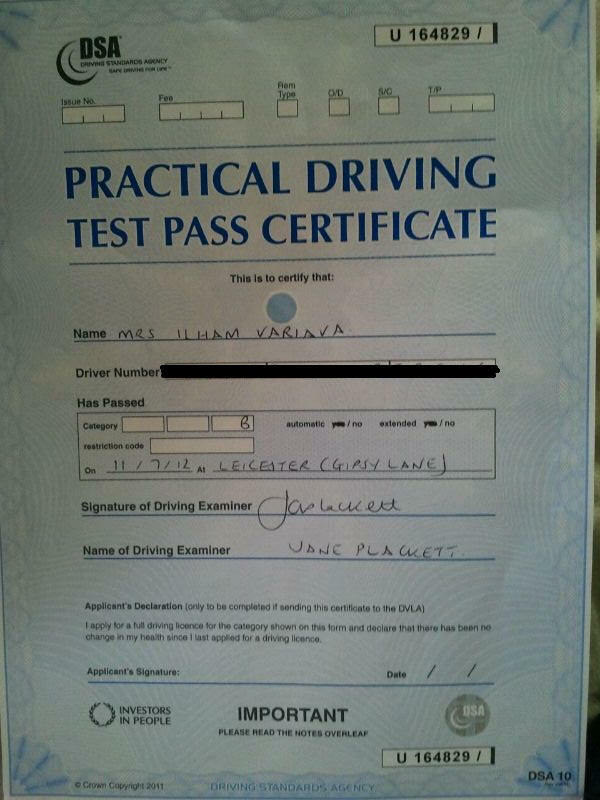 1st time pass. Mr irfan was one the best instructors I have met. The way he had approached me, his discipline towards teaching was exceptional. I couldn't ask for anything More. For once I thought I'd fail but he believed in me and thanks to Mr irfan I came out with a straight pass first go! Definitely recommend Nawab School of Motoring to others out there willing to pass. 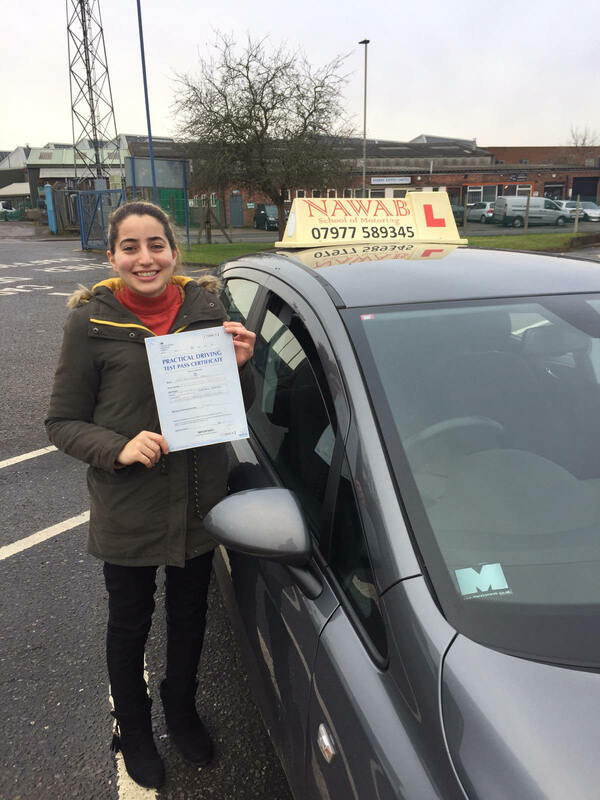 "Mr Nawab is an excellent instructor! I would highly recommend, he is a very experienced and professional teacher." "Very good teacher and easy to learn with and let's you learn at your own pace. 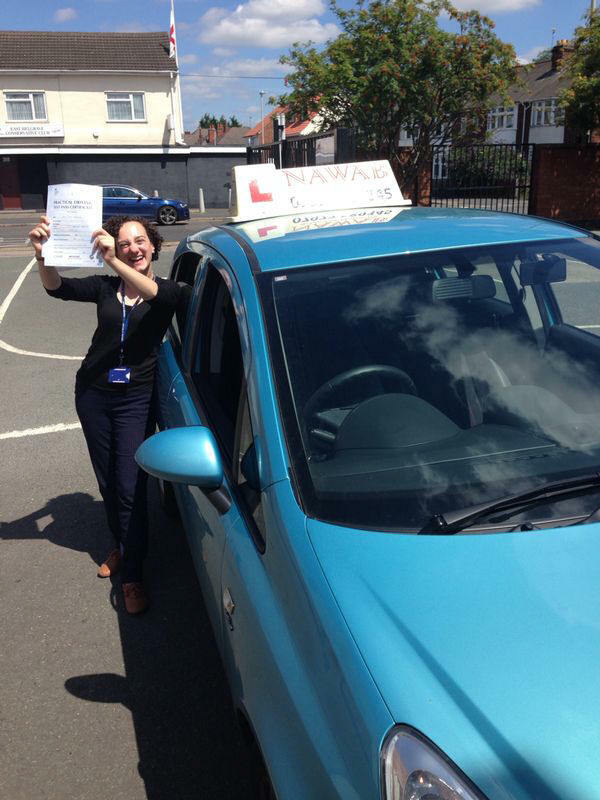 Cheap lessons and very good quality, passed first time because of this teaching." 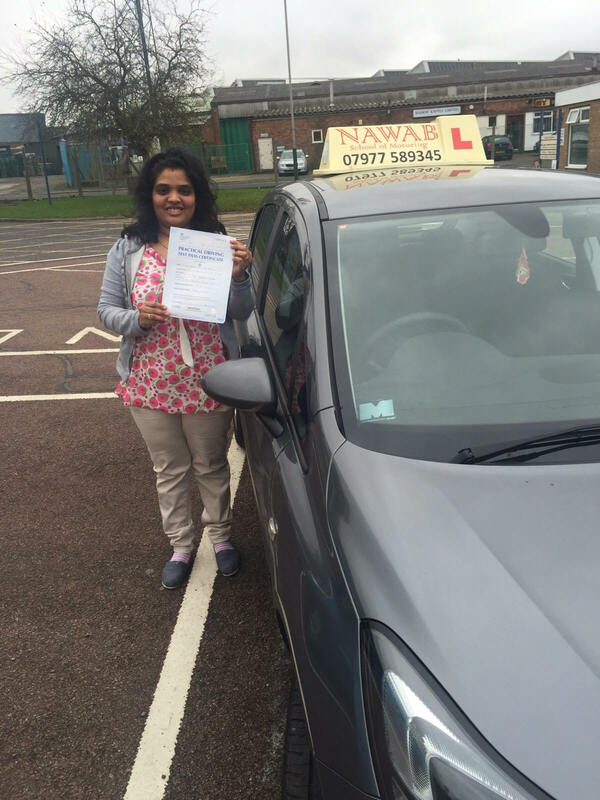 "Driving with Nawab school of motoring was the best thing I ever did. I failed before multiple times with other instructors and had lost hope of ever passing. However Nawab gave me confidence and I was able to finally pass. 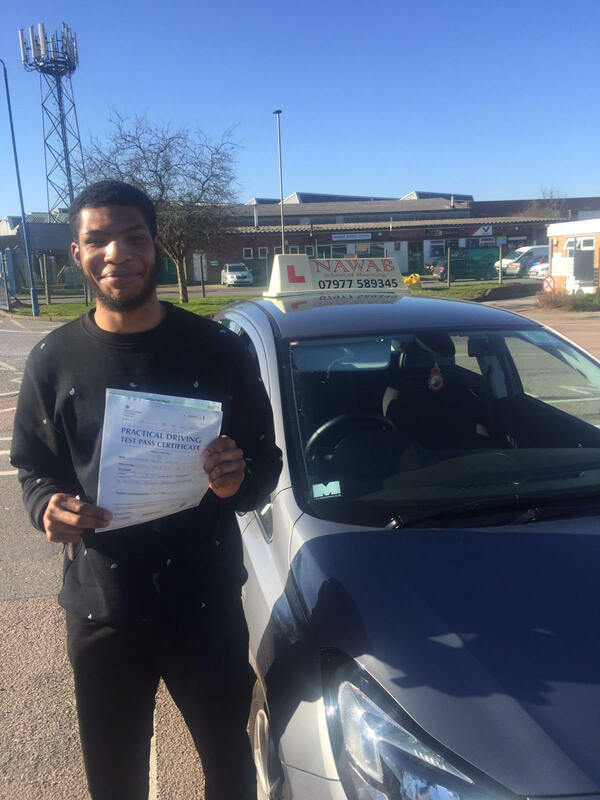 He's very patient and I would recommend him to everyone who wants to drive, and definately to people who are struggling to pass their test." 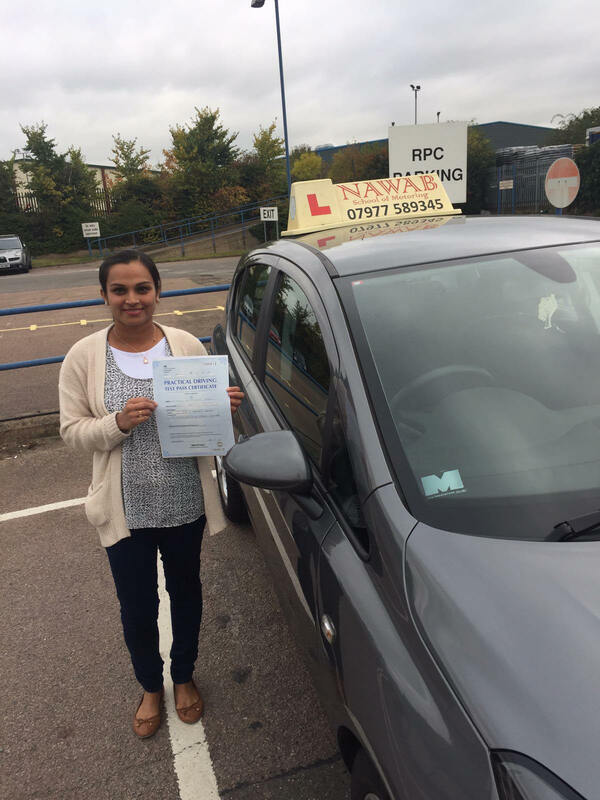 "Mr. Nawab was very patient and believed in my driving even when I didn't! Grateful to him for that!" 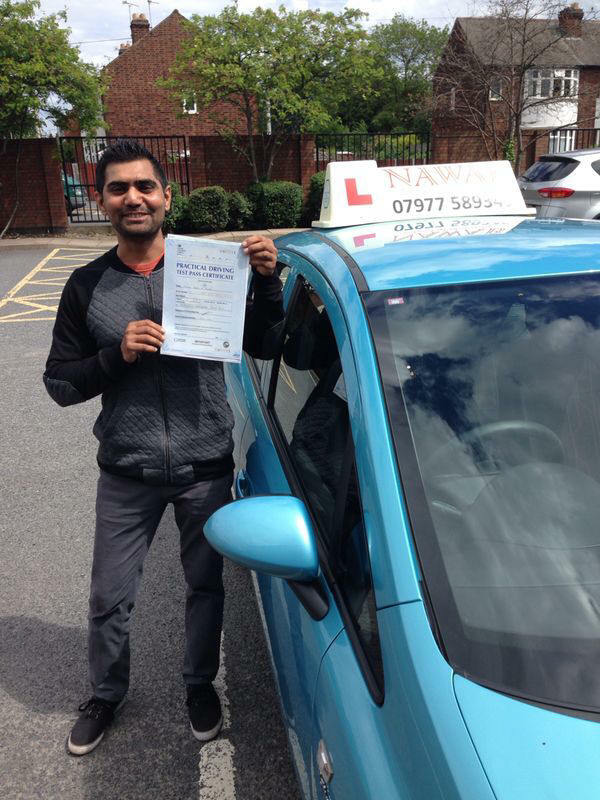 "Mr Nawab is a great instructor that helped me pass my practical driving test on the first time with ease. He is a very friendly and helpful instructor and he was able to adapt the lesson times to my busy schedule. I highly recommend him as a driving instructor." 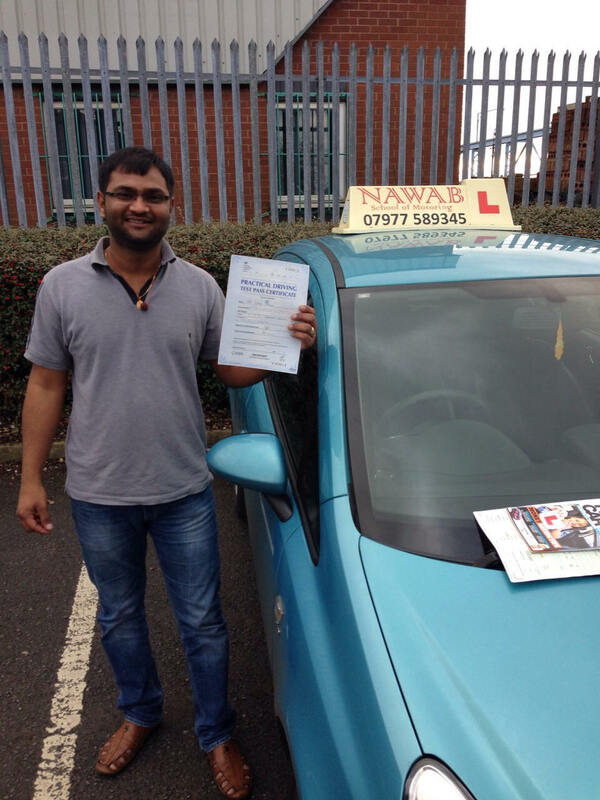 "Nawab is a great instructor and explains everything very well! I passed my driving exam first time and I could not be happier!!! I recomend his school to everyone." 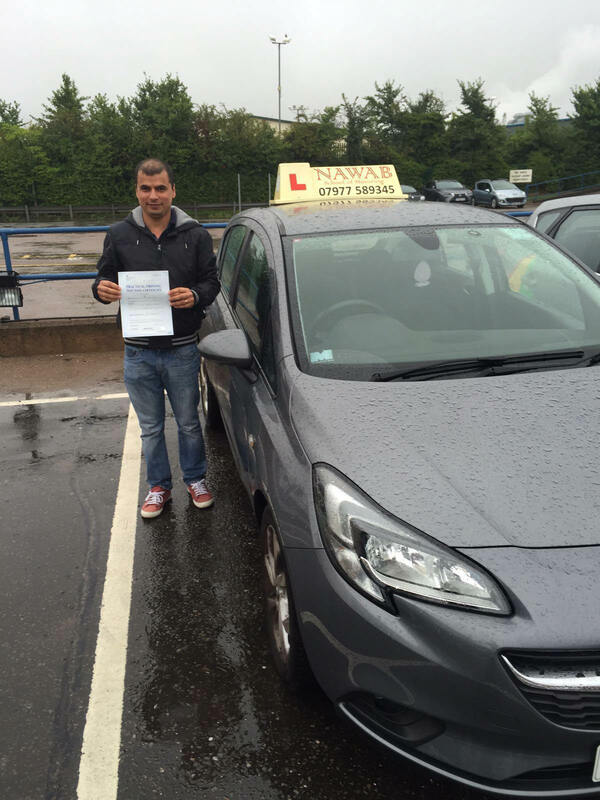 "Mr. Mohammad is a brilliant and kind instructor. 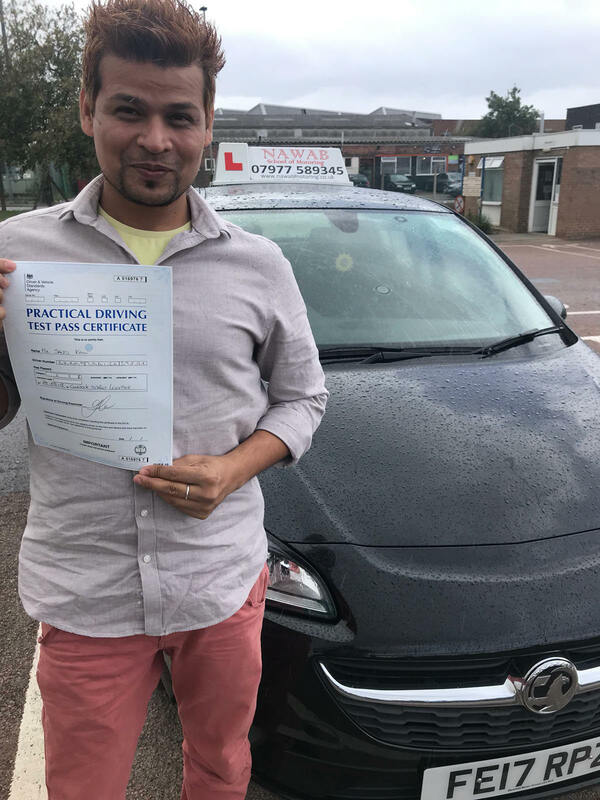 I am very glad to recommend that he is the best instructor for anyone want to do driving lessons as well who can learn friendly with him. Because previously I got lessons with another instructor and I was not satisfied with his lessons. But Mr. Mohammad did good lessons and forward me to test and passed soon. "He was fantastic teacher. He is highly qualified. I enjoyed the way he taught me. I would like to recommend him to anyone and I would like to say a big thank you to mr Nawab." 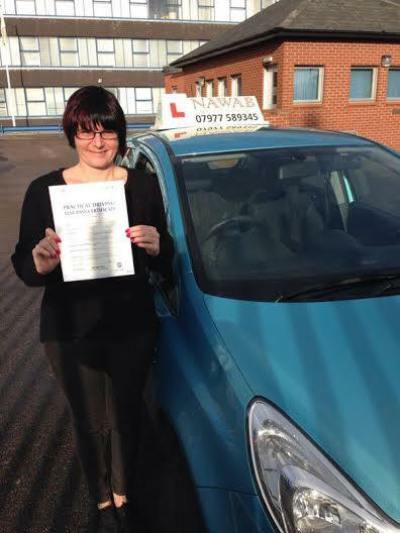 "Absolutely EXCELLENT instructor. I honestly thought there was no hope for me but I was proven wrong. 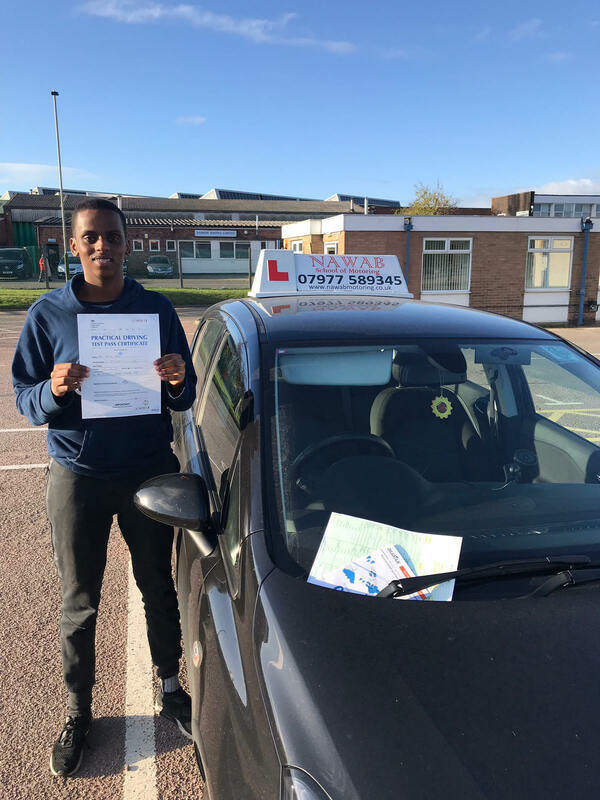 His patience and easy way of teaching had me ready for my test much quicker then I had expected and I passed first time! I'd often get confused but Mr Nawab did a great job of breaking things down where I didn't understand and politely repeated them each time I needed reminding. I definitely did myself a favour by choosing to learn from him." "Mohamed, I PASSED BECAUSE OF THIS LEGEND! No matter what kind of day you're going through, he will offer you some oranges to put/keep a smile on your face; Throw back to one of the first lessons I had with this instructor, he asked me if he could go and do his praise, I told him yes cause I wanted him to pray for me too if I would to crash the car, (of course he made up times afterwards), believe it or not I have not made 1 single scratch to his car and that's because of his perfect instructions, this guy could teach you to become a professional F1 driver if he wanted to, people says his a little pricey but you can't get Diamons the same price as Gold, would recommend him to anyone, absolute beast, top notch!" "I used to drive an automatic for a couple of years in India, had an accident and stop driving since. I moved to UK n decided to learn driving a manual car. I had a fear of driving aswell as lack in cordination with the gears. Thankfully I decided to take lessons with Mohammed Nawab. He is an extremely dedicated teacher. He sorted out all my driving issues in a very step wise manner. As we got along with the classes he paced up the speed so I never felt lyk he was dragging the lessons or wasting my time. Very flexible with timings which was great especially since I started work in between and had crazy shifts. He simulates every lesson like a test so you dont feel intimidated on the actual day. He points out every minor mistake not just to pass the test but to turn you into a safe driver for the rest of your life. Very relaxed environment to learn with him. Good car to practise in. 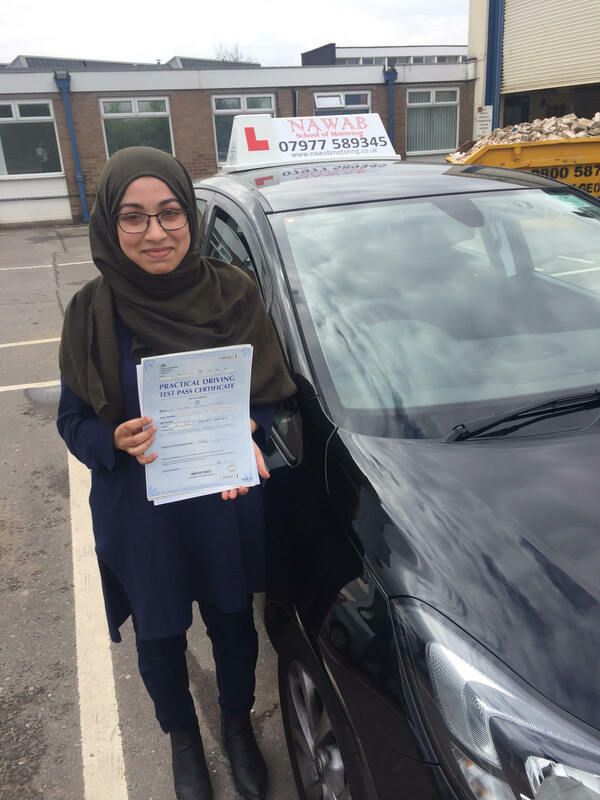 All in all if you need to get your license ASAP and be a SAFE driver then stop thinking and join nawab school of motoring." "Excellent instructor, helps you learn from your mistakes. Very cheap lessons. Quality 1 on 1 time. Highly recommended." 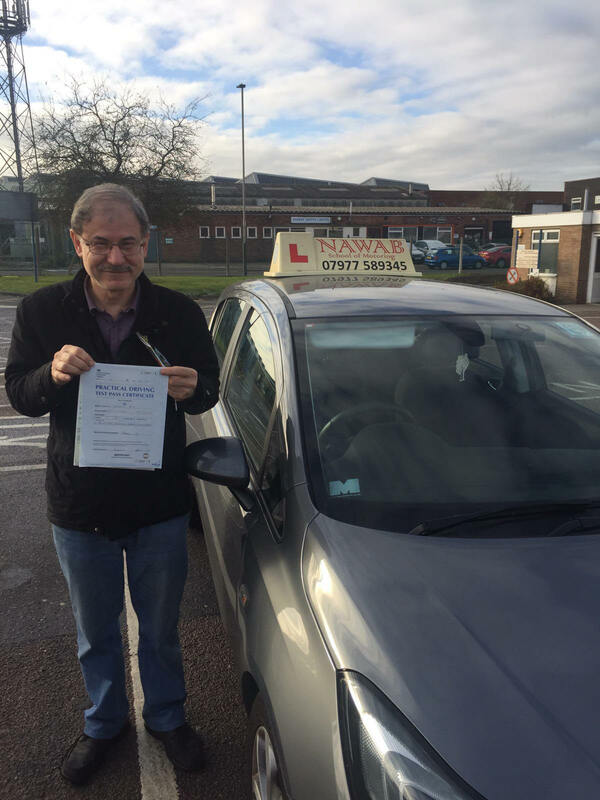 "Fantastic, patient instructor who didn't mind going through things more than once if I wasn't quite sure. 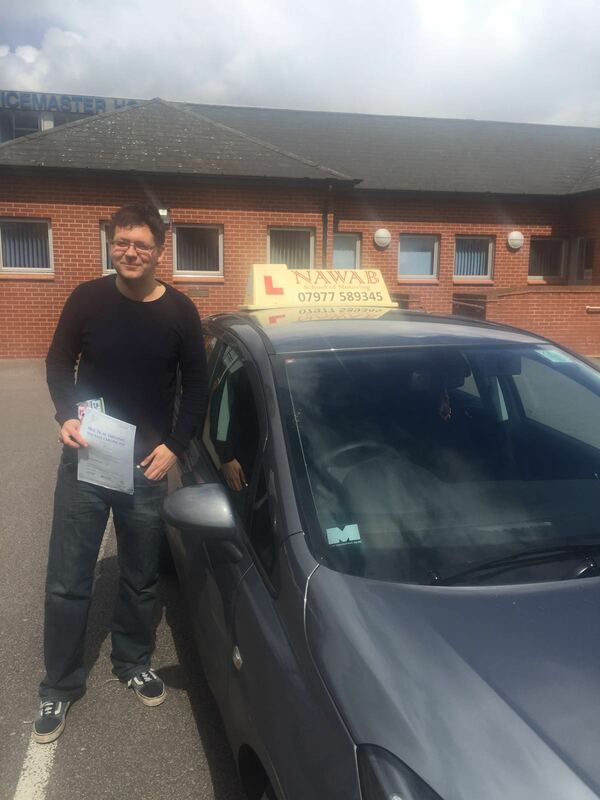 He helped me become a confident comfortable driver and I passed first time with only one minor, thank you!" 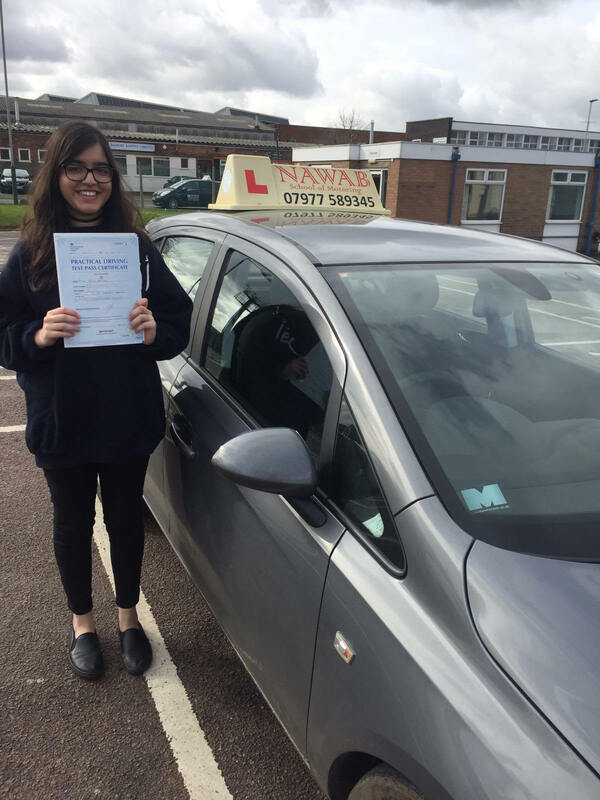 "He's an excellent instructor, who within a span of two months helped me to pass first time with no faults or errors what so ever. 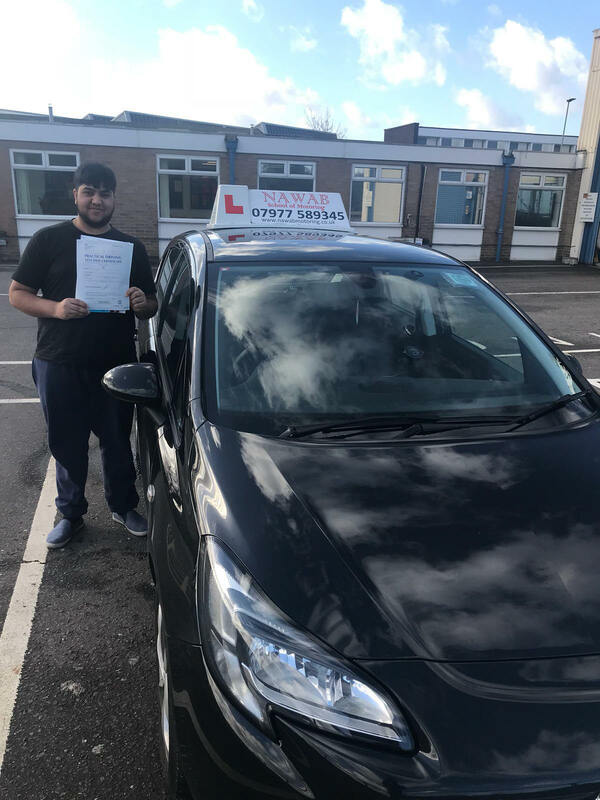 I'm really pleased I chose to learn with Nawab and will highly recommend to others who want great value for money and just a fantastic instructor"
"Today it was my driving test but I was a little bit nervous and worried about the driving and I PASSED and also I only got 5 faults but because I passed I am very happy about it. 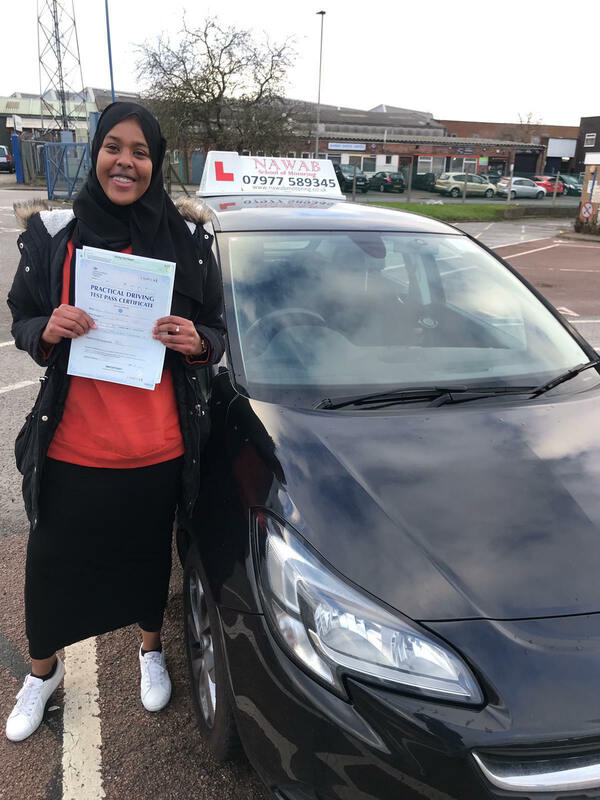 I passed because my driving teacher was very good and told me how I had to improve my faults but still I got 5 faults and that's ok for me!" "Nawaab is very professional and patient. 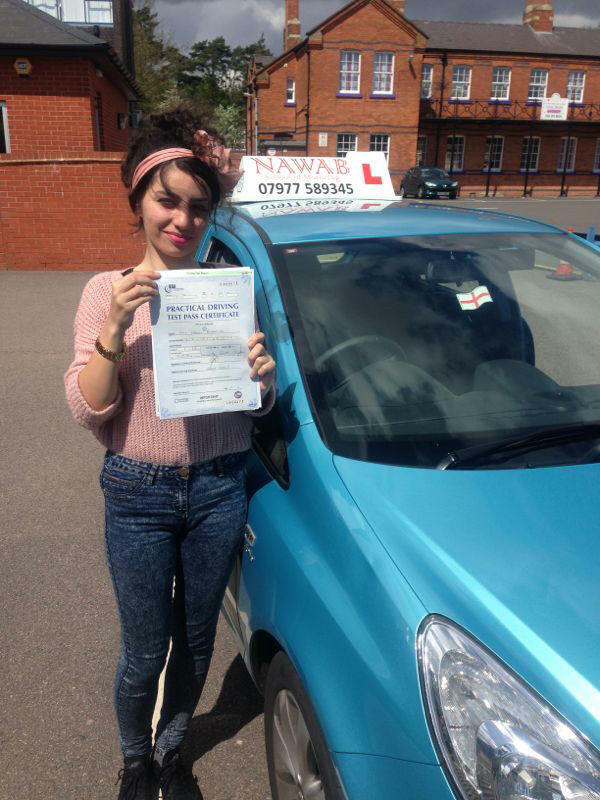 21 lessons after and a very pleased driver/learner. 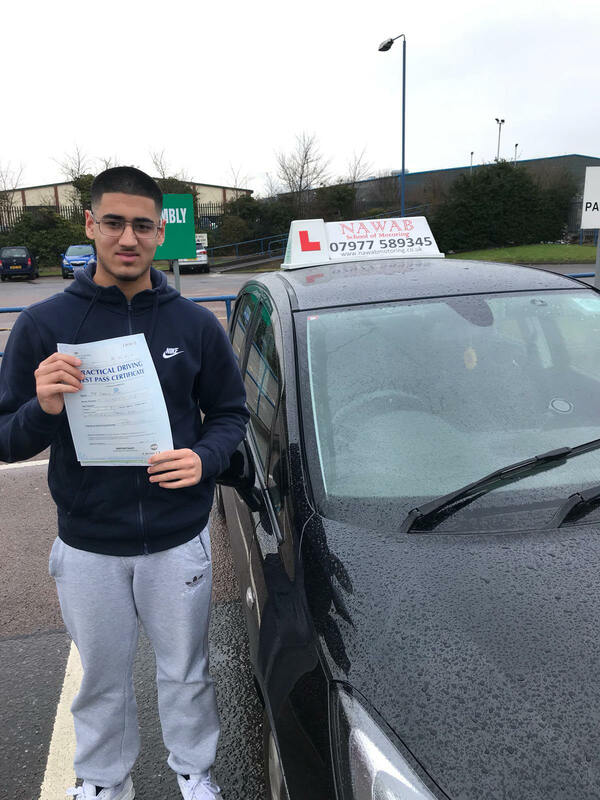 Throughout my lessons Nawaab was very patient and assessed my driving every step and made me feel comfortable behind the wheel . 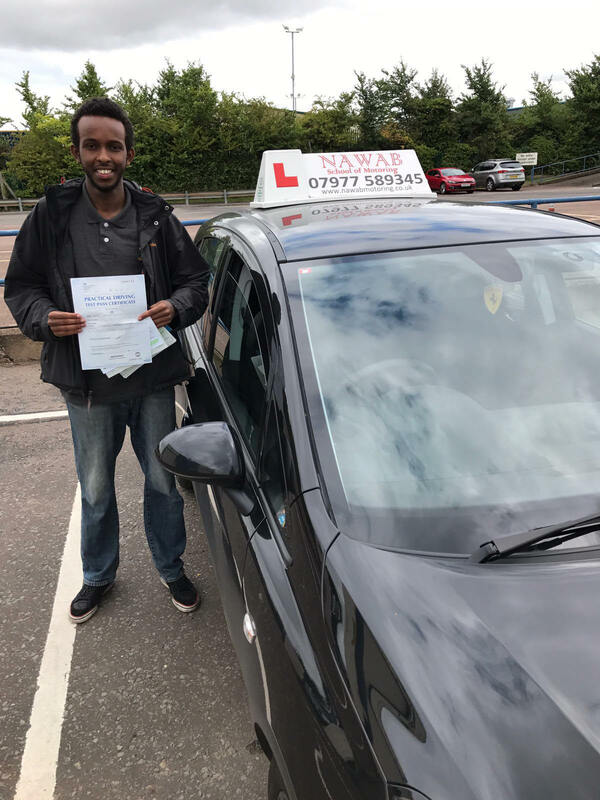 Very informative and friendly I would highly recommend Nawaab and I am confident that anyone who learns from him will pass first time. 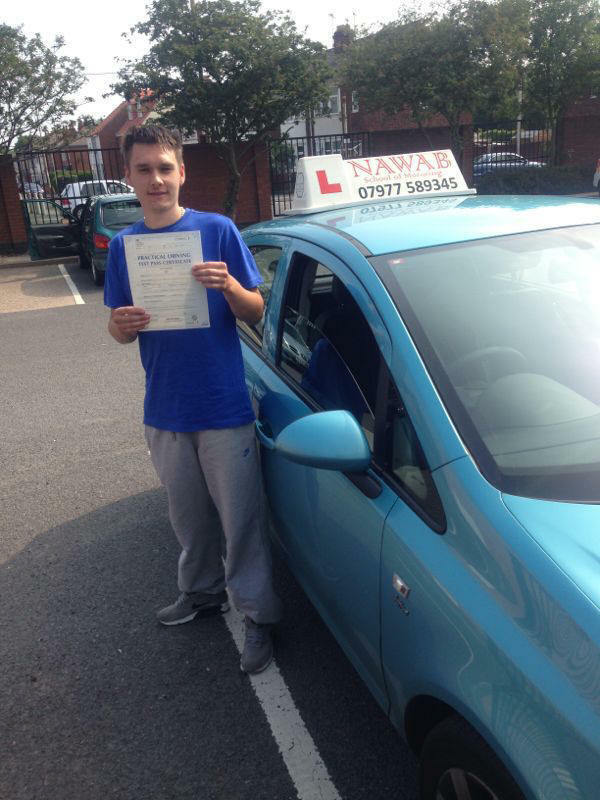 Thank you Nawaab and I am very happy that I passed first time and knew so during my lessons that I was confident." 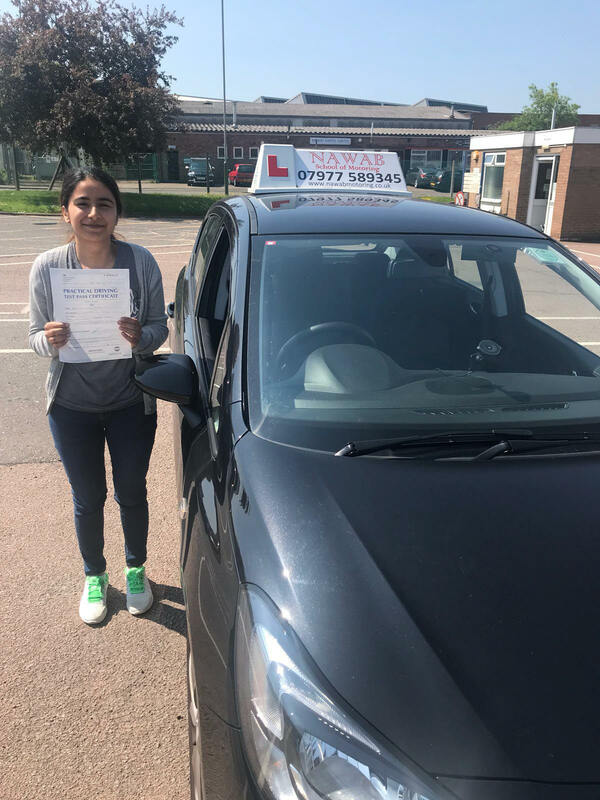 "I am very pleased to have passed my test with Nawab School of Motoring, I would like to give a big thanks to Nawab, who was a brilliant instructor , his notes was very useful and helpful. 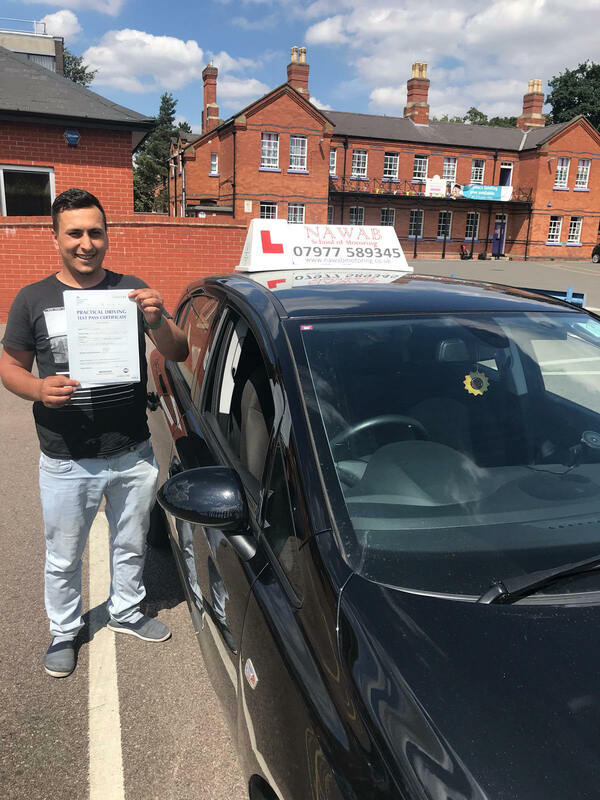 Mr Nawab he is very friendly and made me feel confident in the car, his knowledge and experience gave me the skills I needed to pass my test. If you’re planning on driving Nawab School of Motoring is the best of the best." 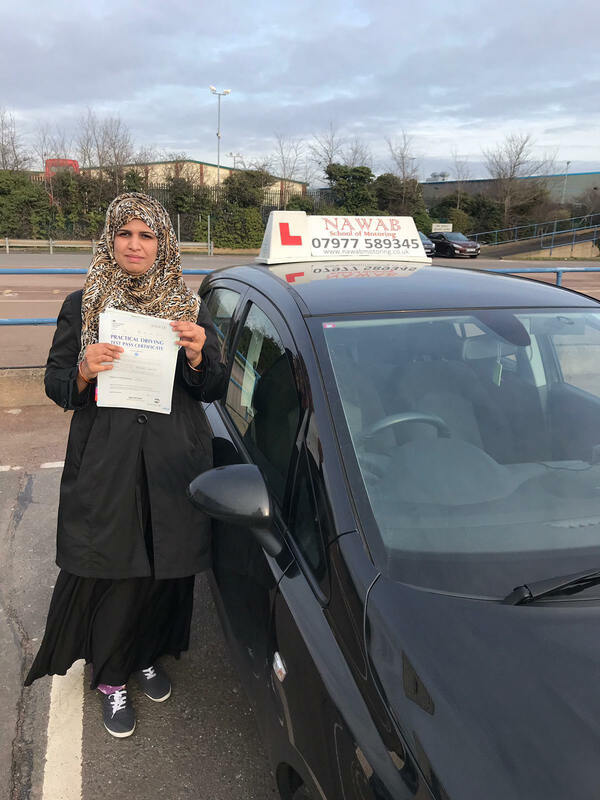 "I passed my driving test today in second attempt.I literally would say Mr Nawab is an excellent teacher .I really struggled with my instructor in the past with whom i just was losing money and learning nothing but i thank God for the day i chose Mr Nawab as my instructor as he made me pass straight away in my first practical attempt with him.he was very humble ,always encouraging and very supportive.He took my test as his responsibilty.Taught me all test routes and driving rules like a real teacher should and literllay helped me cover each and every weakness in my driving.Dont have words to thank you Sir.Would recommend to all my friends and everybody who is struggling with instructors as most of them are robbers"
"Mr Nawab is very friendly, patient, calm and very supportive driver instructor. I was a student who used to drive at 15mph and did not have the confidence to drive. He has always believed in me and from the very beginning encouraged and supported me throughout my journey. I absolutely recommend him as my sister and her best friend have also passed with him. 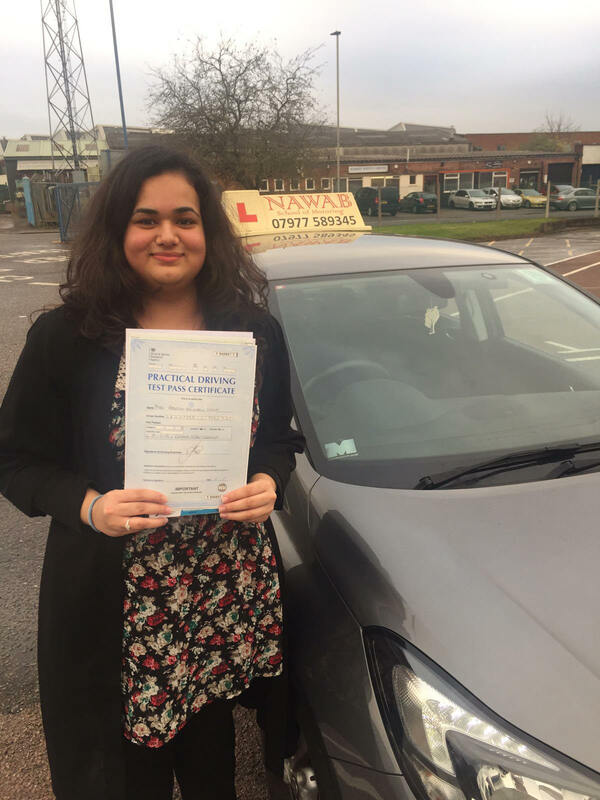 If it wasn't for Mr Nawab I wouldn't have passed the first time." 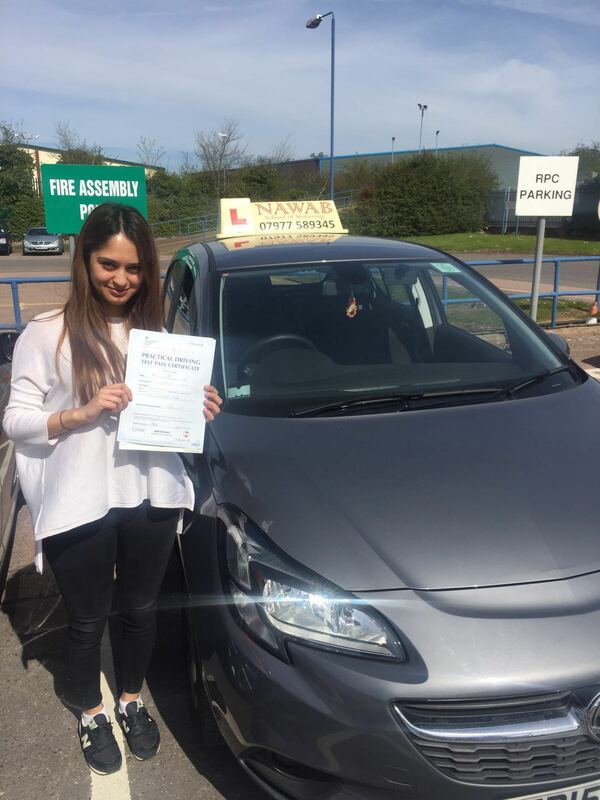 "I would have not passed my driving test the FIRST time if it wasn't for Mr Nawab. I was surprised by how calm and incredibly patient he was during lessons - if I did a mistake for the first or twentieth time, he would always encourage me and never raise his voice. His lessons were always enjoyable and I looked forward to them every week. Mr Nawab's teaching is very methodical and makes sense from the first time. I do not have enough good things to say about Mr Nawab, and he will always be my number one recommendation for anyone who needs a driving instructor. Thank you very much Mr Nawab!" "Nawab is by far one of the most patient guy ive met. He kept patient all through out the time. He is also very experienced which is very important. I am so gratefull and lucky to have had Nawab as my instructor. Thanks." 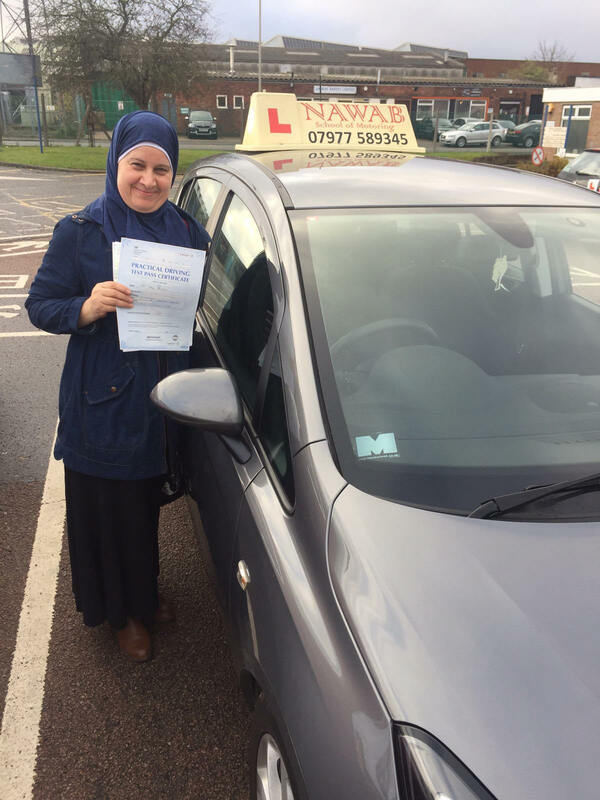 "I started my driving in Feb 2016 and very pleased to have passed this year too all thanks to Nawab School. With very detailed, precise and safe instructions I learnt how to drive safely. I was taught everything properly in order also was able to gain so much confidence on the road. 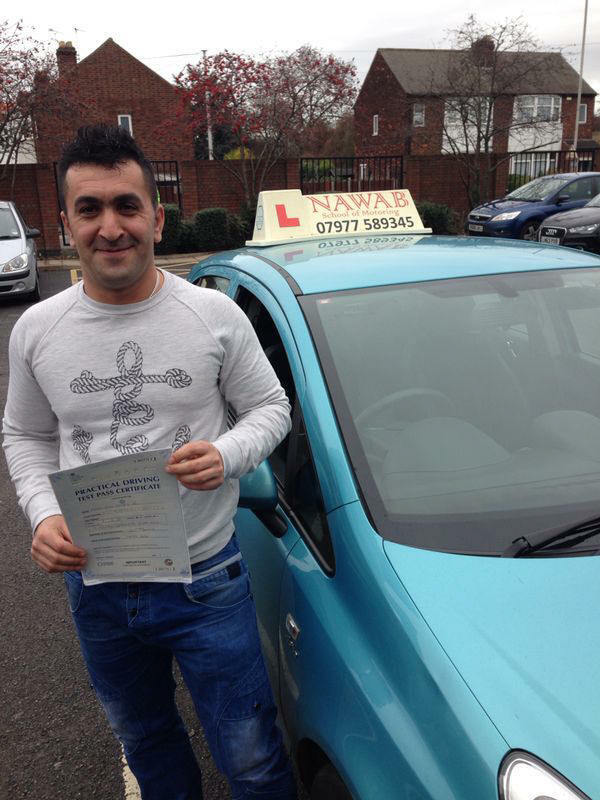 Very pleased and I highly recommend Nawad School of Motoring and hes a great teacher!" "Many Thanks to Mr. Nawab for help me to pass my prectical test . He is very Supportive, calm, and patient I just recommande him for every learner. Hassan Aziz." 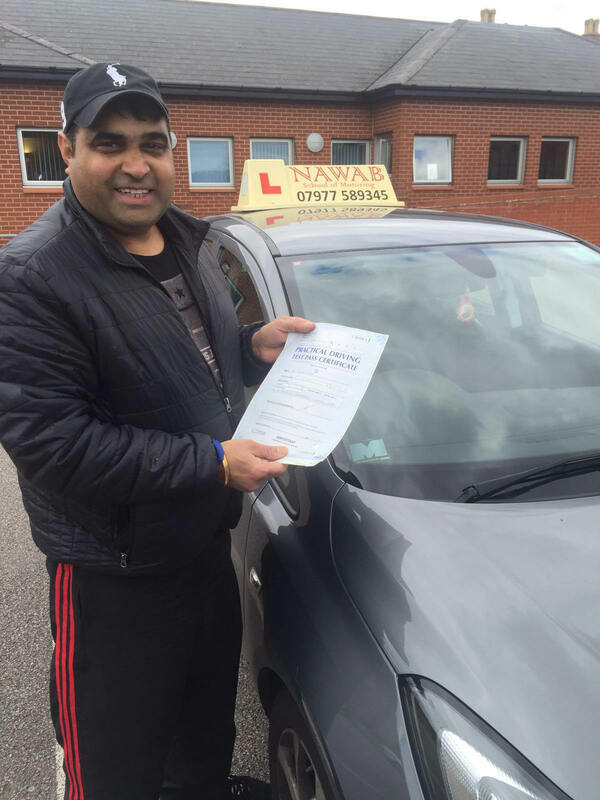 "Mr Nawab was an excellent driving instructor. His method of explaining road safety and rules was very clear, and I was able to pass the test in no time at all. His lessons are very enjoyable! I highly recommend him to anyone." 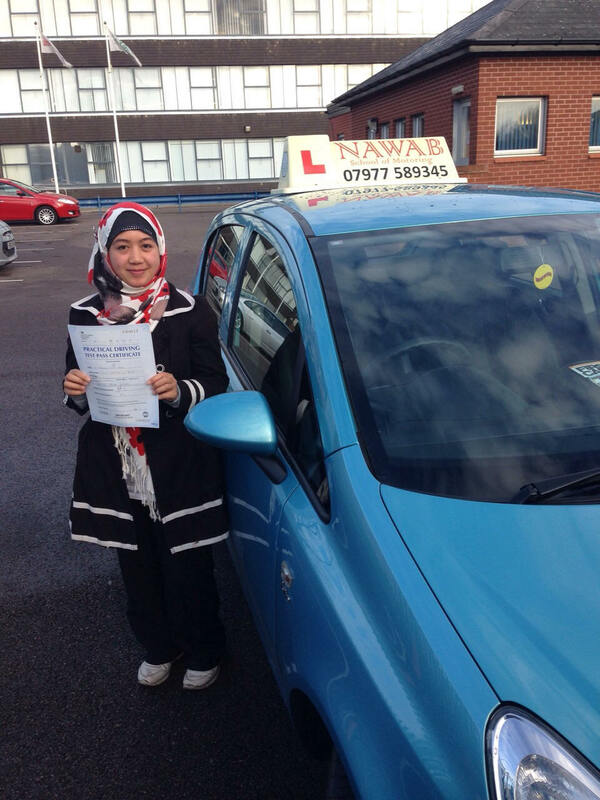 "Mr Nawab is an excellent instructor. He's reliable, punctual and very patient. Mr Nawab made lessons fun and interesting and I would definitely recommend him. If your looking for someone who's easy to get along with, makes learning to drive fun and keeps you relaxed then Nawab is your guy." "Fantastic instructor! 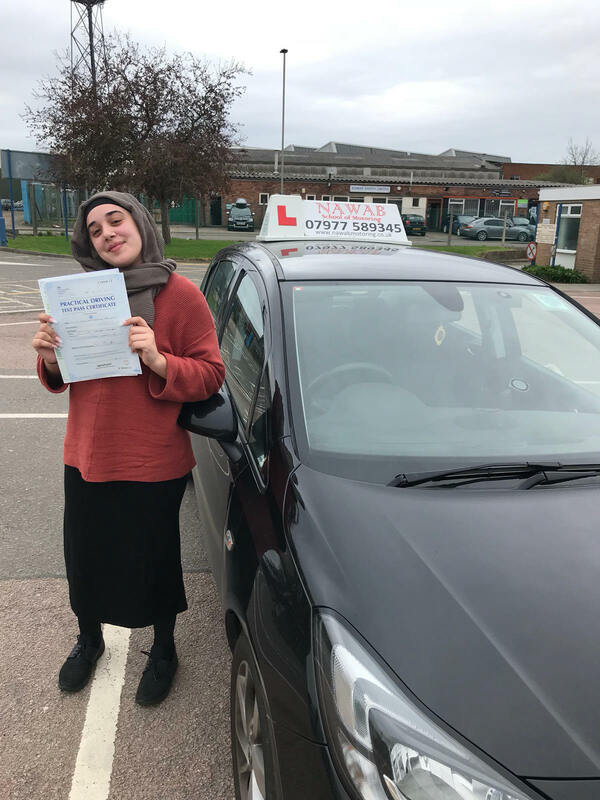 I failed a couple of times with different instructors and my friend passed with Nawab and she's told me he's great is I thought I'd try it out and I passed!! Never felt so happier as I never thought I would pass as I never had an belief after failing 6 times. Nawab was brilliant and believed in me. 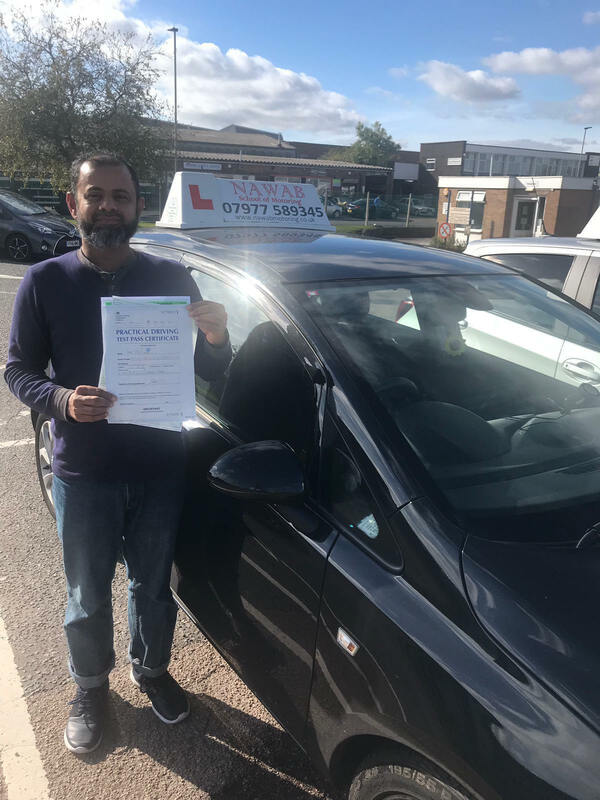 Nawab always helped me and would tell me where I would go wrong, best instructor and I could have never passed without him, so much praise and highly recommended to all!!" "Many Thanks to Mr. Nawab for help me to pass my prectical test for first time. He is very Supportive, calm, and patient I just recommande him for every learner. Many many thank again." 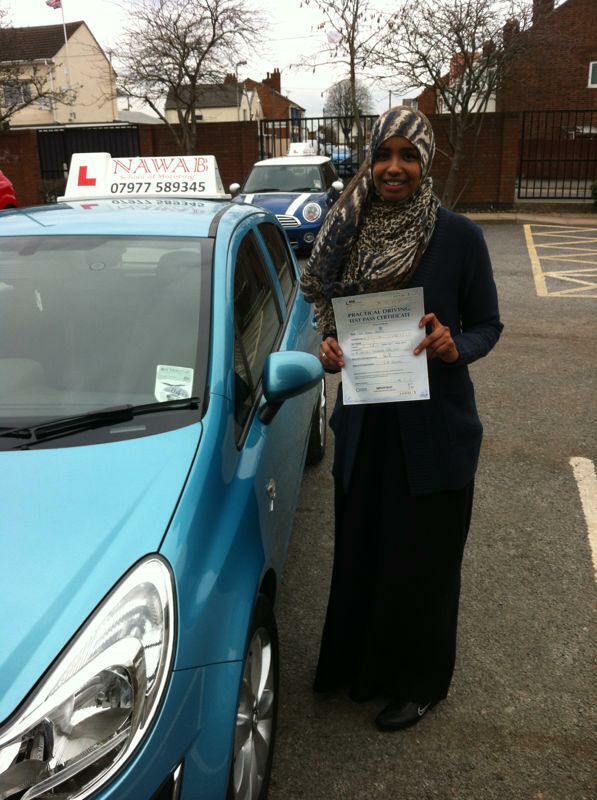 "Thanks to Mr Nawab I passed my driving test first time! I had absolutely no confidence and was always nervous. However, Mr Nawab remained patient and gave clear explanations even when I made the same mistakes multiple times. 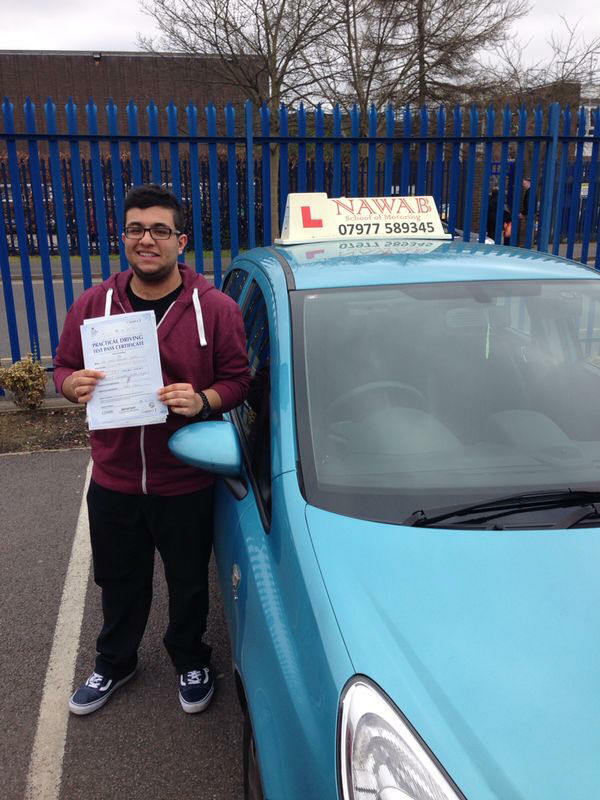 Would recommend Nawab School Of Motoring for anyone who wants to learn to drive safely and pass first time." 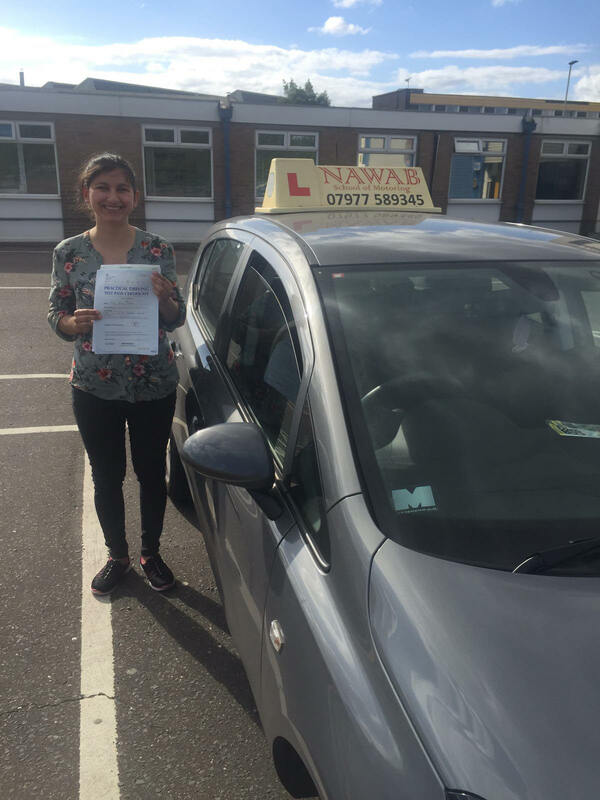 "I have had quite a few instructors, however Mr Nawab was the best one. Very patient and calm guy, so helped me feel at ease when taking my practical test. He assured me I would pass, and I did. If you want to learn to drive perfectly, he is the instructor to have." 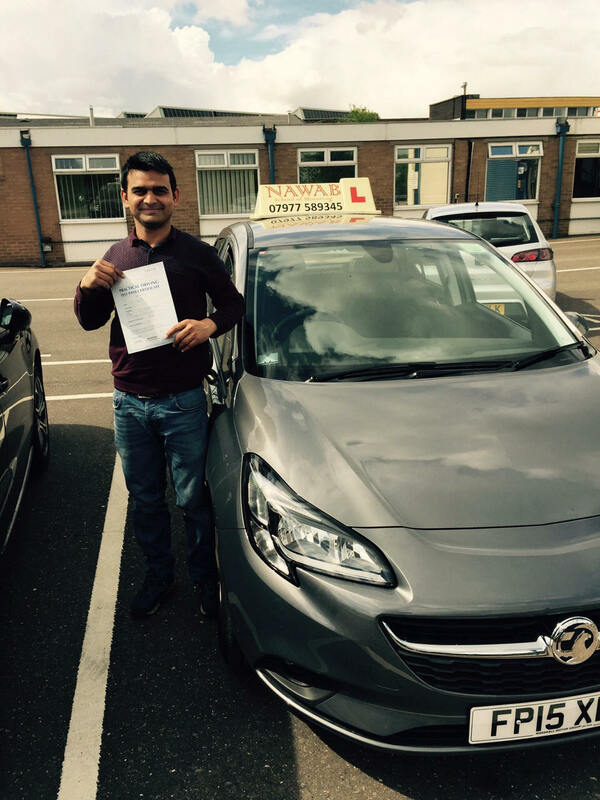 "I just wanted to say a big thank Mr. Nawab for all your knowledge and experience which enabled me to pass my test. 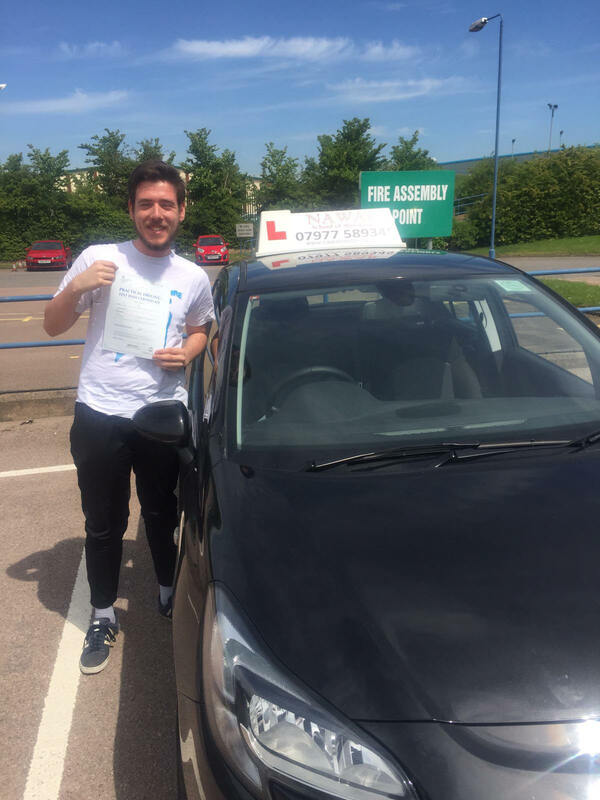 Your driving experience was valuable from the beginning in making me feel at ease and confident in my abilities to drive the best i can. If anyone looking for an instructor who will teach you well but also treat you with respect I waould strongly recommend Mr. Nawab to absolutely every new learner." "yayyyy. 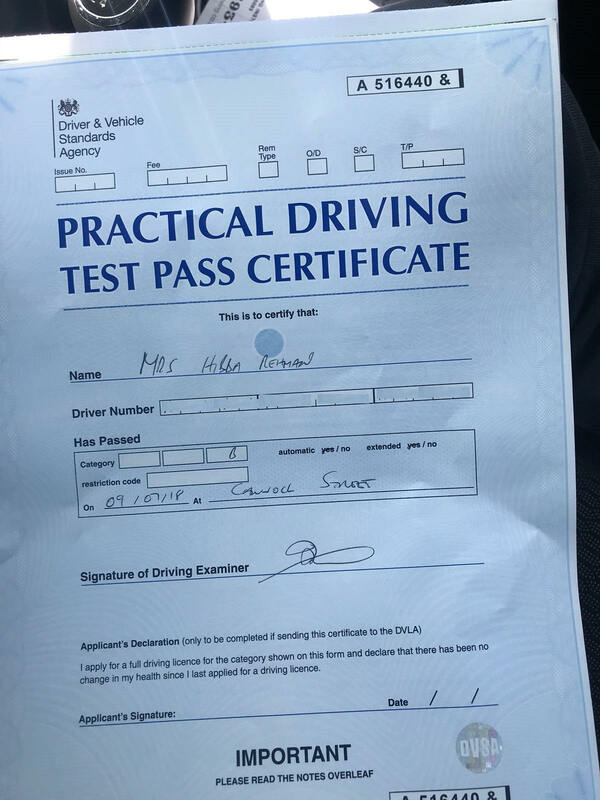 I passed my test first time with no minors at all. couldn't thank Mr Nawab enough. I was so ready for my test I felt confident because of how he taught me. I know two people who have passed with him first time aswell. and Ive already recommended him to someone else I know. excellent teacher couldn't of done it with out him. thank you soooooo much!!!!!" 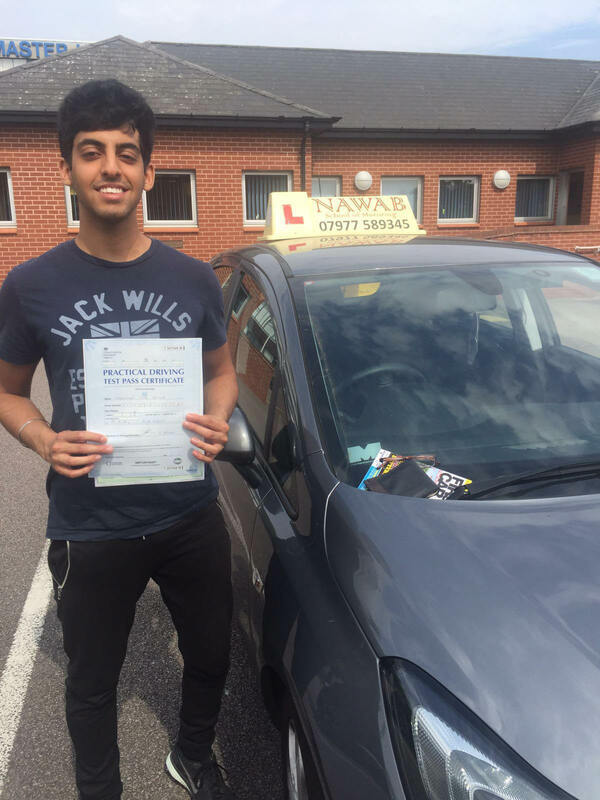 "Nawab was incredibly helpful and helped me secure a first time pass! He was calm and collected and this allowed me to really progress as a driver. The show me/tell me resources were greatly helpful and made the show me/tell me part of the test incredibly easy. Thank you Nawab !" 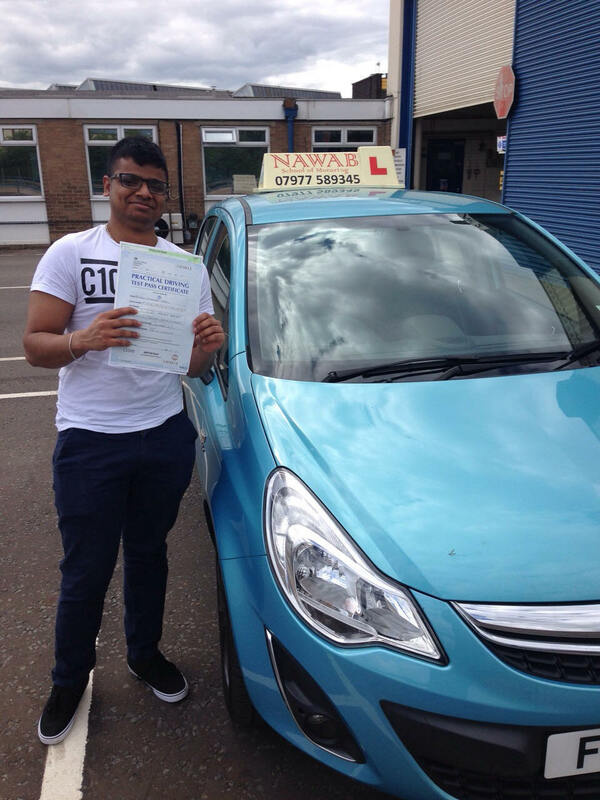 "A big thank you to Mr Nawab for helping me pass my test! Mr Nawab offers patient support and encourages you to learn independently, so you are not relying on your instructor. I have recommended Mr Nawab to my friends in the past, who have also passed with his help and have enjoyed his style of teaching. Also, Mr Nawab makes effort to ensure you understand what you are doing before doing it, and includes diagrams which make understanding easier. 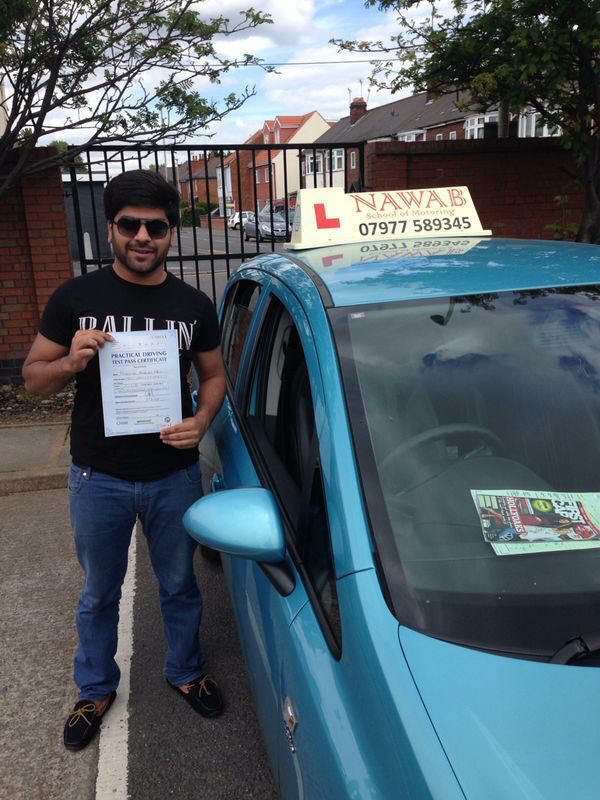 Thanks to Mr Nawab and I would definitely recommend Mr Nawab to anyone who is learning to drive!" 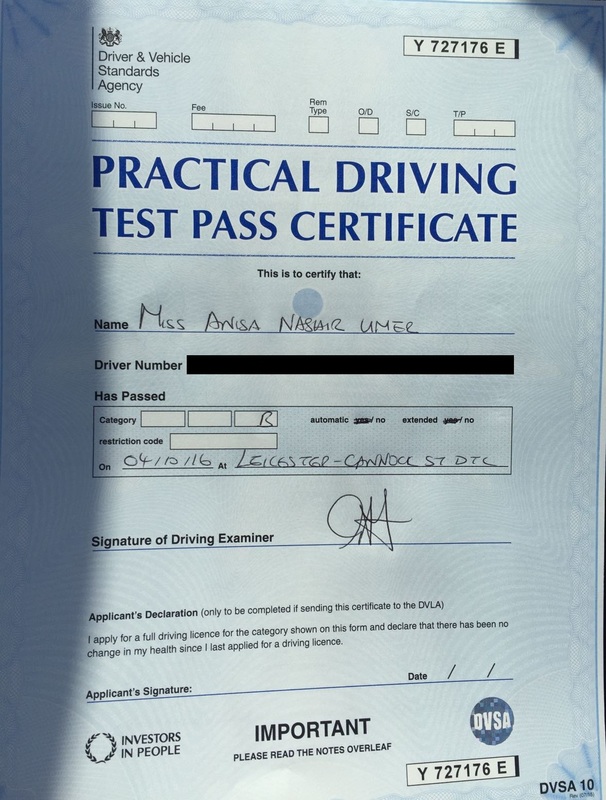 "I had passed!!!!! thanks to mr nawab he is very friendly instructer I was taking lesson from another instructer but I was not confident with my driving he used to scold me for very minor mistakes rather than encouraging me to drive properly than I started lessons with nawab and within very short period i started believing in my driving i was confident he really bring the best out of me i believe he is the best instructer." 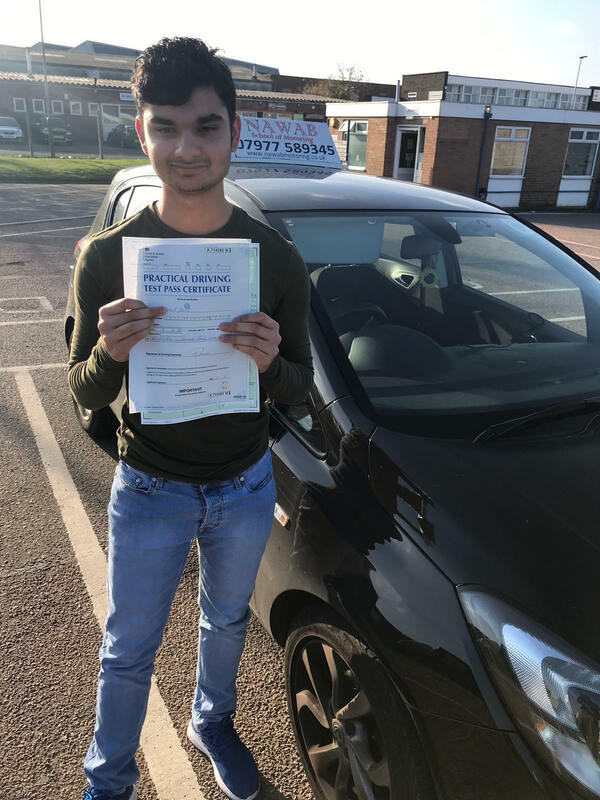 "A big thank to mr nawab for helping me pass my driving test successfully,first time.He's very patient and will encourage you to bring the best out of you.I will definitely recommend him to people.Best driving instructor in leicester,thank's"
"Mr Nawab is a great driving instructor and thanks to him, I managed to pass my test FIRST time! I 100% recommend him to everyone. 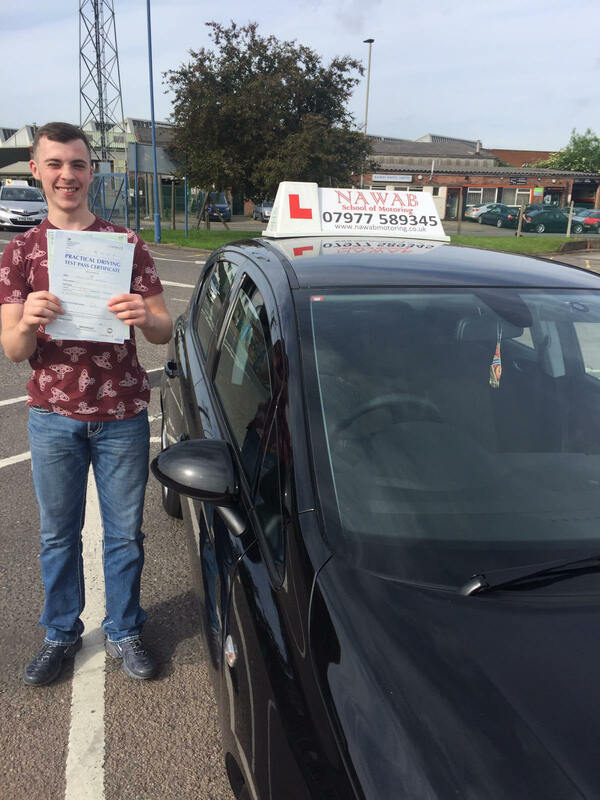 He will make you feel at ease, explain things very clearly and you will end every lesson feeling more and more confident in your driving." "I have passed !!! 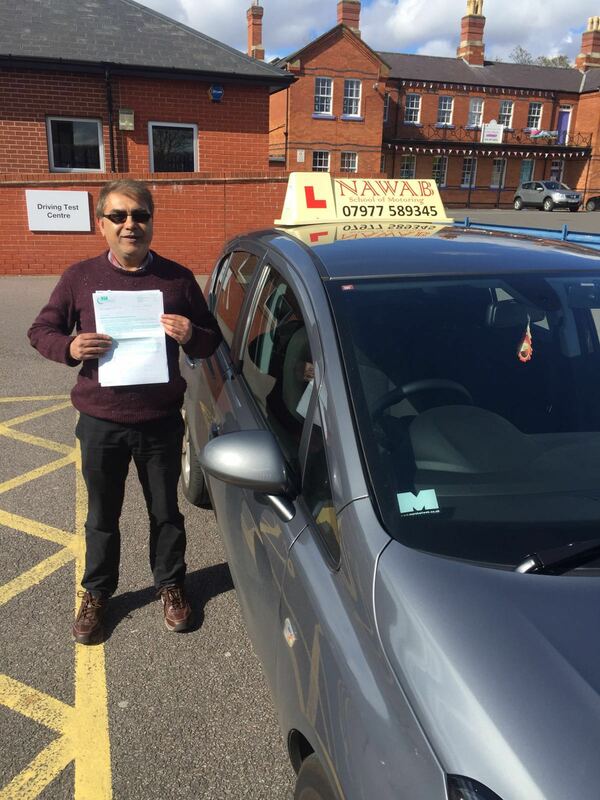 thanks to mr nawab who's an excellent instructor. I would recommend him to anyone because he's patient and fun to learn with. I would give him 100/100. 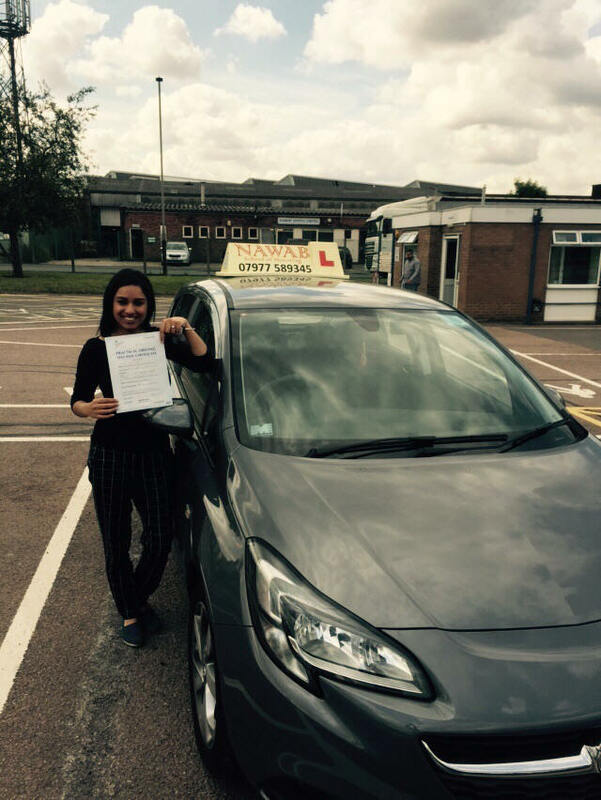 Best driving instructor in Leicester and England." 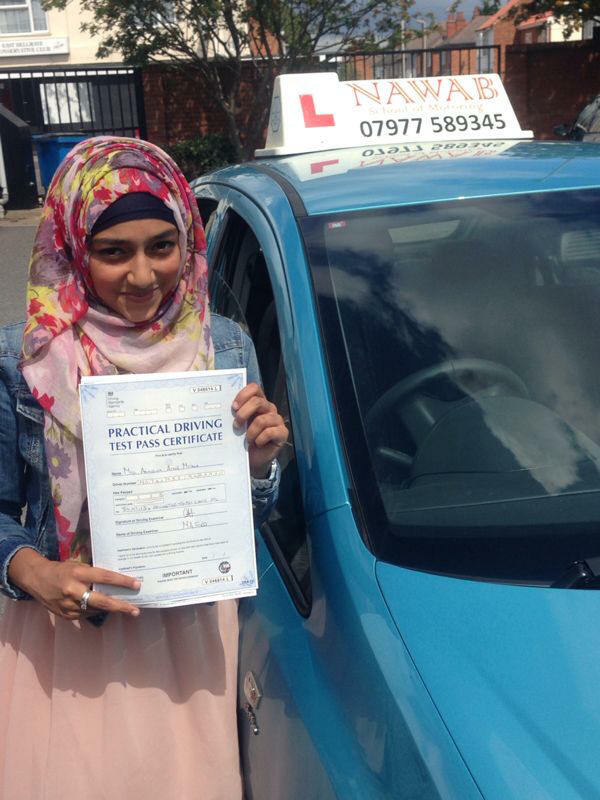 "I have passed my ADI part 2 driving test with Nawab, it was a joy taking my lessons from him. He has always given me the right advice and his instruction very clear and always had different methods to make me understanding if I did not the first time. A very palliate and passionate person, never lost his temper and gave up on me, I highly recommend him to others. Thank you for bearing up with me." "A big thank you to nawab. He was the best driving teacher I've had with learning to drive over the years. Always knew what to say when I was nervous and unconfident. He was excellent with teaching me the manoeuvres. Also very reassuring especially before the test and never gave up on teaching me, leading me to pass my driving test first time!! Thank you for all your hard work. Strongly recommended!" 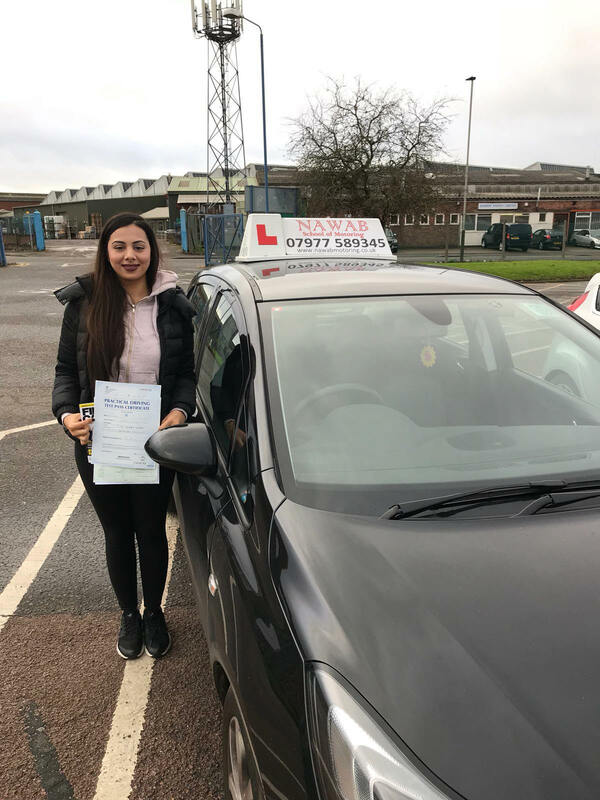 "I have been through quite a few driving instructors and couldn't quite get the right driving instructor as all lacked confidence in my driving. Learning to drive alongside Mr Muhammed Nawab has been the best decision I made. 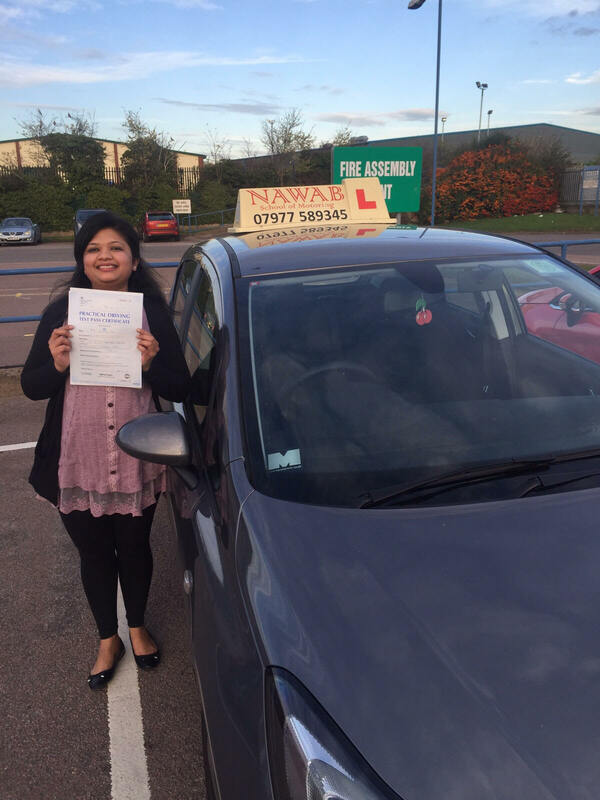 Before learning with Nawab School of motoring I was a very scared and nervous driver which was my biggest problem. Mr Nawabs approach to driving is one which I would recommend to anyone. 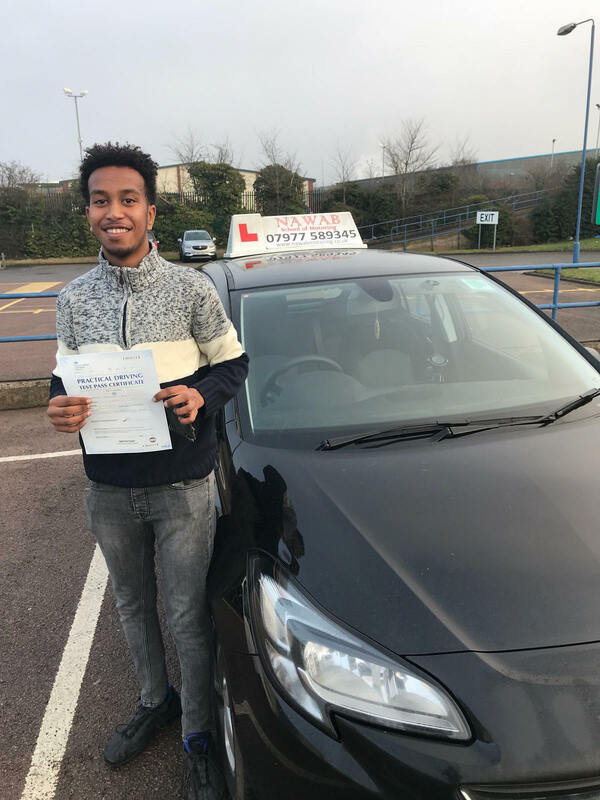 He has not only taught me to drive in a calm manner but also taught me to believe that I can do it, this enabled me to pass my driving FIRST TIME. I can not thank you enough. Thank you so much!!" "I found Mr Nawab to be a professional and a talented teacher. When I started I had no idea how to handle a car and thought 20 MPH was too much to handle, but now I enjoy driving immensely and felt confident driving by myself on complex roads just last weekend. I'd certainly recommend him to new drivers." 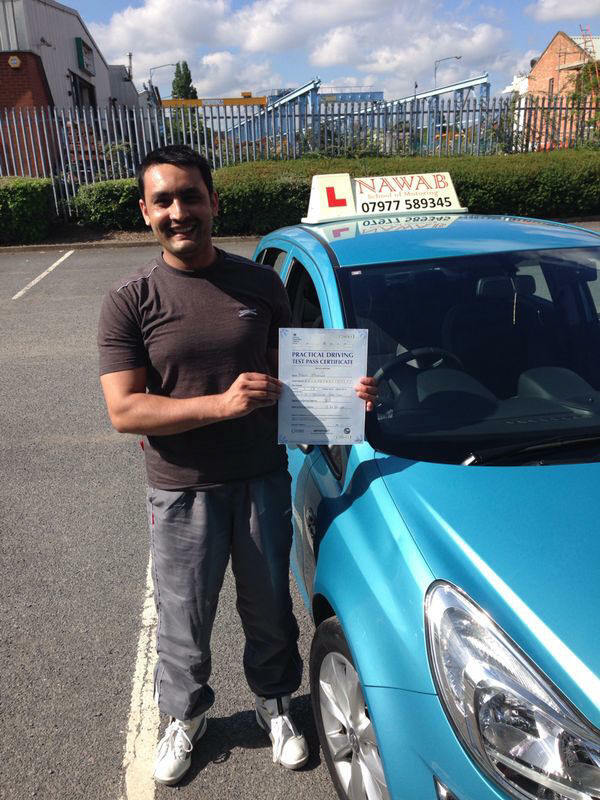 "Thank you to Mr Nawab for the continuous support and help which helped me pass my driving test, first time. Will genuinely miss him, great guy and very helpful. 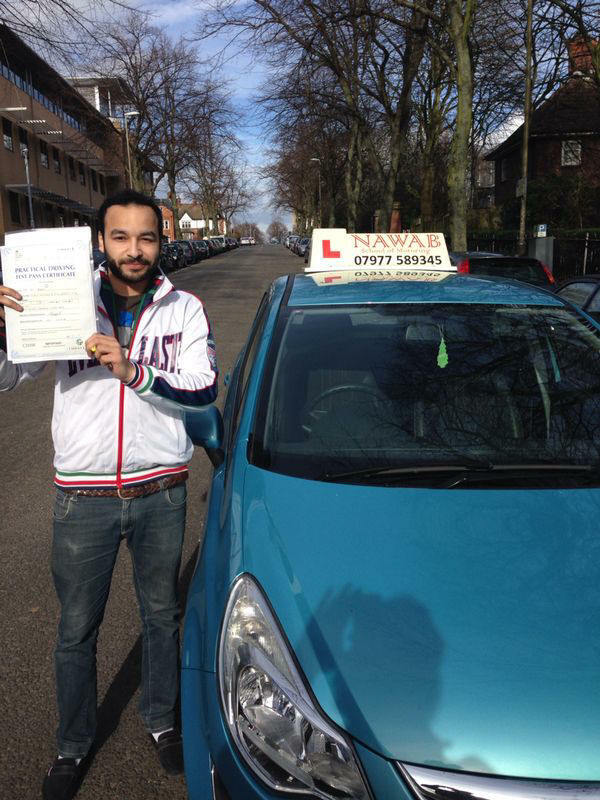 I would recommend Mr Nawab to anyone who is looking for a good driving instructor." 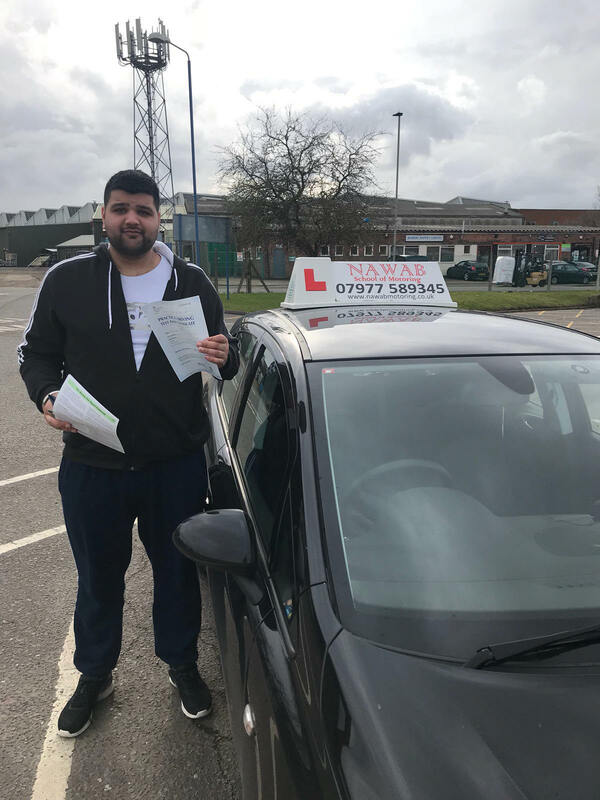 "Very good instructors &very frindly I highly recommend nawab made lessons very easy to understand he good experience all test root and you can pass very easy so I highly recommend him to anyone call to nawab driving if want first time pass I m happy pass test today…thanks nawab." 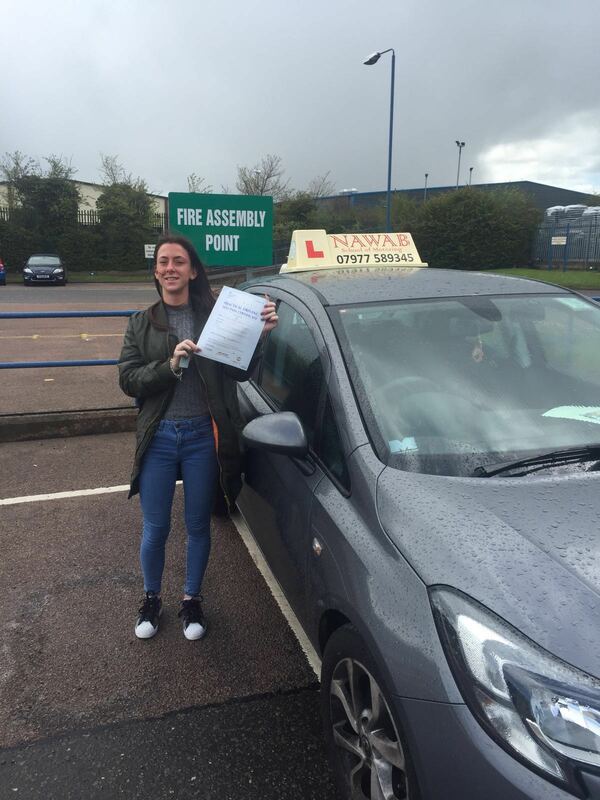 "Firstly, just want to thank you for helping me pass my test. 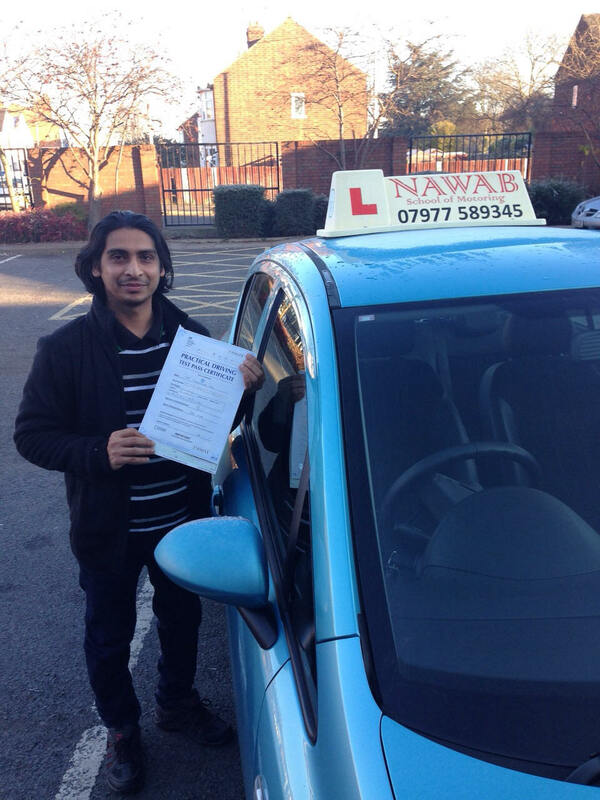 Nawab made lessons very easy to understand and is a very good instructor. I've changed instructors and glad I did as I felt most ease with him and found his instructions the easiest to follow! Thanks again and Would highly recommend him to anyone." 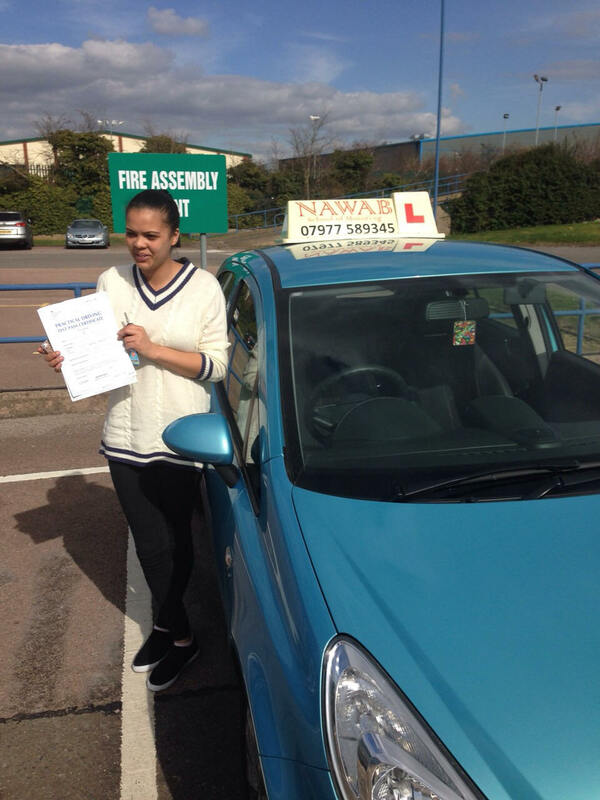 "Mr Nawab is a brilliant instructor. 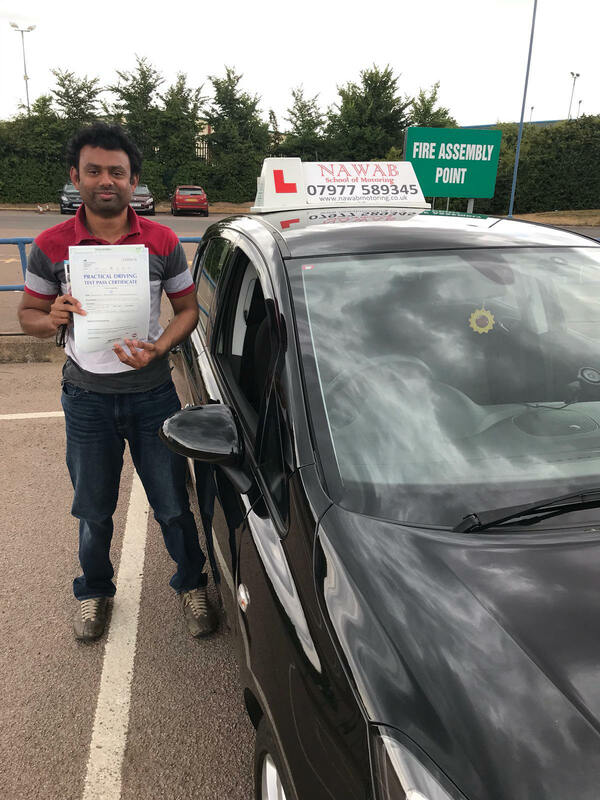 I enjoyed every lesson learning with nawab, his instructions were straightforward and if I ever made a mistake he reassured me as to what I had to do, never making me feel stressed, and making me a confident driver on the road. 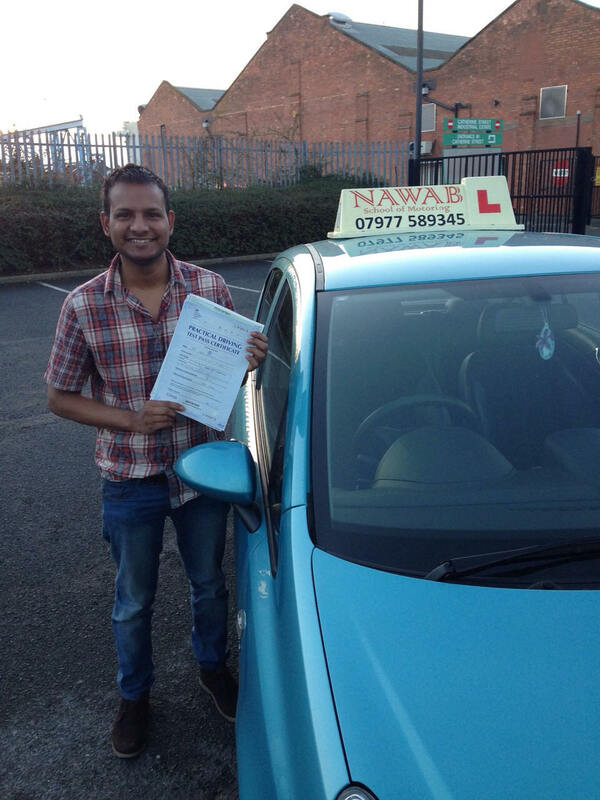 Thank you for very much helping me learn to drive, I highly recommend nawab to anyone wishing to learn. How to drive." "Highly recommended, very professional and extremely patient. 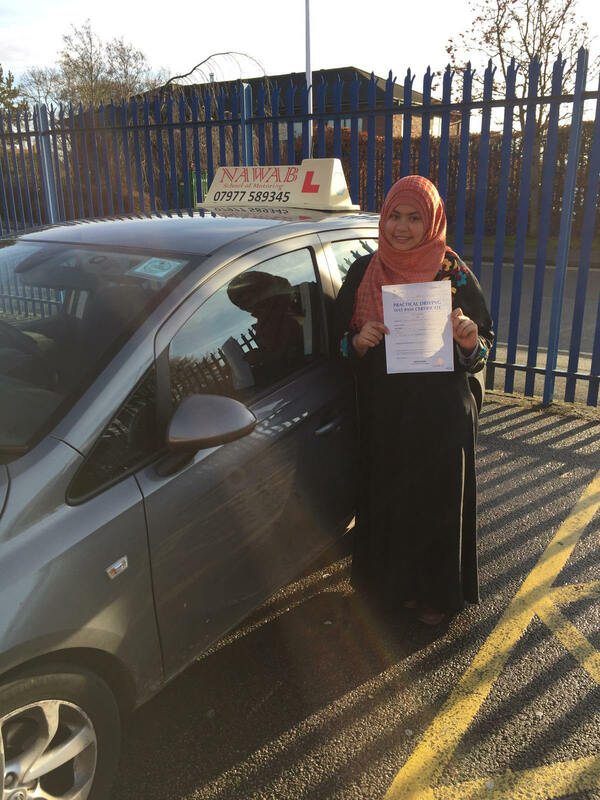 Jazakallah (thanks) for helping me pass FIRST time and making my lessons full of laughter. You made my experience of learning pleasant and gave me confidence when I needed it the most." 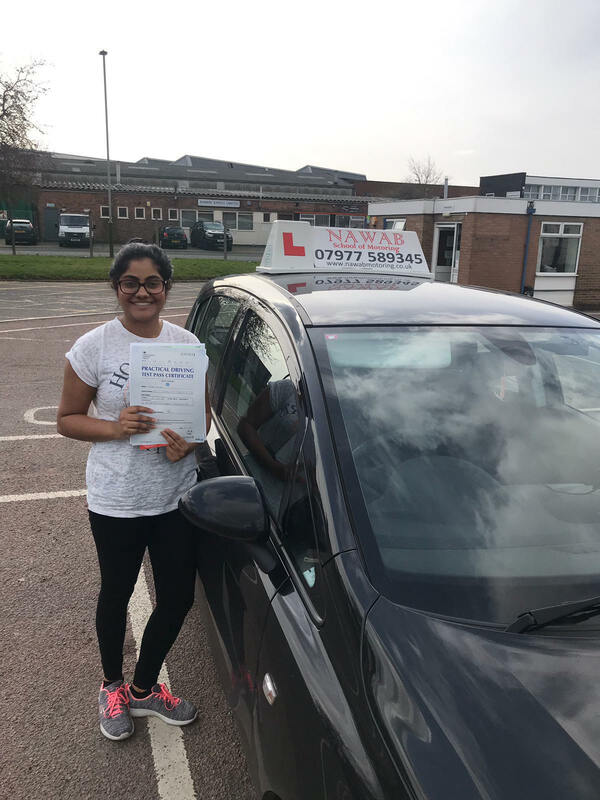 "Great driving instructor, was patient and was able to explain things very well, would definitely recommend new drivers to Nawab school of motoring if wanting to pass first time." 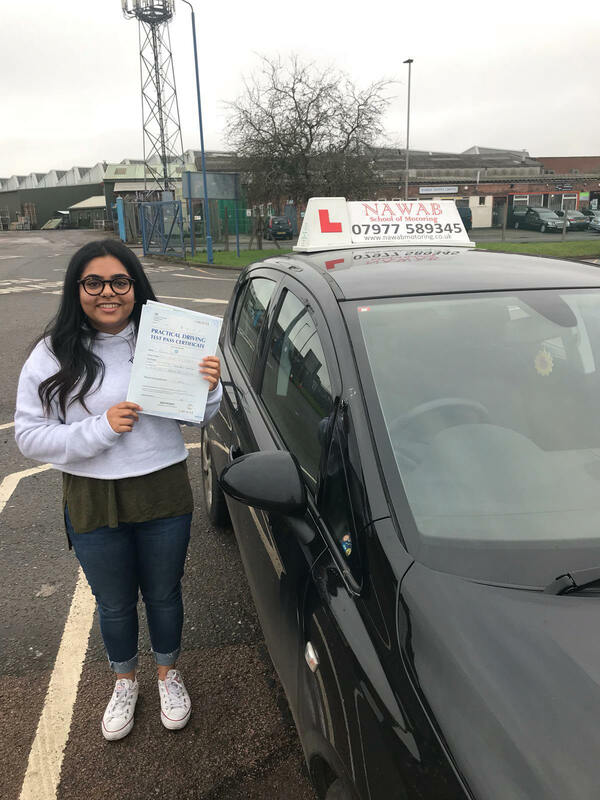 "Even after i failed about 2 times Mr Nawab didn't give up on me he always made me do the driving route/driving manoeuvres over and over again so it sticks in my mind and Alhamdulilah i passed so thank you Mr Nawab for keeping calm and for helping me to passed. :-)"
"Nawab school of motoring provided my 2nd instructor. Having struggled to get to grips with driving with my previous instructor I decided it was time to try Nawabs instead. 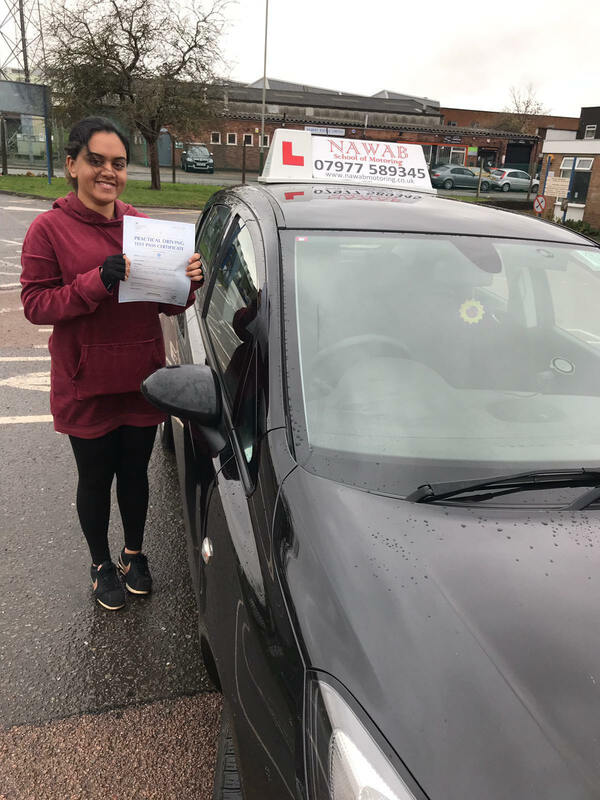 I immedietly found it much easier to learn, the instructor is calm and patient which helped put me at ease as I was previously very nervous when getting into the car, and this instructor's car is much easier to control compared to my first instructor's." 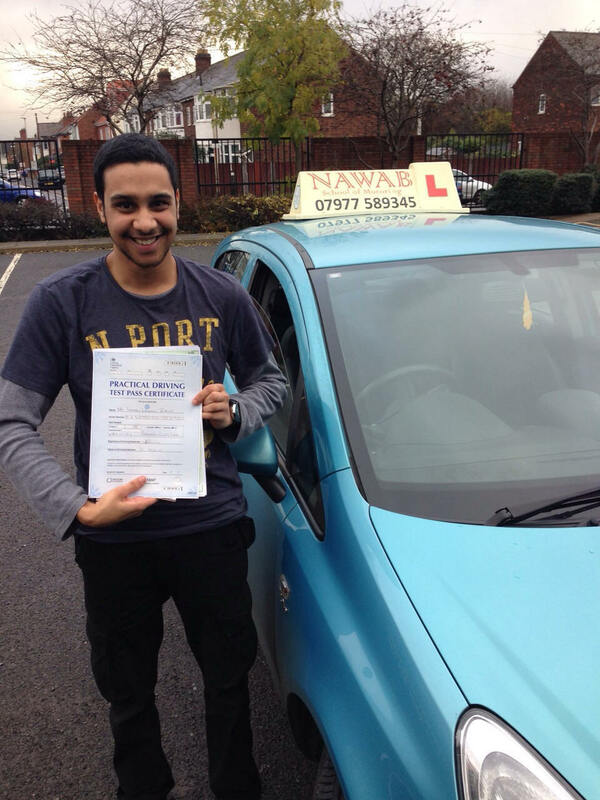 "I have thoroughly benefited from learning to drive with Mohammad and would recommend him to anyone. He was always professional and a calm teacher." "Exceptional isn't even the word to describe how exceptionally patient, persistent and punctual Mr. Nawab has been with my driving. 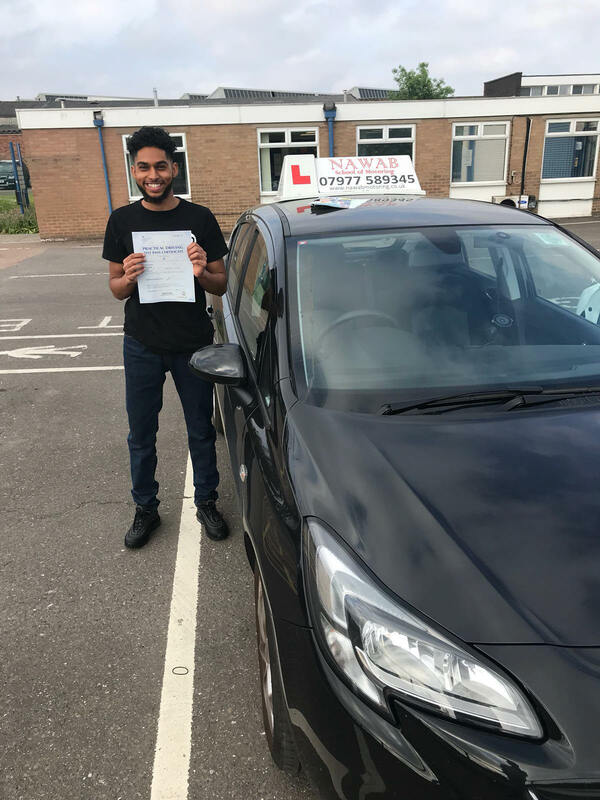 Due to his guidance, I was able to remain, calm, cautious but confident during my driving test which allowed me to pass first time!" 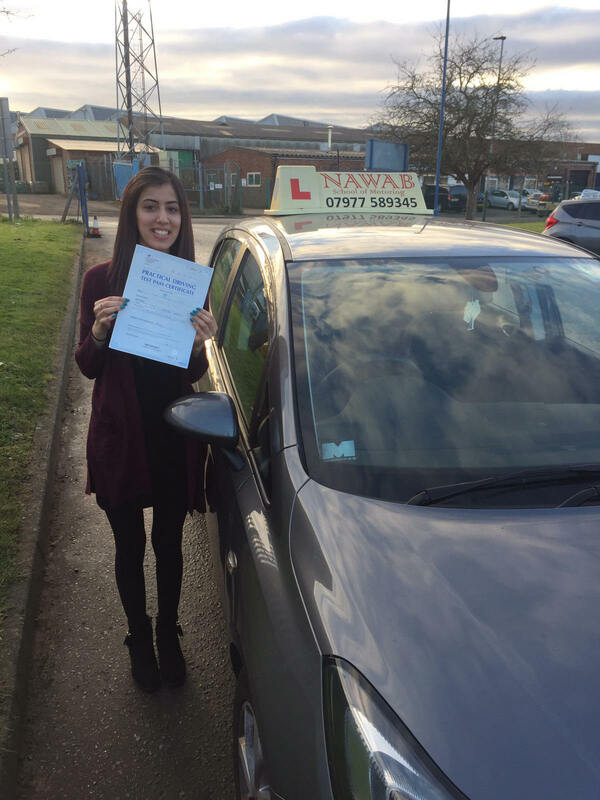 "I passed my first time today 23/12/2015!! I am 27 and spent most my adult life dreading driving. However after being recommended by my Mother in Law, my wife and my sister in law who all passed under his tutelage, Nawab exceeded all my expectations. His unwavering believe in me, and relaxed demeanour, put me in complete ease and he was very patient with me and the constant mistakes I made. after some time, I enjoyed the lesssons and began to look forward to them. He is super punctual and you can rely on him to show up when he says he will. He always kept me informed and worked around my busy schedule and lifestyle changes. I really want to commend Nawab for his proffesionalism. 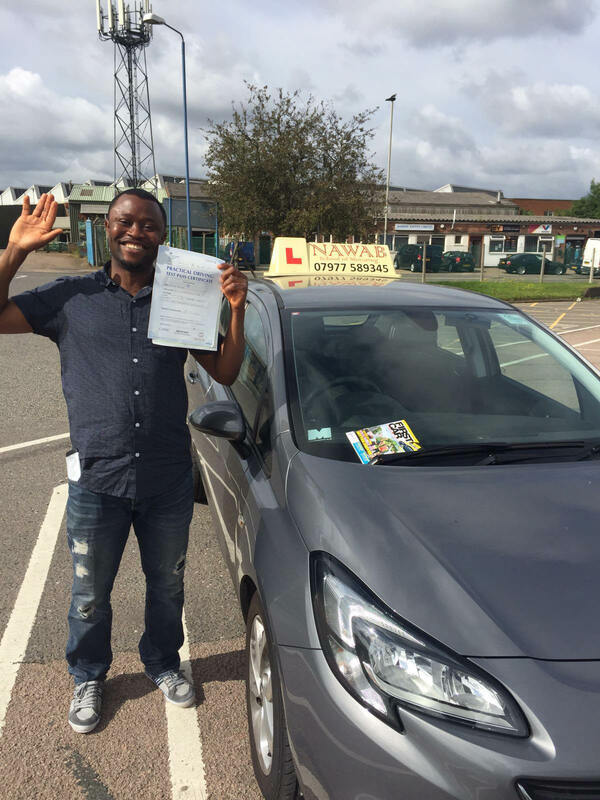 If you are reading this do not hesitate to speak to him, explain your situation like I did and I am sure he will find a way to get you to become a competent, confident driver like he did with me." 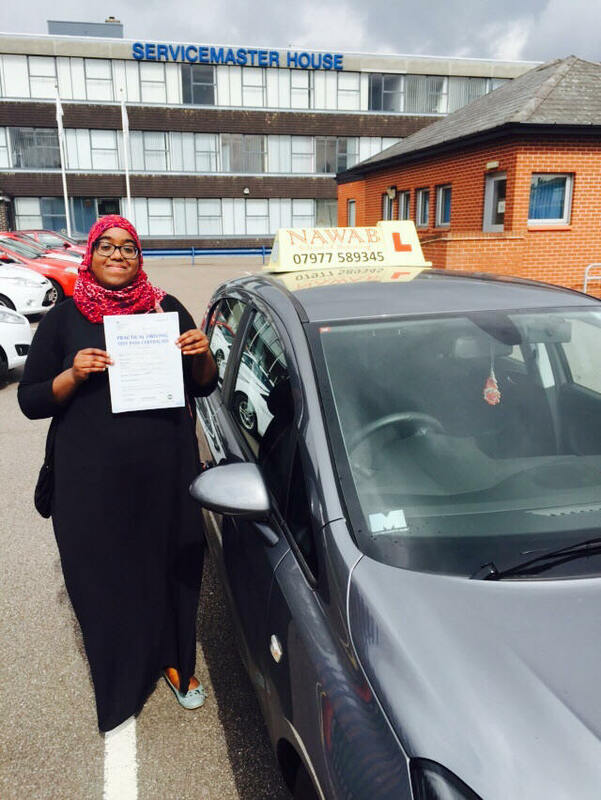 "I have thoroughly benefited from learning at nawaab school of motoring. The teaching style was effective and I was given time to learn things at a good pace. 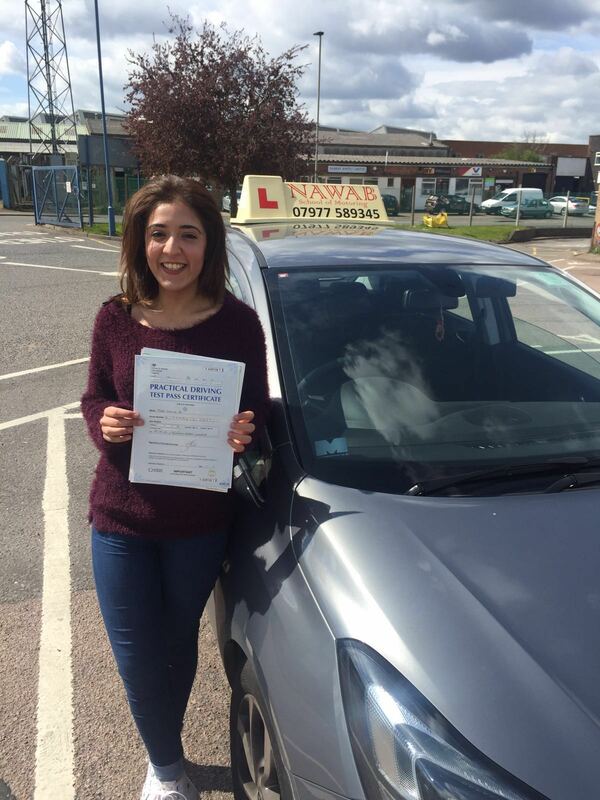 I would recommend it to anyone who is considering driving lessons.thanks Mr Nawab." 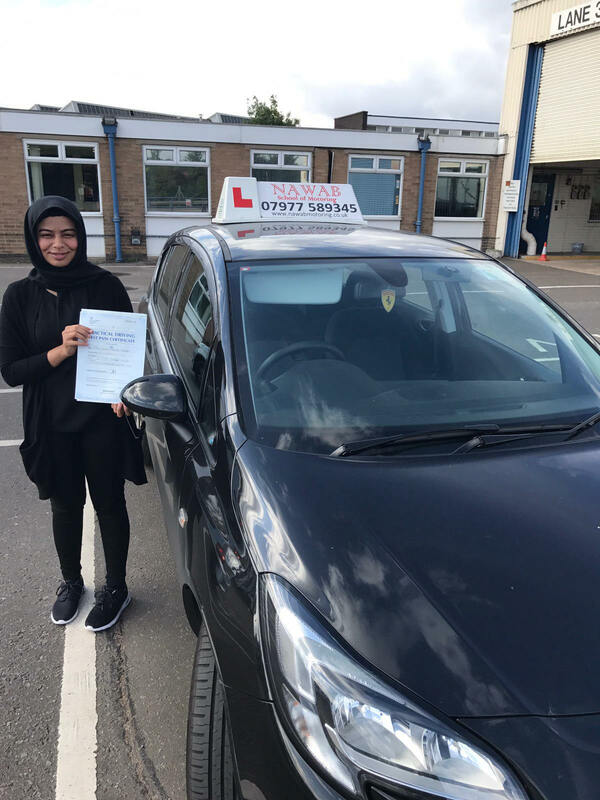 "I am extremely happy that Nawab School Of Motoring was recommended to me as I managed to pass first time due to the help of my great driving instructor Mohammed Nawab. He was always supportive and happy to help with any issues I had no matter how long it took. This helped me to constantly move forward and pass my test with no hesitation. Thank you so much Mohammed." "Mr Nawab is an excellent driving instructor who was very helpful and calm he teaches driving very clearly that is very easy to pickup and understand, He was a great help and helped me achieve my goal in passing my driving, Thank you so much Mr Nawab for all your efforts and help..."
"would just like to thank nawab for taking me on in such short notice. I cant thank him enough for all the hard work and effort he puts in every single lesson. Every lesson was made fun, enjoyable and easy to understand. A very committed instructor who puts 100% effort into making sure you pass. Having changing instructors a few times I can say Nawab has bee REALLY good. would definitely recommend to anyone!! Thank you once again for helping me achieve one of my biggest goals." "Nawab is the best teacher I have come across. He is patient and explains things easy and well. I passed first time because of such a fantastic instructor. I would recommend him to any one. I would like to give you a massive thank you for helping me achieve one of the biggest goals of my life." 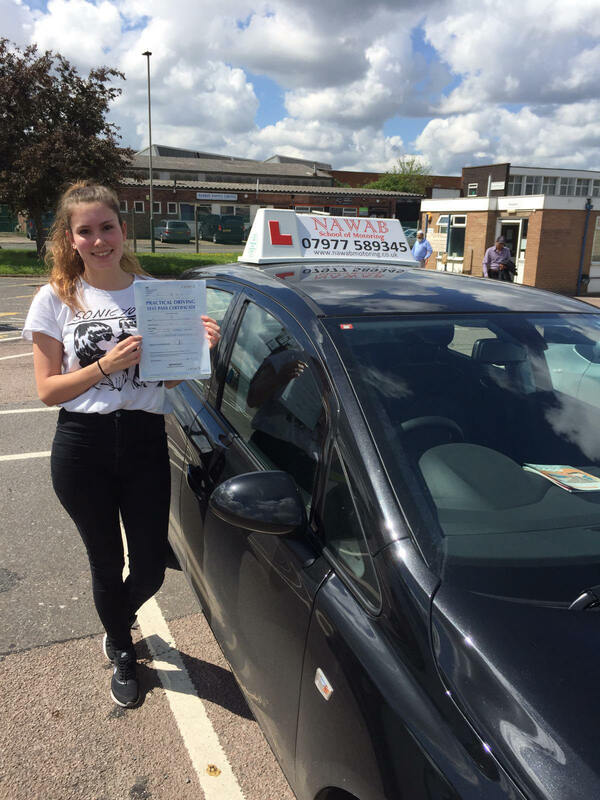 "A massive thank you for helping me to achieve one of the biggest goals in my life – passing my driving test! This would not have been possible without your continuous support and encouragement. Your patience and guidance helped me be calm and focused in both my lessons and test. I will recommend you to anyone I know who is looking for a driving instructor. I will miss our chats about all sorts of random stuff and your very wide knowledge about India. Once again thank you." "I usually don’t write reviews but this time I feel I’m compelled to do so. 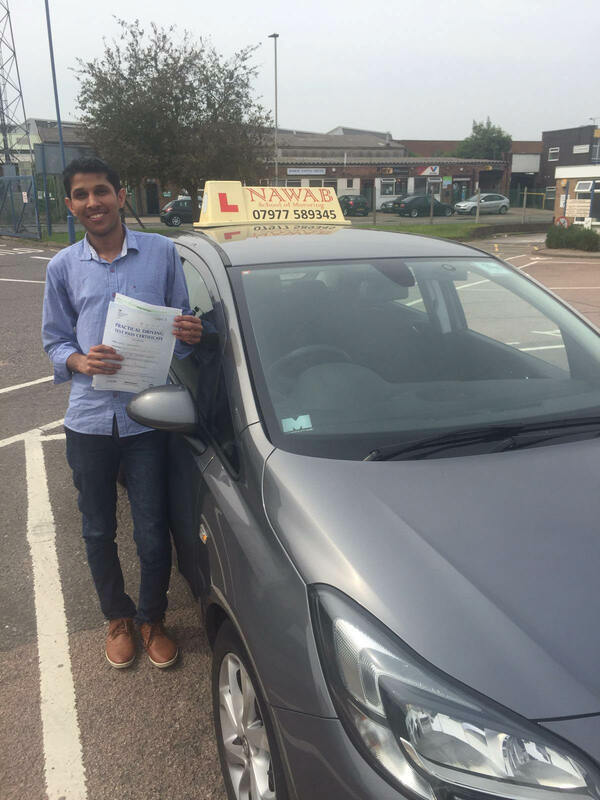 I passed my driving test and I couldn’t have done it without Nawab’s help. I had zero driving experience and zero confidence before taking Nawab’s lessons. Nawab is very polite, patient and professional. He teaches driving skills in a way that improves your confidence. After my first lesson, I felt I no longer terrified of driving. I highly recommend Nawab as he is an excellent teacher." "Thank you to Mohammed for giving me such good lessons. 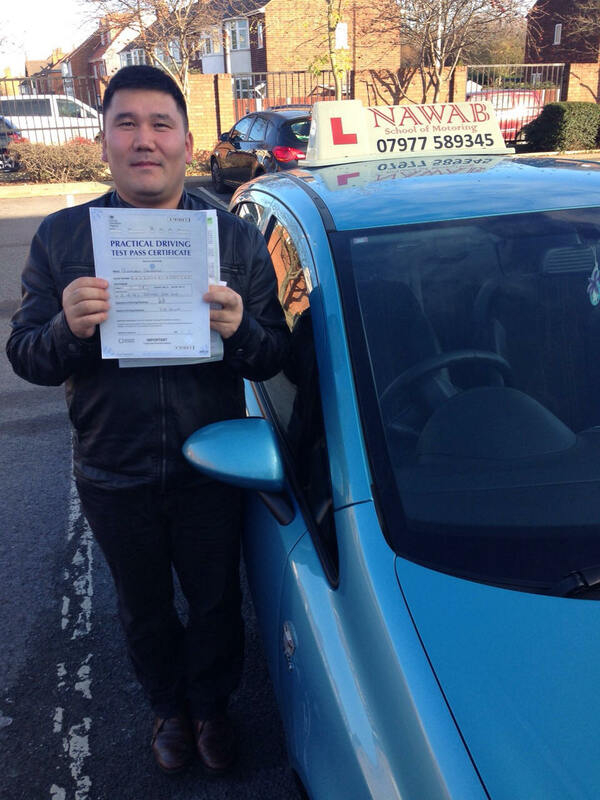 He is the best driving instructor in Leicester." 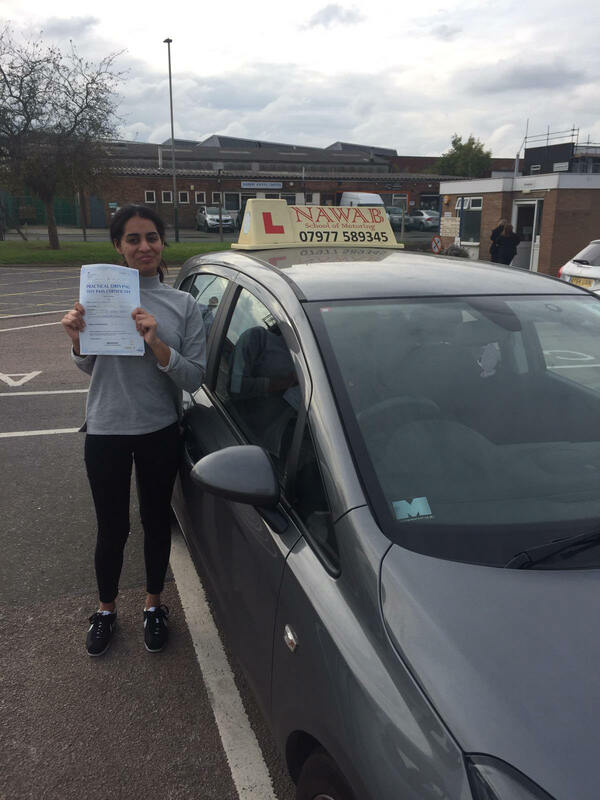 "A big Thank you Nawab for your patience that helped me to not only pass my test first time but also to feel confident as a driver. Felt at ease every lesson I had with him and never felt rushed. I would happily recommend him to anyone. Thanks again for everything." 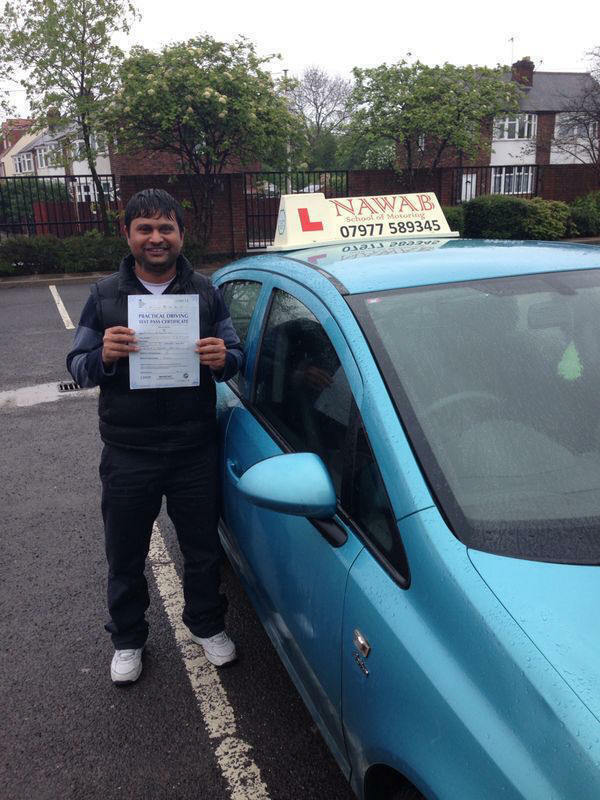 "Nawab, was professional always promt and on time learnt a great deal more than I have with other driving instructors. Highly recommend." 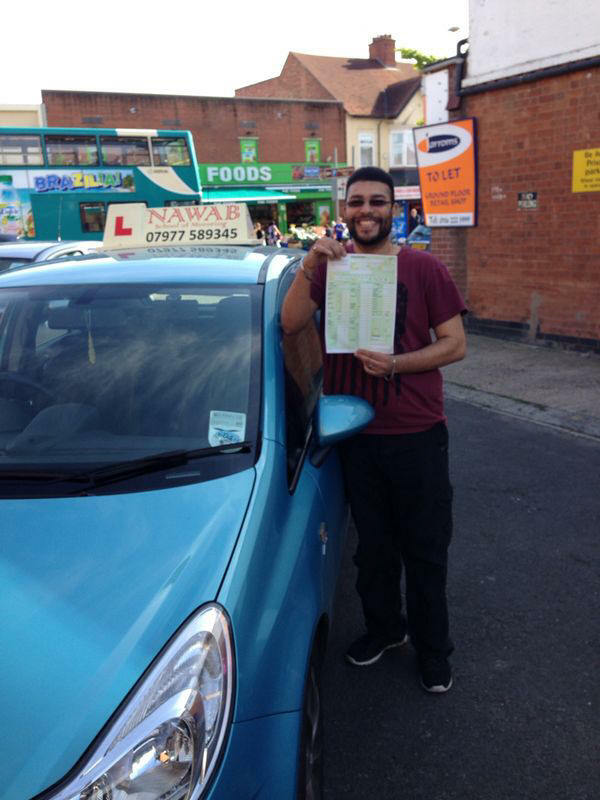 "Mr Nawab is the best there is no other way to put it hes brill :) always has time always very nice and has patients and always explains everything so clear, I passed with in 2 months theory and driving test thank you so much mohammed for all your time and effort you put in to help me pass my driving test. i would recommend any one to take up lessons with mohammed. 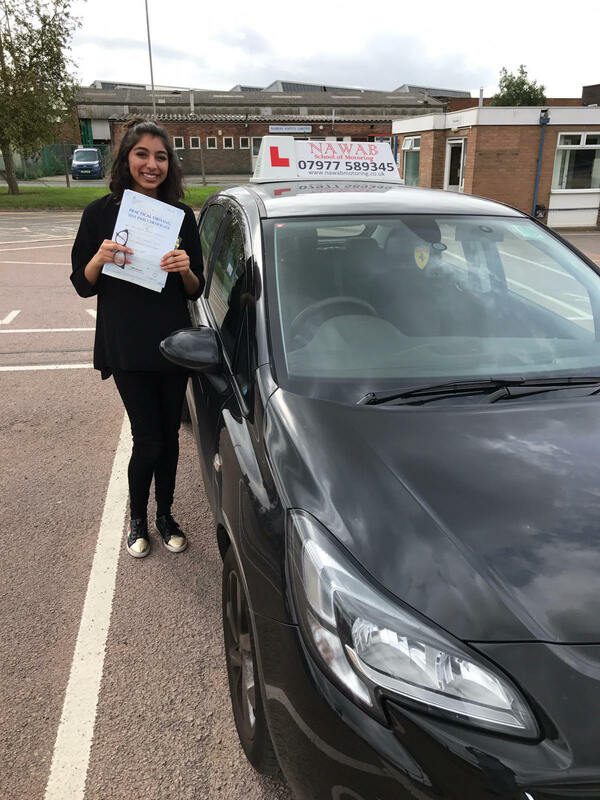 Thank you once again your the best :D"
"Mr Nawab is an extremely patient and understanding instructor, because of his motivation and encouragement I was able to pass first time with flying colours. Mr Nawab is punctual and accommodates lessons to suit your individual learning styles. I always felt comfortable and satisfied after a lesson as I received professional service from a highly experienced instructor. 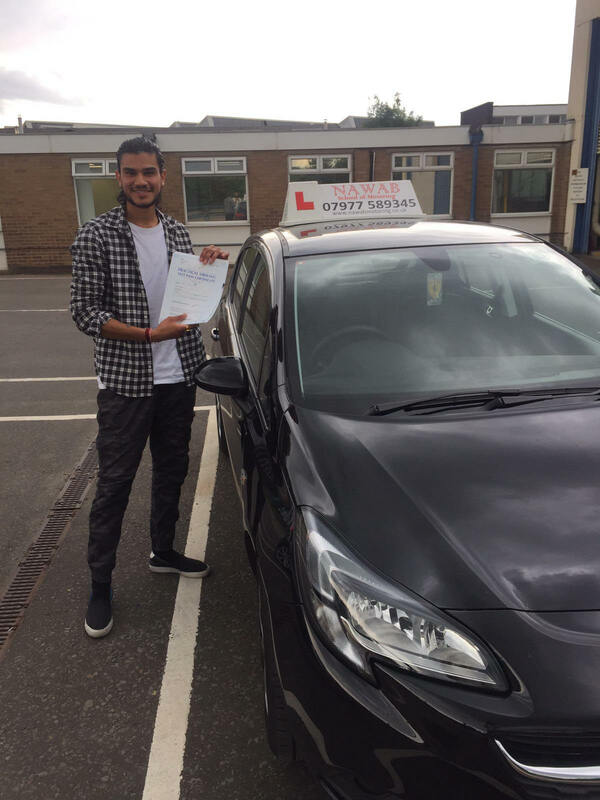 Mr Nawab will leave you with a positive driving experience aswell as teaching you exactly what you need to know to pass. 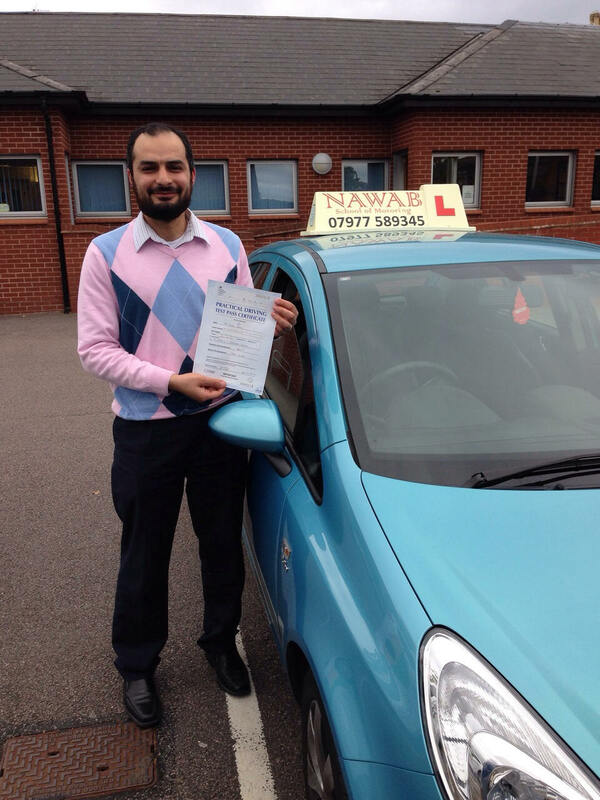 I highly recommend you to take up driving lessons with Mr Nawab, you won't regret it, i know I don't! 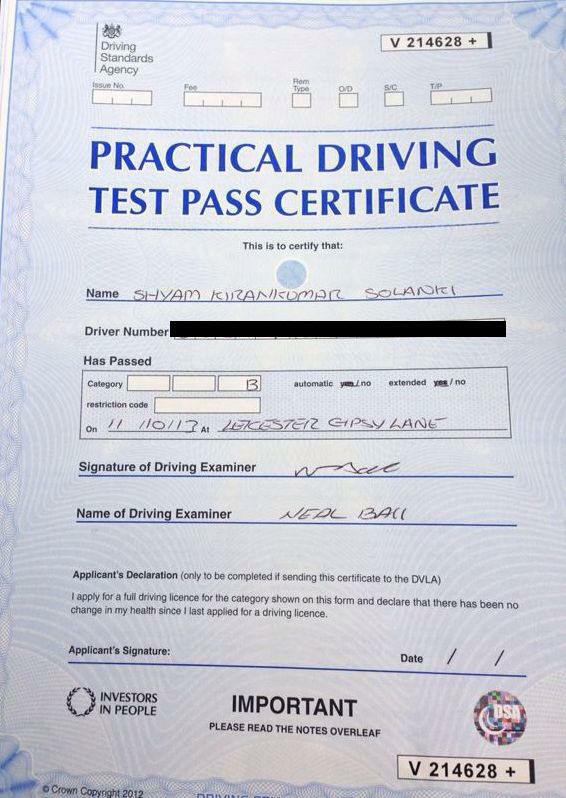 Thank you Mr Nawab for helping me pass FIRST TIME! 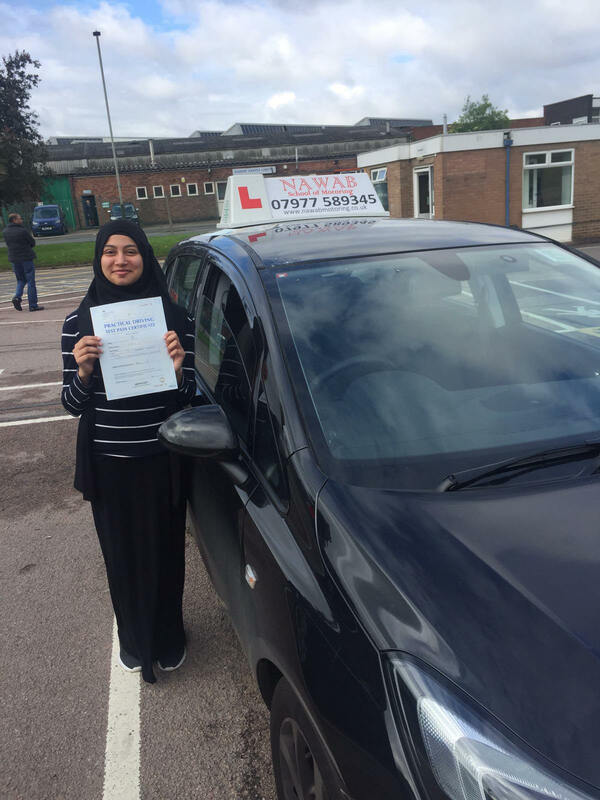 Best driving instructor in leicester." 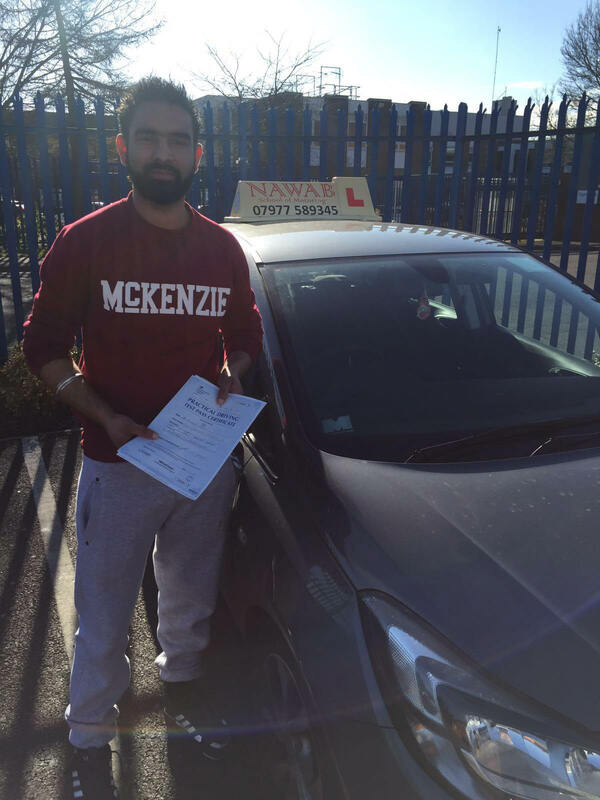 A massive Thank You to Nawab who helped me to build my confidence to pass my test first time round. During lessons I never felt under pressure as Nawab is so patient and explains everything simply yet effectively. He was always on time and lessons where planned on a week by week basic around my schedule which was so helpful. Highly recommended to all. "Thanks again for everything, you are best, you put me at ease with your friendly manner, and you never gave up on me. I pass it for first time . I could not have made it without you. I will recommend you to all my friends and work colleagues. Thanks one more time!" 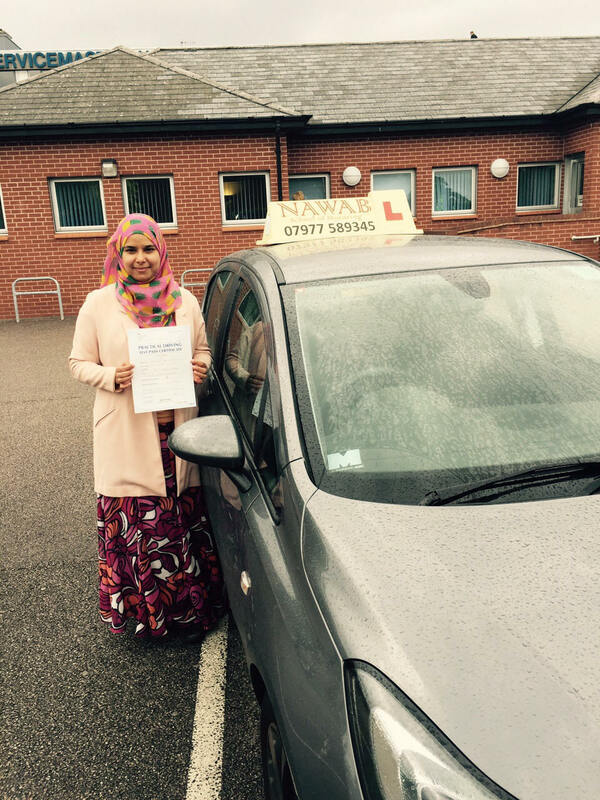 "Thank you sooo much for everything and for being the best driving instructor I ever had. No other word for it :) You’re always very patient and explain everything in a very simple and clearway to understand. 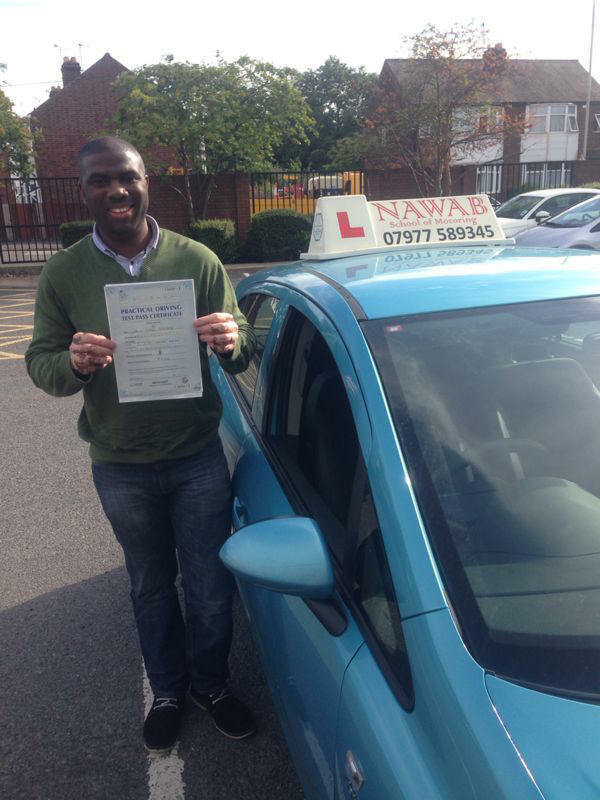 Mr Nawab is very friendly, flexible and will definitely help you succeed your driving to a professional standard. His unique method of teaching will help you improve your weakness into your strength and help you feel like driving is fun and enjoyable at the same time. Overall my journey was pleasant, as I have gained so much knowledge and experience from Mr Nawab, THANK YOU SO MUCH ONCE AGAIN. 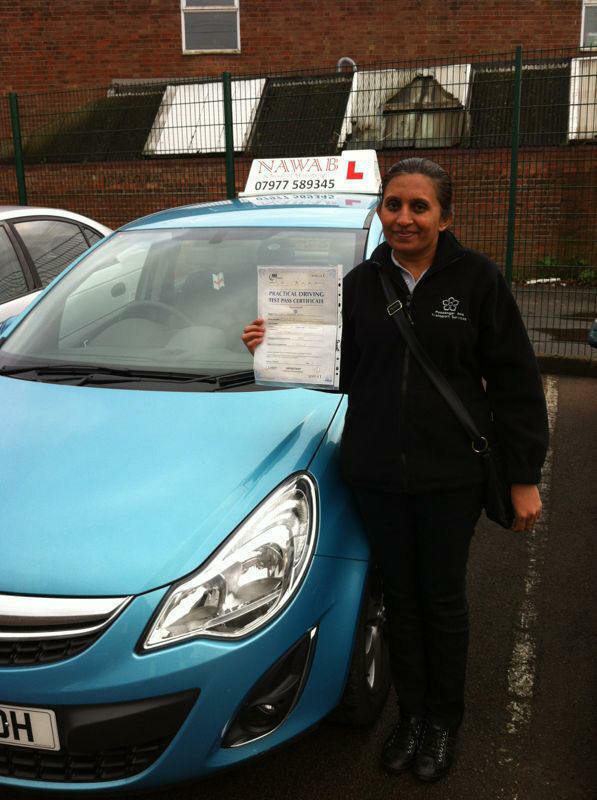 I would definitely recommend everyone for Nawab driving school; he is the best driving instructor you could ever have." "Nawab bhai is very patient and explained everything very clearly, he always encouraged me and build my confidence and very punctual. I am very happy that I chose him as my instructor and very highly recommend him. 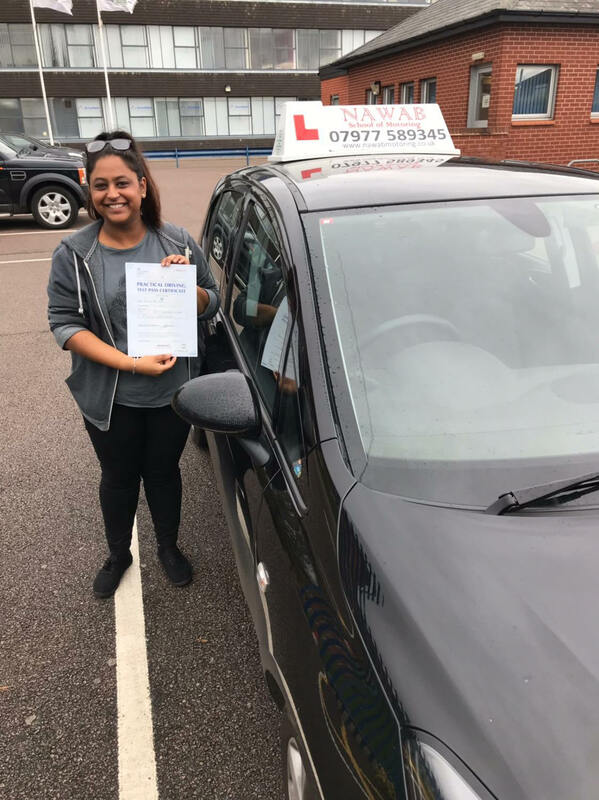 If it wasn't for clear instruction I would not have passed my test on the first attempt, thank you so much, your are the best instructor." "Mr Nawab is patient and explains everything very clearly in a way you understand. He will focus on helping you improve your weak points and is thorough in his teaching. I would definitely recommend him. 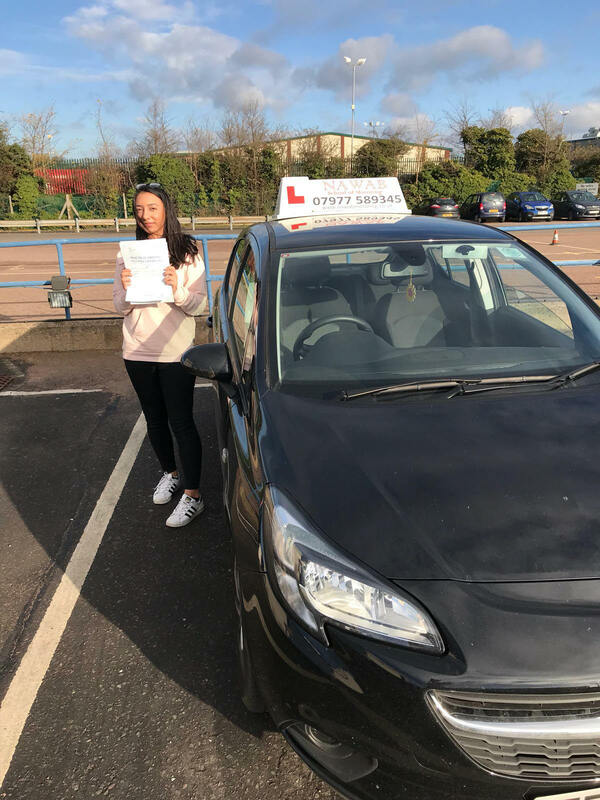 Thank you for helping me pass first time!" "i think nawab bhi is the best instactor. i passed my driving test... he was my instactor. befor i was taking lesson on other instactor he always passiing my time. but nowab never do this.. i am very happy with him. i allaways recomand everyone for take the lesson from nawab school of motoring..."
"MR NAWABBHAI I am very glad to have lessons with you. Nawabbhai gave me more confident especially after my first attempt with previus instractor. I have no word for Nawabbhai has done for me. THANK YOU is a small word for him but from bottom my heart I want to say he is THE BEST INSTRUTOR and he is very good person. I highly recommend to everyone. THANK YOU THANK YOU VERY VERY MUCH……………………. NAWABBHAI." 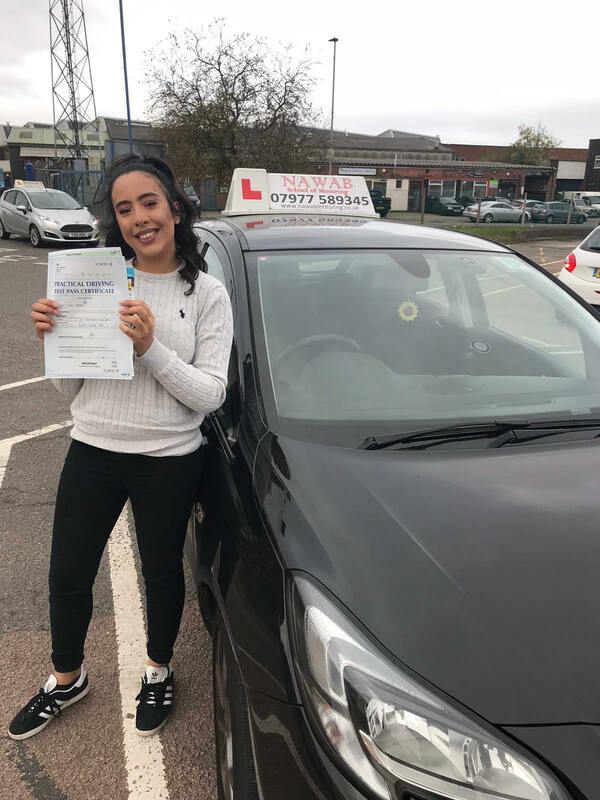 "I can't thank you enough for helping me pass the practical driving test on my first attempt!.Like many other drivers who have moved to the UK, I found the process of getting a driving license quite daunting . 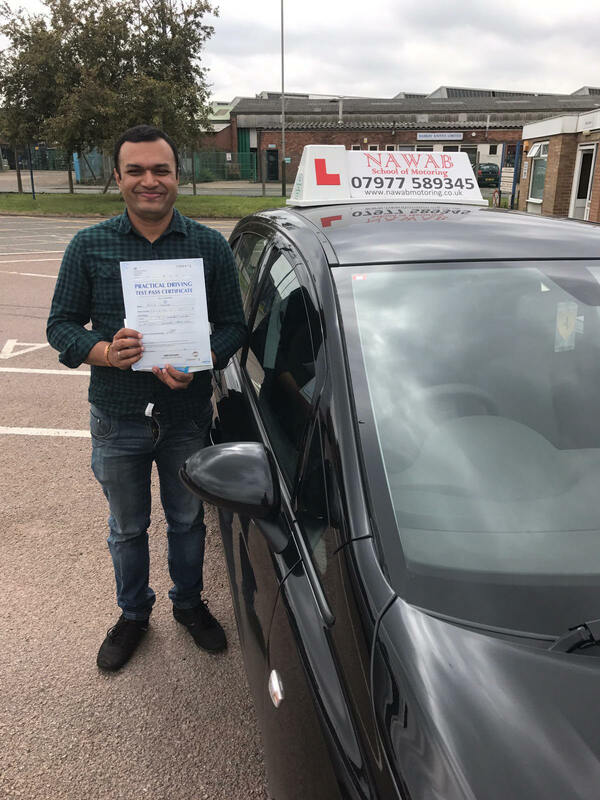 Driving with Nawab made the experience so much easier than expected,he provided all of the tips I needed to pass the test on my first try and helped me become a better and more comfortable driver in the UK. thanks." 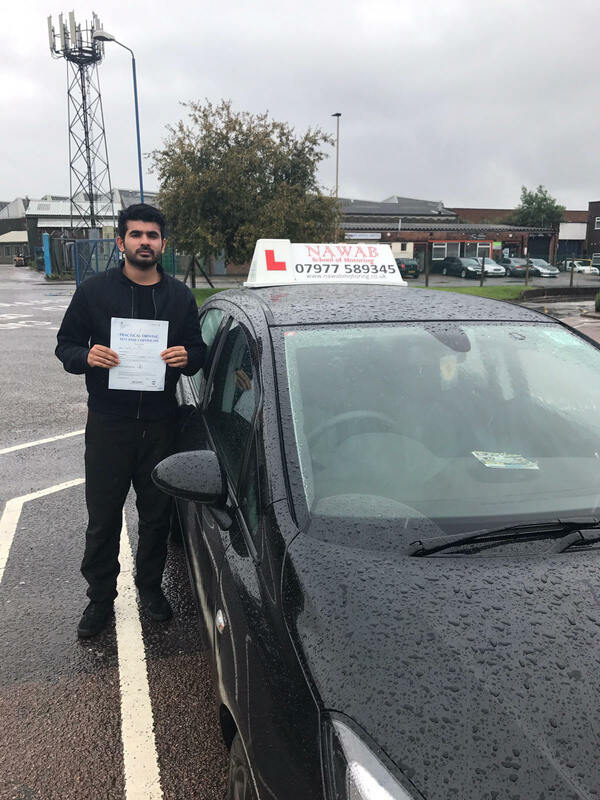 "Mohamed Nawab is a fantastic instructor not only is he patient, professional and punctual but he has placed faith in me passing my test in such short notice and saw potential in me. He is very committed to his students and always delivers the best lessons as he comes prepared. He works his way around your schedule to make it convenient for you and makes driving fun and easy. I definitely would recommend him to everyone. Thanks Nawab!!!" 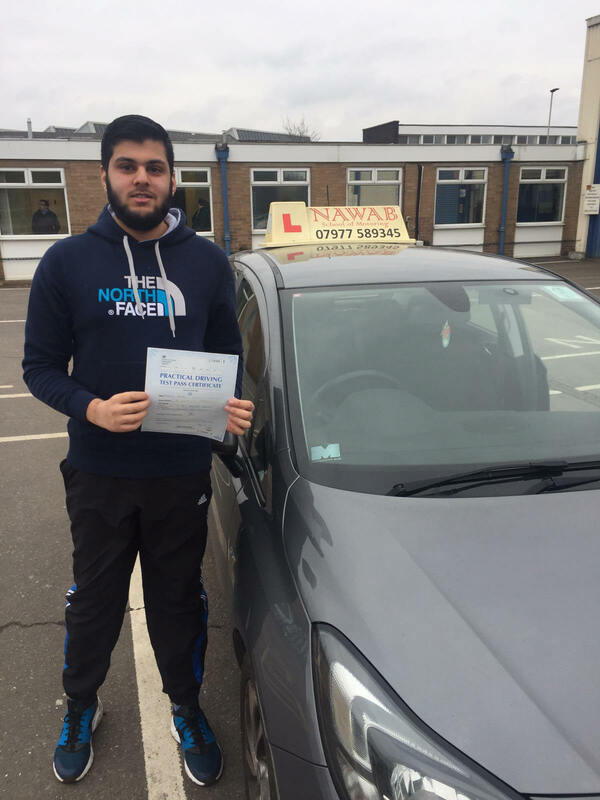 "Mr Nawaab was very patient, friendly and made learning to drive a fun experience. 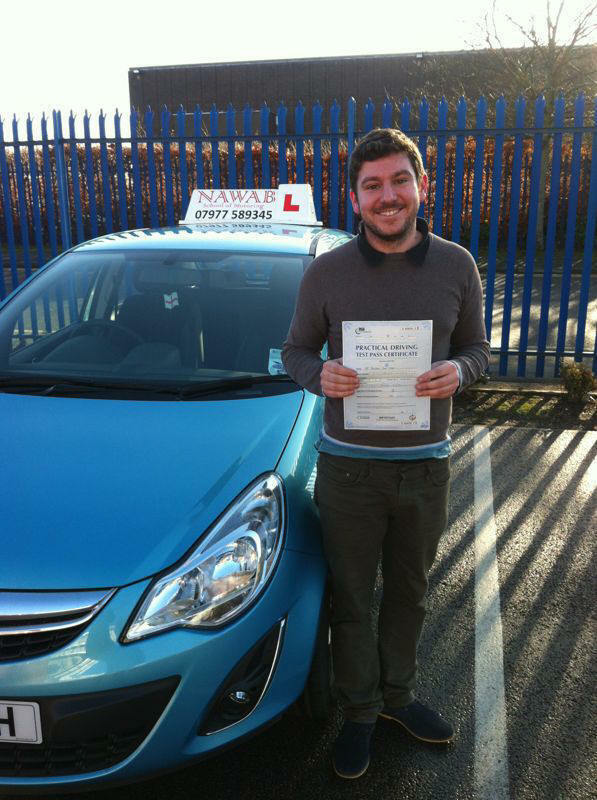 He gave me confidence in my abilities and so I am very pleased that I passed first time due to his support throughout. I would highly recommend him." "Mohammed Nawab is an excellent instructor. He is a patient, Helpful & Unique driving Instructor. I highly recommend Mohammed." Top quality lessons from a patient, humorous and competent teacher. 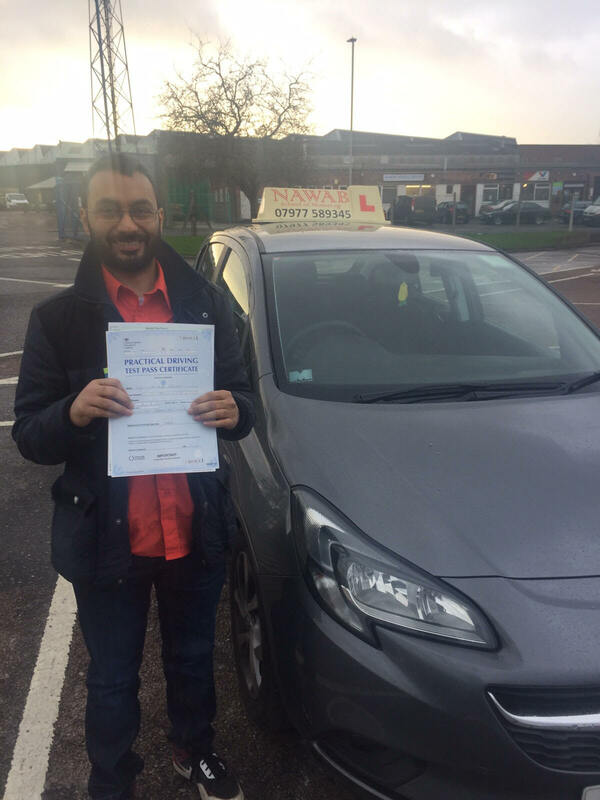 Mohammed made me feel confident in my skills, and helped me to feel like driving was fun, not just a chore. Thanks to him, I feel I could now navigate the trickiest parts of Leicester with my eyes closed! I highly recommend him to first time learners -- or even if you're just a nervous learner who need someone who is patient and can tell you good jokes while you drive. What a guy! Not only is he the 'BEST' instructor but also a great human being. Thank You Muhammad bhai for your support throughout. I would highly recommend Muhammad Bhai as your instructor. 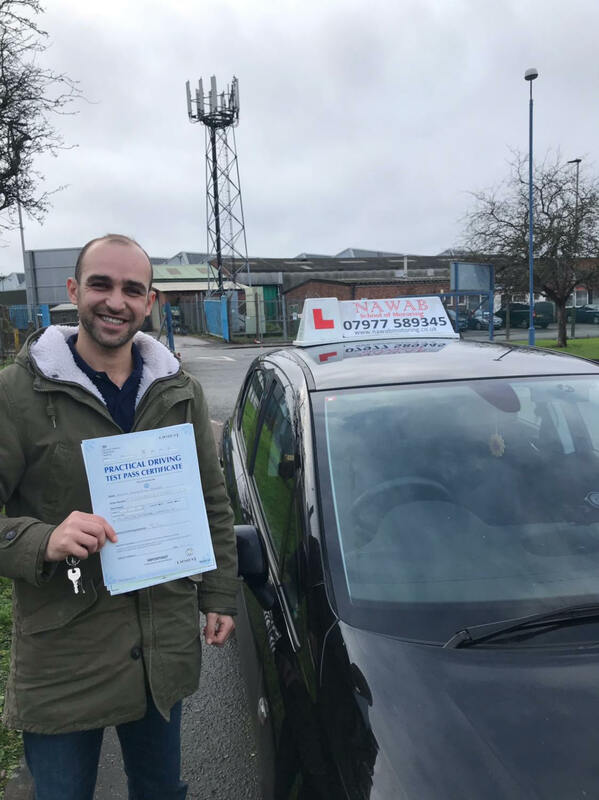 "Mohammed Nawab is a calm and very understanding driving instructor, i took 11 lessons with him and he felt confident in me to take my test to which i passed. 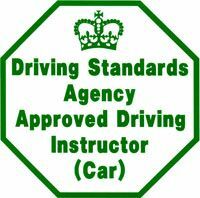 I have and would recommend this company to anyone because of the experience i have received to whom is looking for a brilliant instructor." 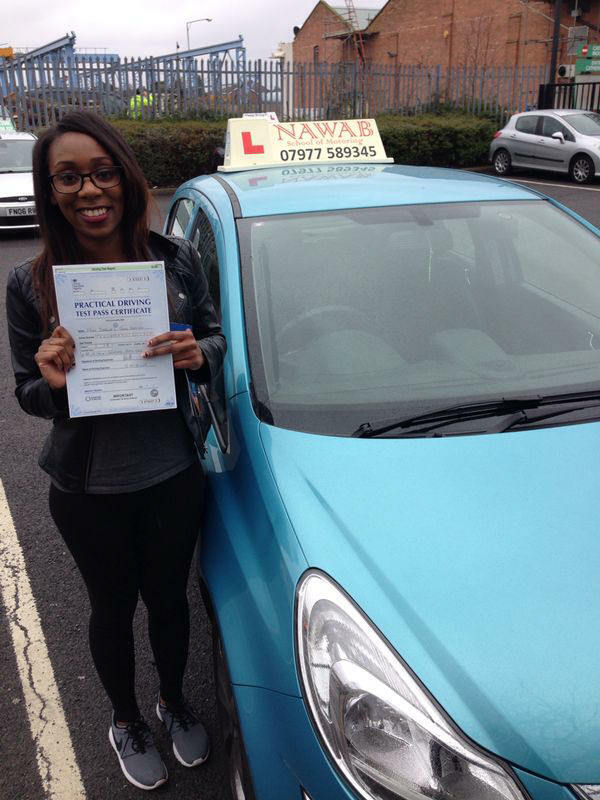 "An excellent driving instructor - Highly recommended. Mr Muhammed Nawab is a patient, Helpful & Unique driving Instructor. His Unique Method of teaching proved beneficial for me and enabled me to pass my Diving test the first time, in a limited amount of lessons. 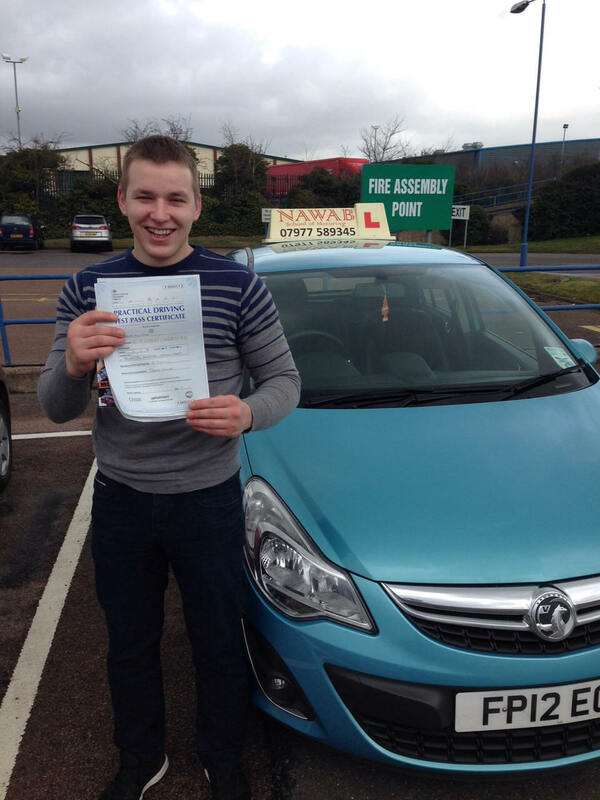 I would recommend others to have their Driving lessons from him." 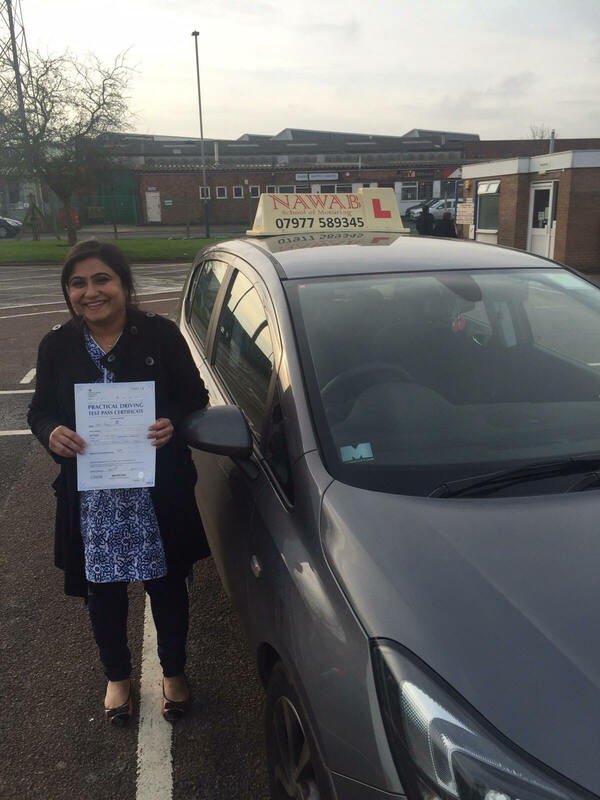 "Mr nawab was very good instructor. He was so helpful and friendly. Also he gave me confidence to pass my test. I am so glade to have lessons with him. I just want to say thanks to him." 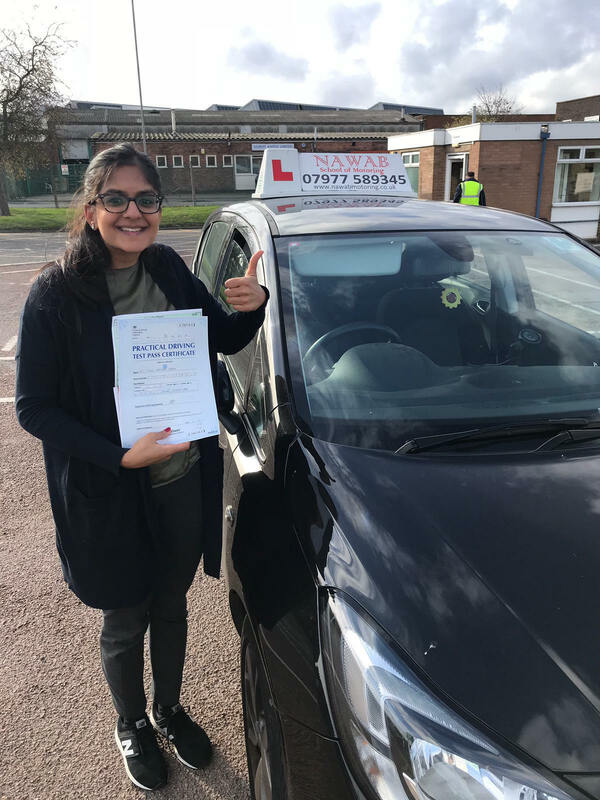 MR Navab was an excellent driving instructor, he was very clear and specific in guiding me in each lesson and briliant in explaining, i have had a wonderful experience learning my lesson with him and i would definitely recommend everyone for navab driving school. top rated person thanks for all your support. "The best driving instructor! I'm a naturally nervous person but Nawab made me feel calm and confident. He tailored the lessons to my needs. He explained everything clearly and was brilliant at helping me grasp anything I had doubts about. 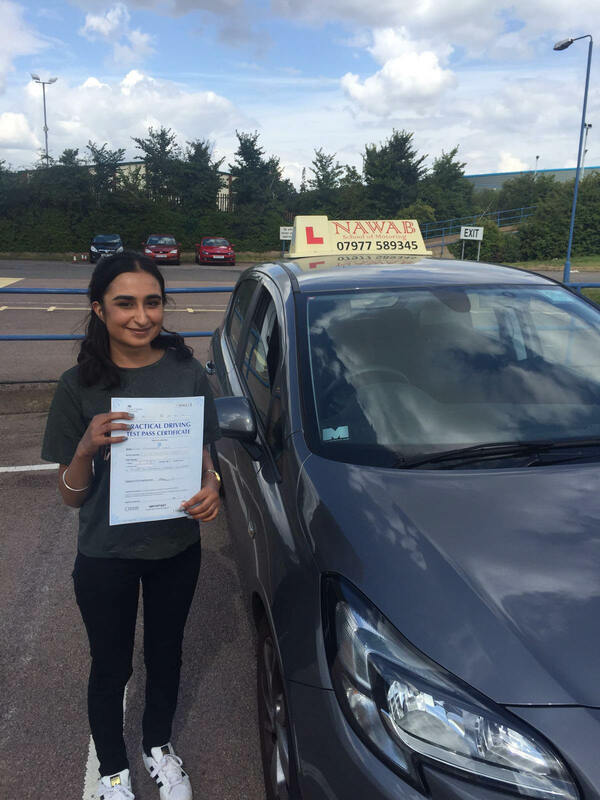 I would definitely recommend Nawab Driving School to anyone looking for driving lessons of great quality and at a great price." 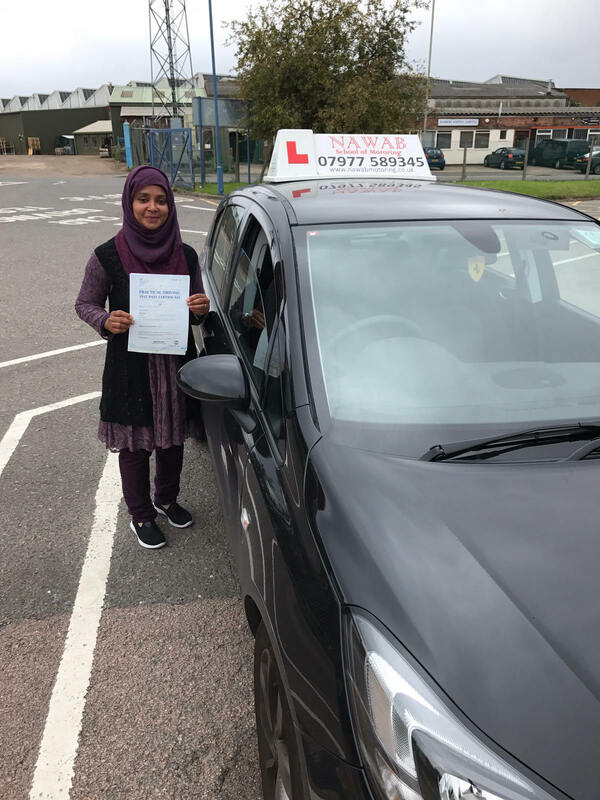 "Nawab was a very good instructor he was always on time very good at speaking to you when you made mistakes I really enjoyed the way he taught and was a top rated instructor. 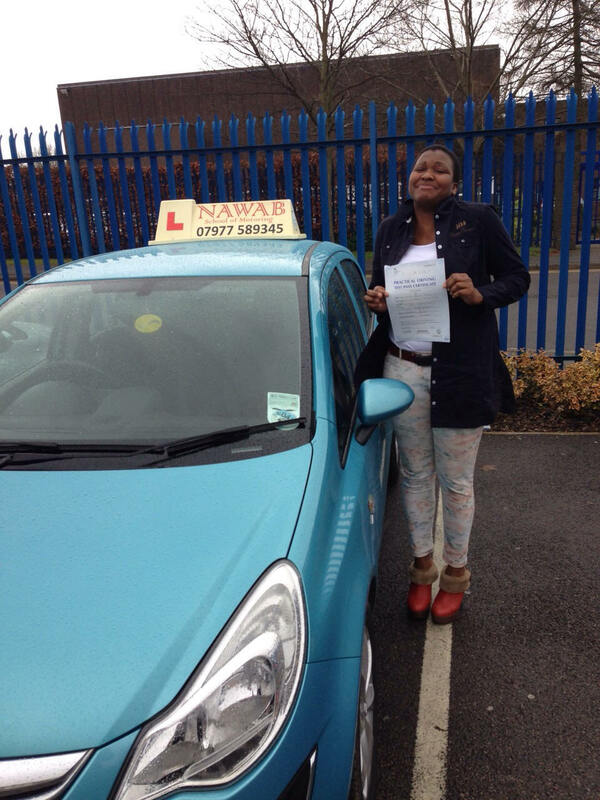 Also thanks for your hard work with helping me to pass my test." "Great driving instructor. Makes you feel at ease when driving and pushes you so you can do well. Very friendly and patient too. I have and will recommend him to anyone." ... BEST DRIVING INSTRUCTOR ! Thankyou Mohammad bhai for your support!" 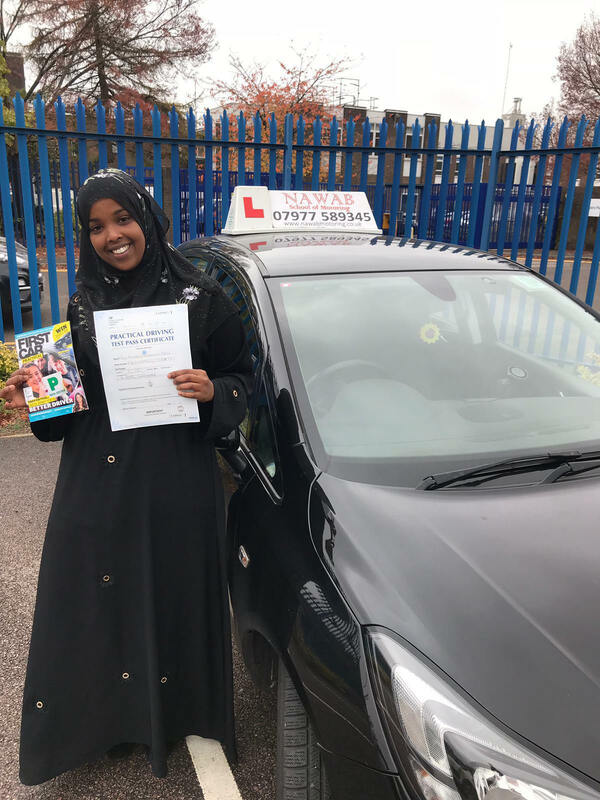 "I just want to say thank you to Mohammed for helping me pass my driving test the first time. 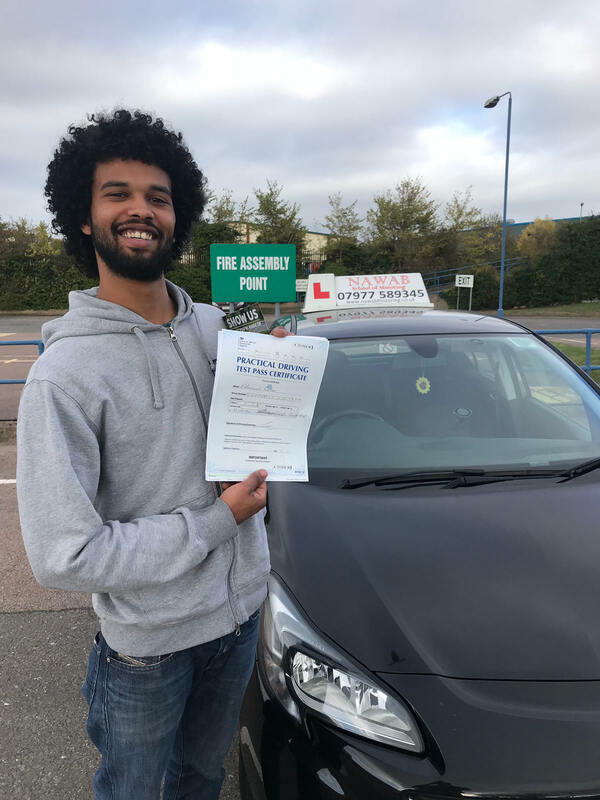 He was very helpful in boosting my confidence and driving skills as he was always calm and patient, and he also had no problem in going through things again if I forgot or had any further questions! 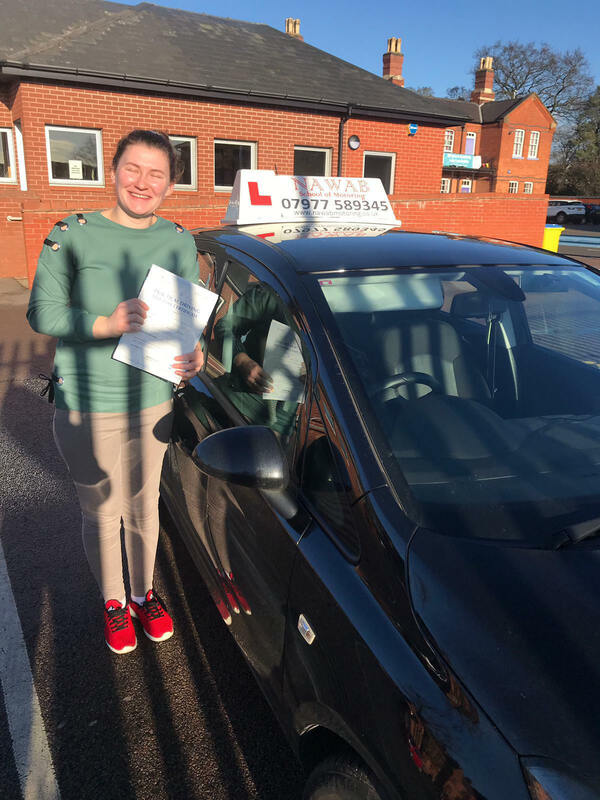 I especially appreciated that, unlike some instructors I've had in the past, he would take me to drive around the test centre and routes that I was going to be tested on. 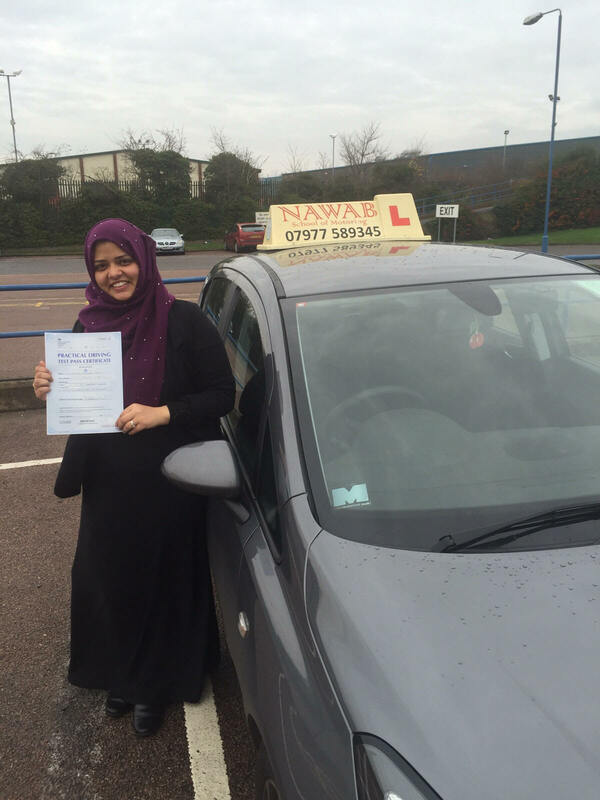 Thanks again and I would highly recommend Nawab Driving School." 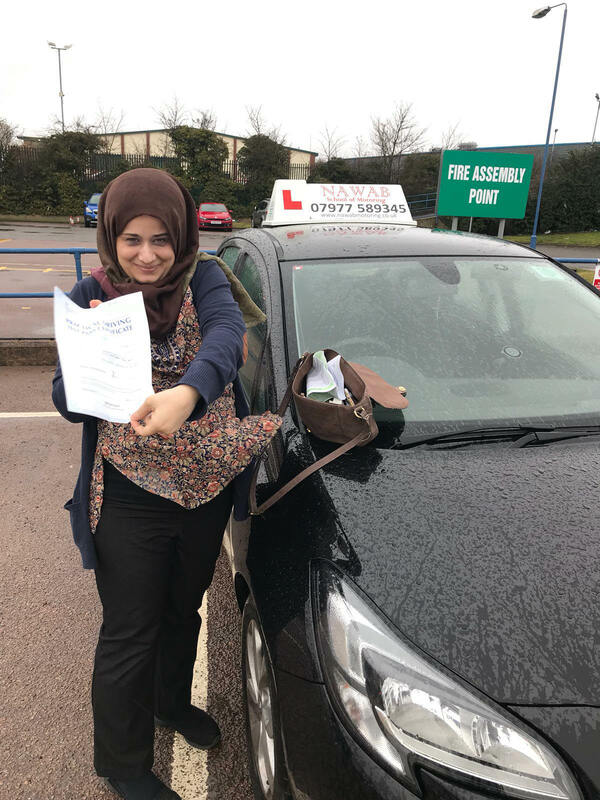 "Learning to drive safely with Muhammed as my instructor was a pleasure, for that reason alone I would recommend him to any one. His qualities include: Excellent communication skills, punctuality, patience, confidence in his pupils, flexibility in time management and many more. 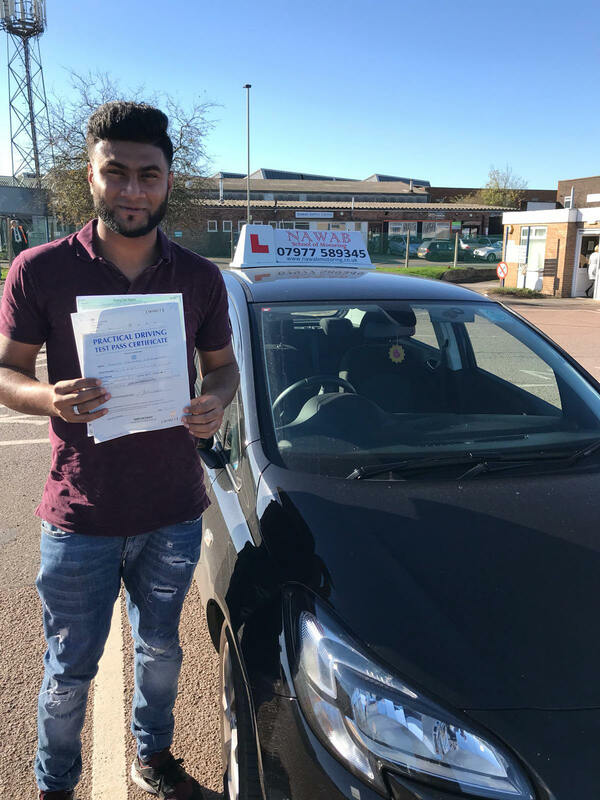 If I say Mohammed Nawab is the best instructor in the United Kingdom you would say I'm boasting, but if I say he is not the best Instructor in Leicester city then you would know I'm lying." 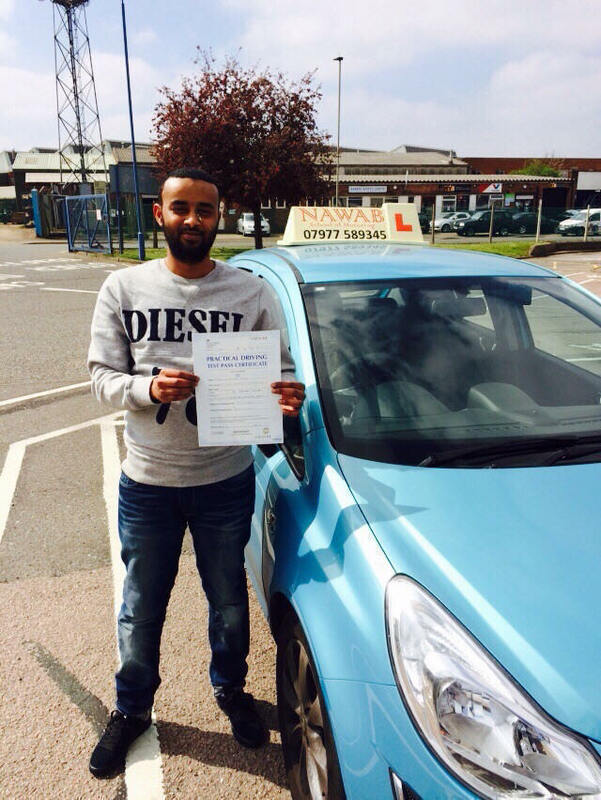 "I can't explain what Mohammed has done for me, I felt comfortable and relaxed with him even during the first lesson. 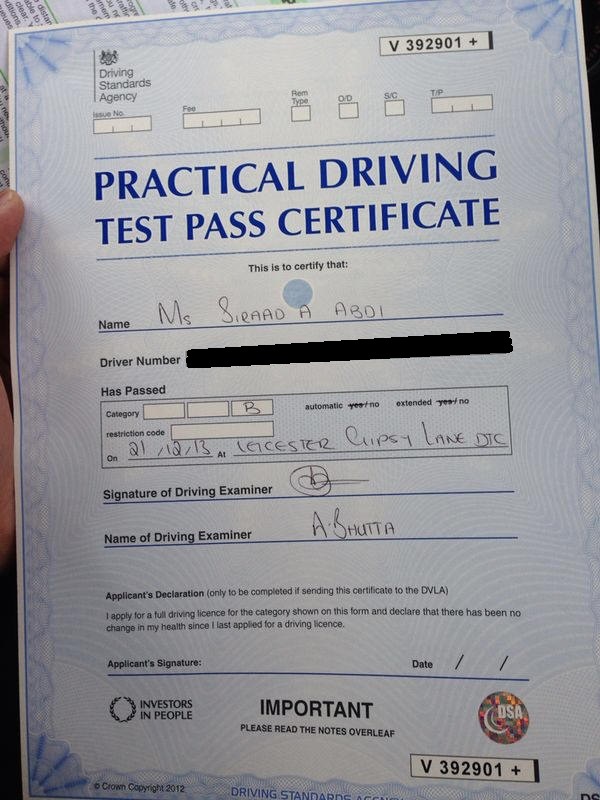 It's thanks to him that I passed my test first time and feel that I am a capable and confident driver. I would highly recommend him to anyone I know that is looking to learn to drive. I can not thank him enough." 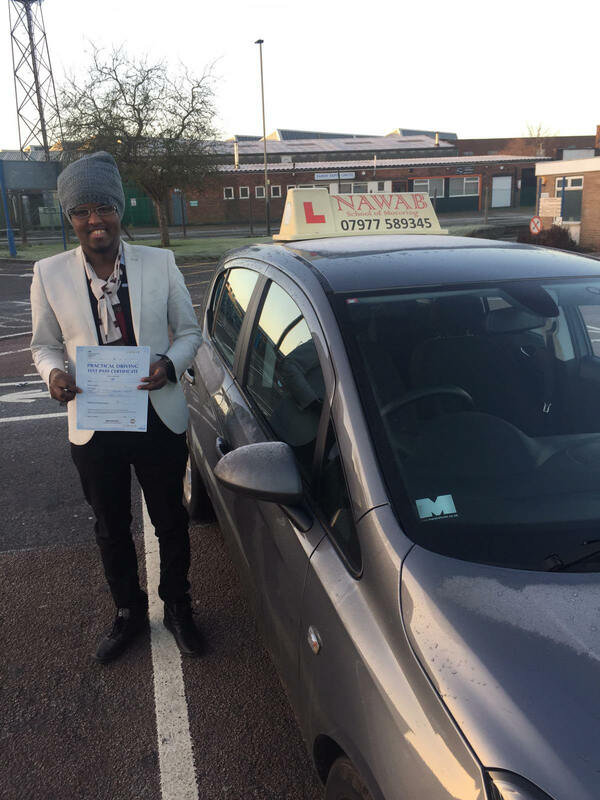 "Mo was an excellent instructor who was very patient and supportive. 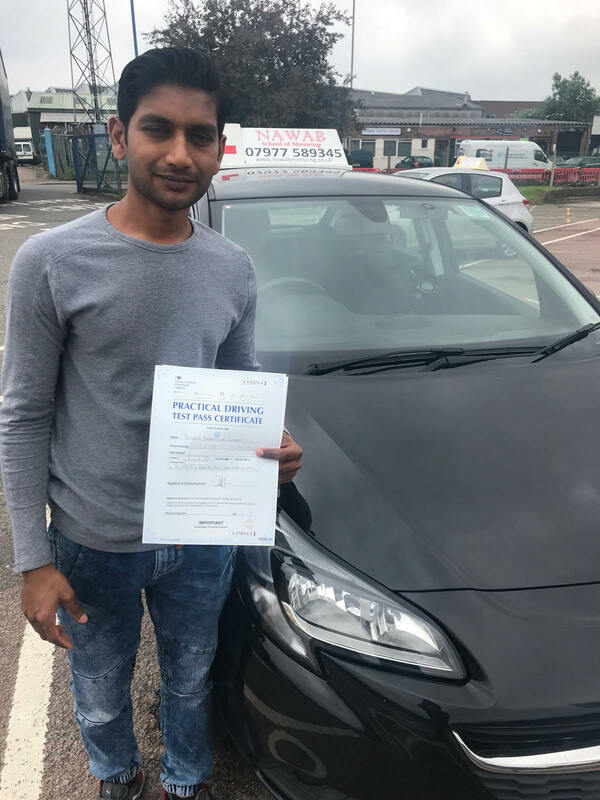 He helped me to overcome my initial nerves and his assertive technique enabled me to concentrate on the important areas of my driving. 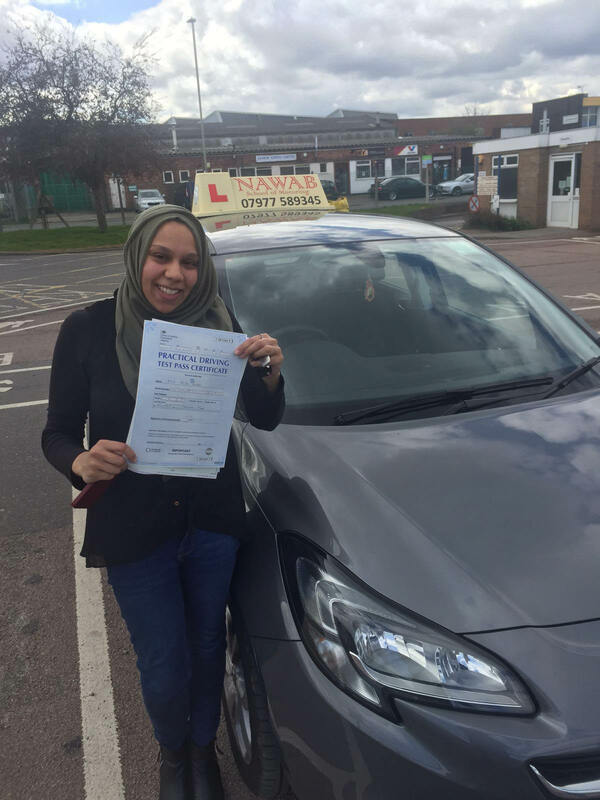 He gave me the confidence to pass my test and I would highly recommend Mo to anyone who is looking to learn to drive." 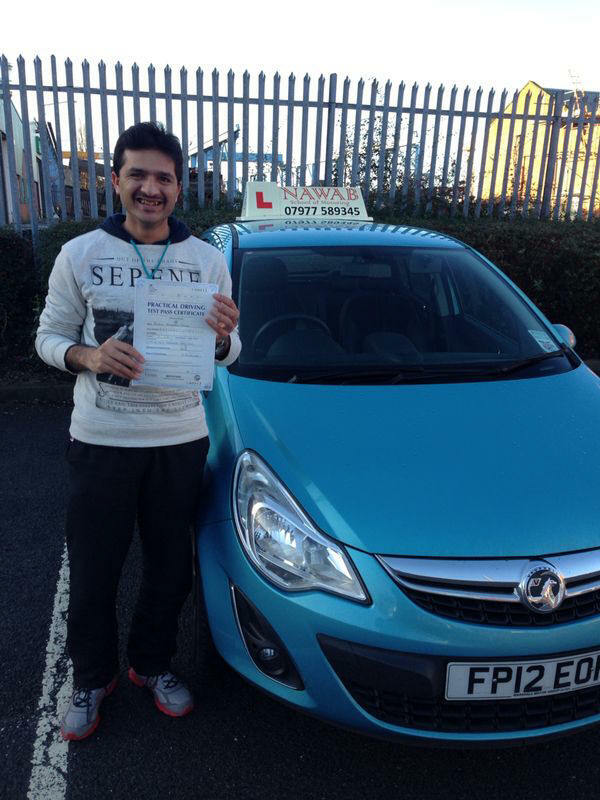 "Mr irfan was one of the best instructor I have came across. He's attitude towards teaching was very unique. The way he has built my confidence in driving is tremendous and without him I surely can say I wouldn't have done it. I would recommend him to many people out there willing to pass." "I'm so glad to have a lessons with you. I'm so happy that I passed my driving test as quickly as I wanted. I got good expirance with you. I always recommend to my friends to take a lessons with you. You are a such good person."" 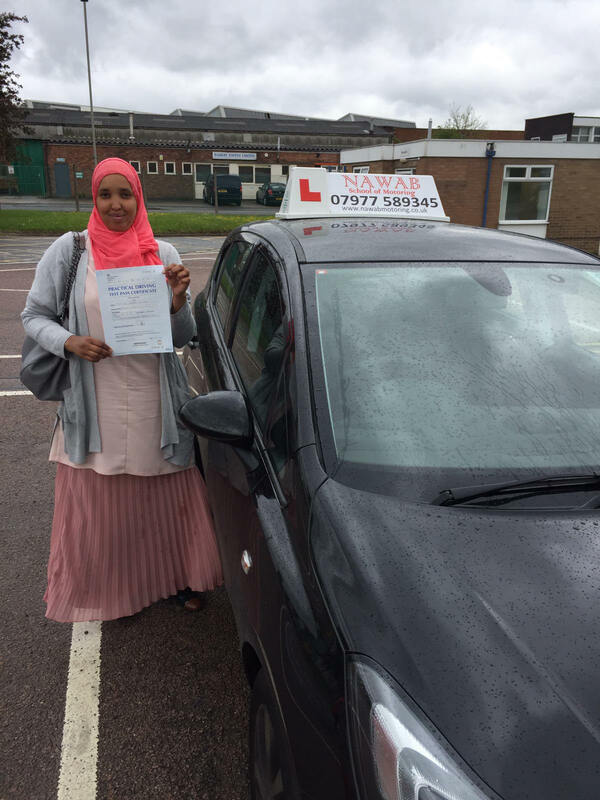 "Can I start off just by saying Mohamed is the best instructor I have had. I tried loads of driving instructors before and none of them prepared me for the test like Mohamed. He is patience, punctual and definitely value for money. He will ensure that you are prepared for the test and talks to you firm but politely. I would most definitely recommend Mohamed to new starters and those that are already driving. Thanks Mohamed." 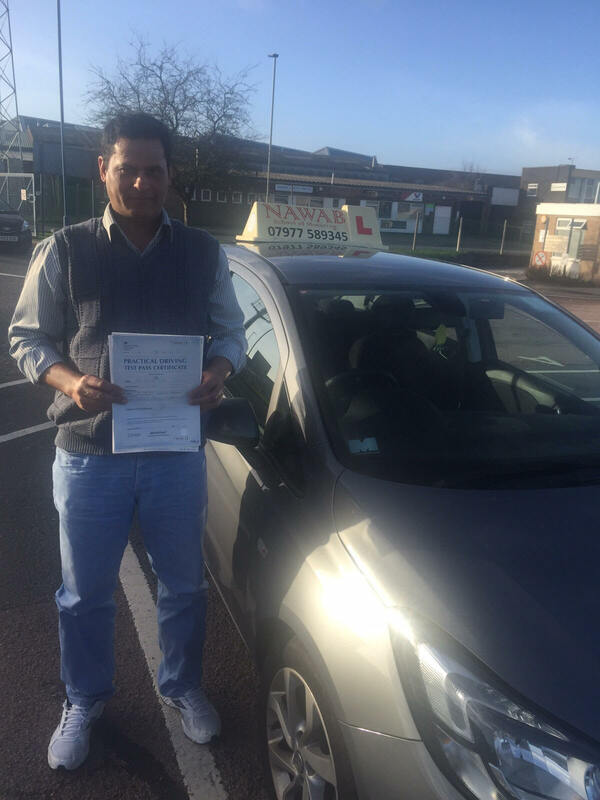 "Mohammed is an excellent instructor who is very patient and friendly. He was always on time and made sure that my lessons could be planned around my schedule. He helped build my confidence in driving and ensured that I was fully prepared before the test. I cannot recommend Mohammed enough!" 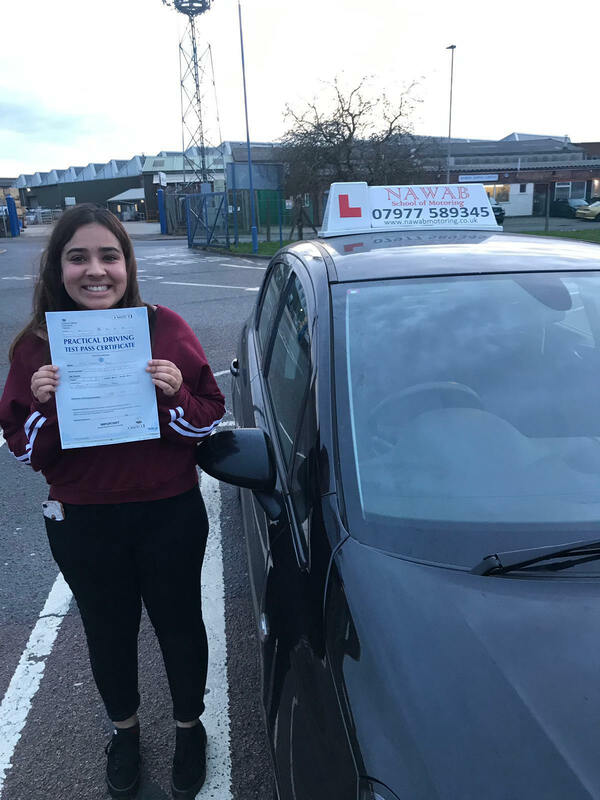 "I was a very nervous passenger and on my first driving lesson I burst into tears when a lorry came near and I stalled the car. Mohammed was extremely patient and an absolute god send. I never thought I would ever be able to drive let alone pass my practical but today I passed. 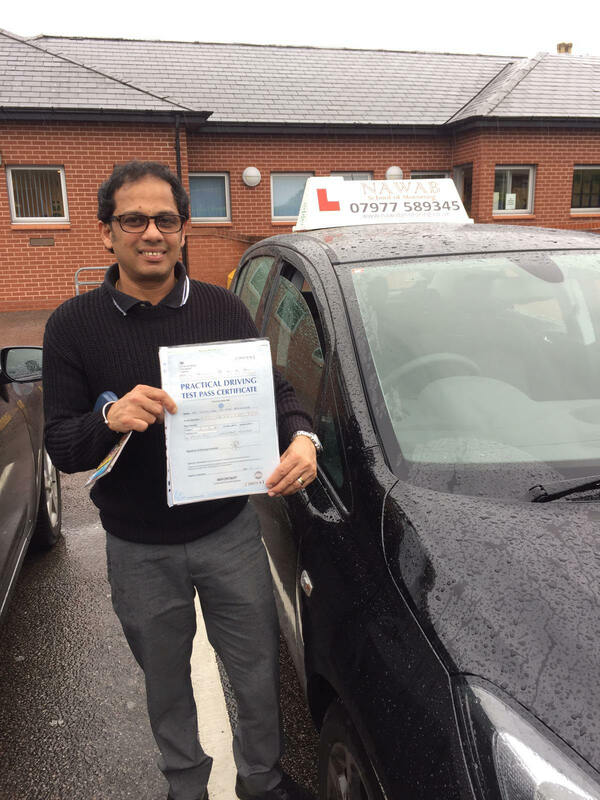 Everyone should have an instructor like Mohammed - He's one of the best Leicester has got. Thank you Mohammed x." 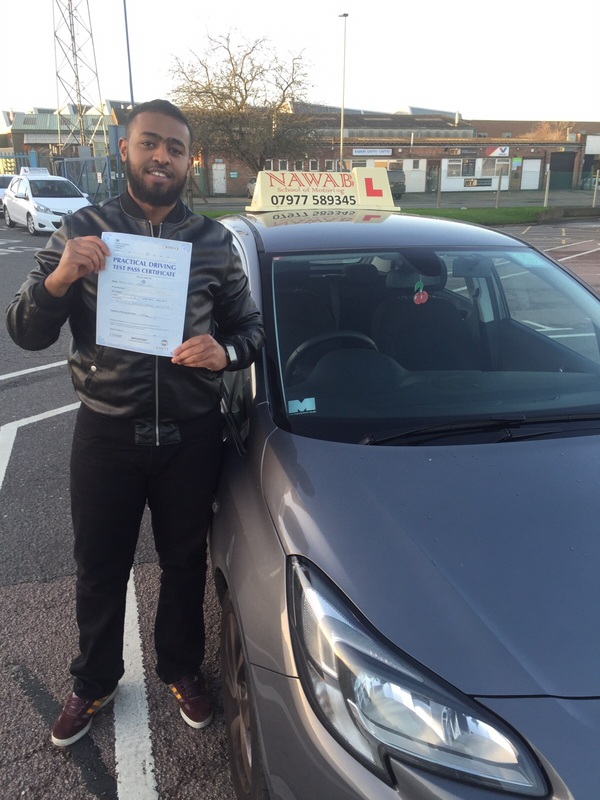 "Mohammed was an exceptional instructor making learning to drive easy and comfortable. Driving is one of those things you need practice at and for an instructor, patience. He kept his cool at all times and always encouraged me to go on. I am very pleased with his teaching methods - I would definitely recommend to everyone. A pleasure to work with!" 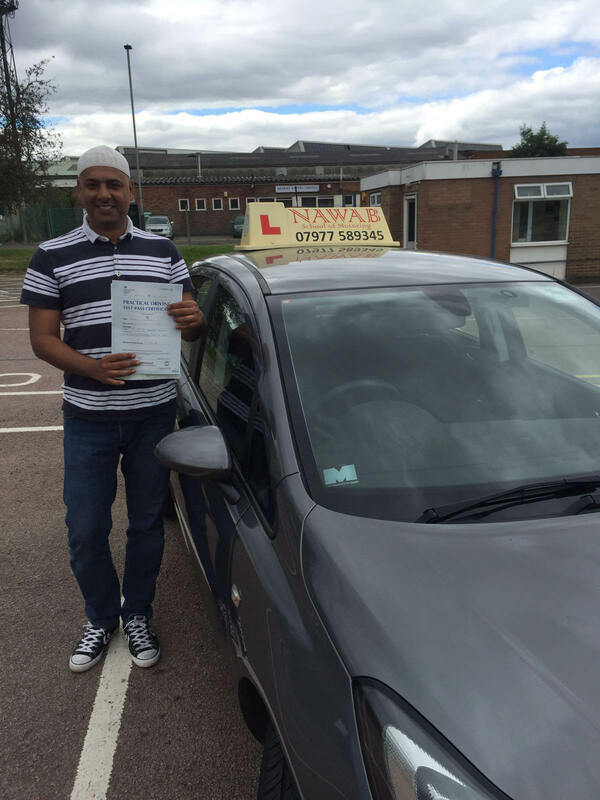 Mohammed Nawab is a brilliant instructor he has supported me all the way through from my very first lesson with him. I felt very comfortable to learn with him. His instructions was very clear and understandable. Mohammed is always on time for my lessons. 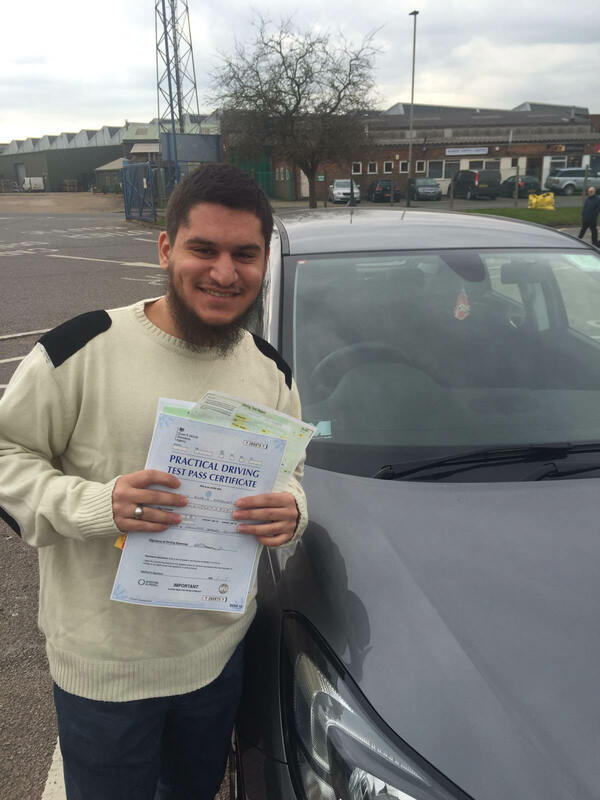 I feel very grateful that i have learnt my driving with Mohammed. 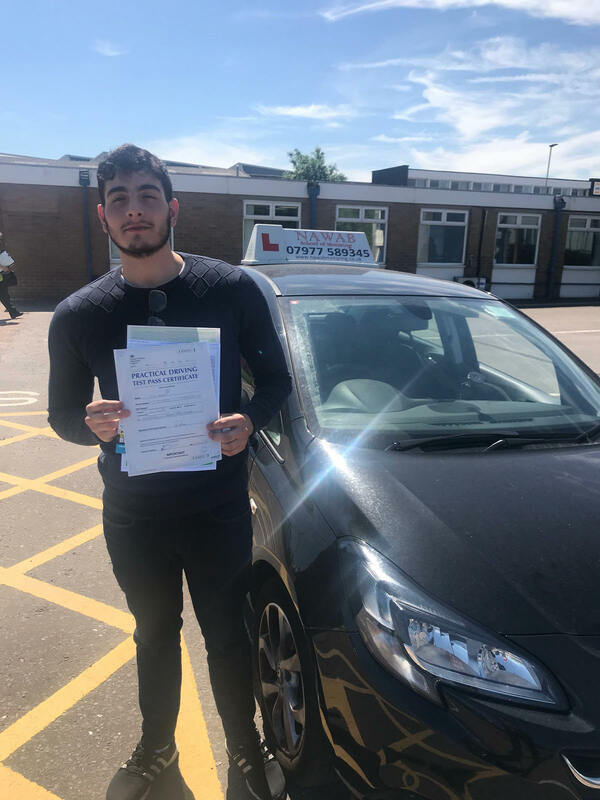 I don't think i would have passed on my first exam if it was not for Mohammed i felt very relaxed and comfortable with him compared to my first instructor I'm very happy i came to Mohammed. He was very calm and patience! 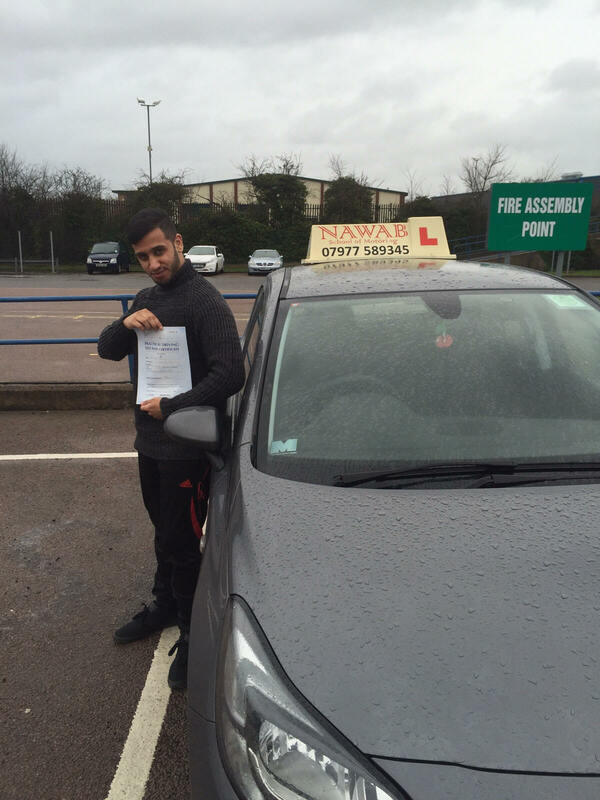 I would recommend Mohammed Nawab to anybody out there wanting to learn how to drive safely. 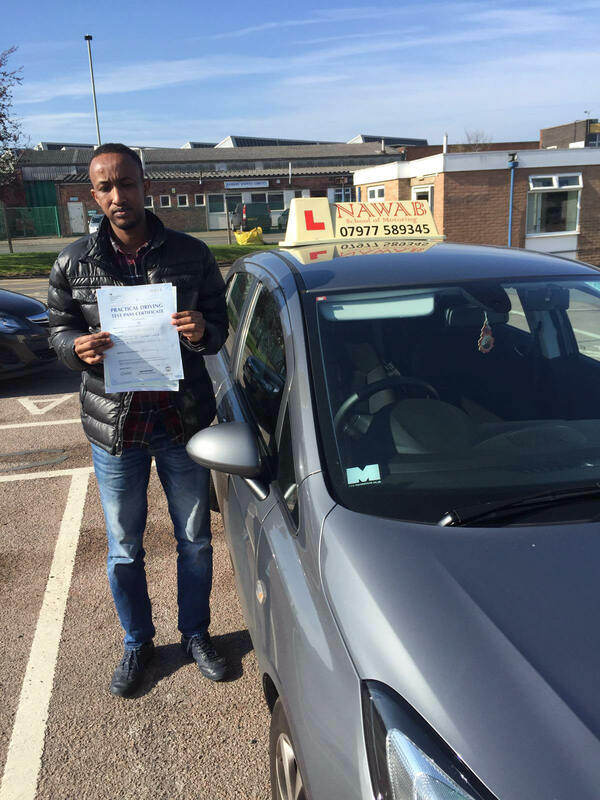 "Mohamed gave me more confidence especially after my unsuccessful first attempt with my previous instructor. He believed in me more than I did in myself. Mohamed made sure every lesson counts. He's cordial yet always focused on preparing you for your practical test. 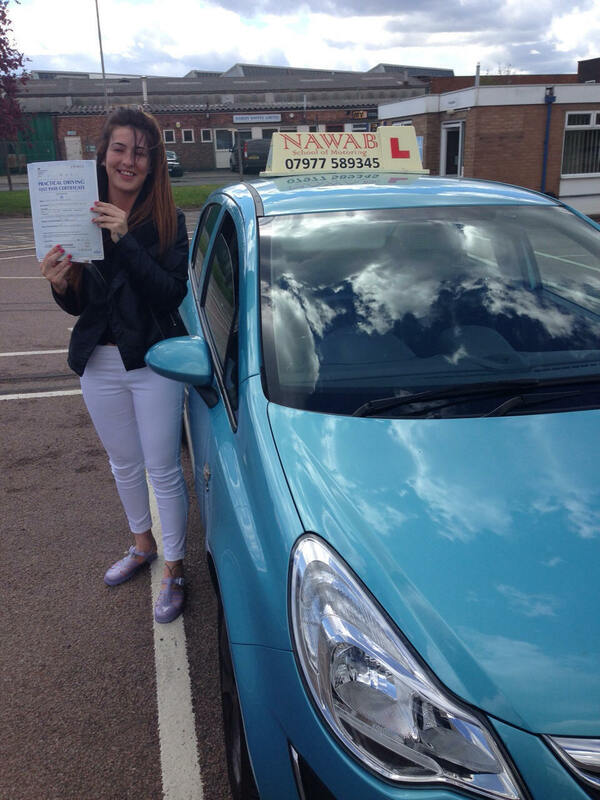 I couldn't have asked for a better driving instructor." 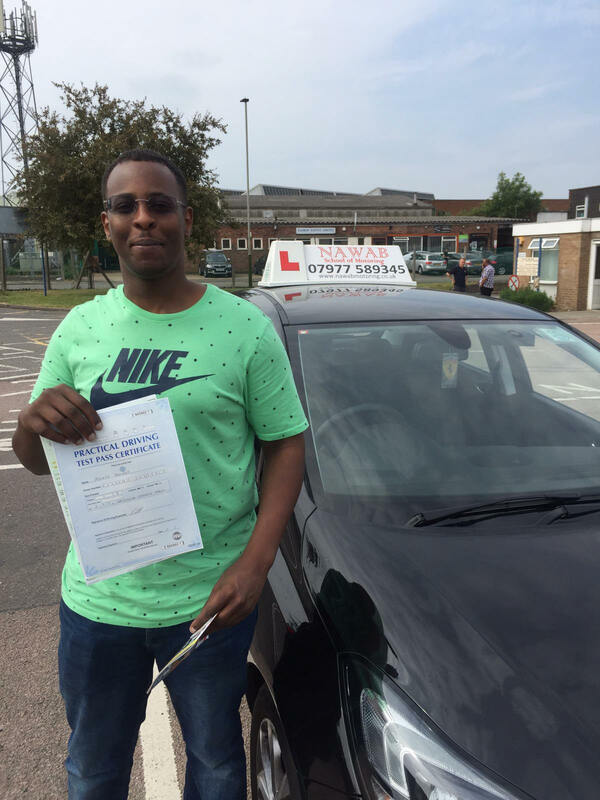 "Just want to thank Mohammed for increasing my confidence in driving if it wasn't for him I wouldn't have passed first time. The best thing about these lessons is that I didn't feel under pressure and my instructor was patient." 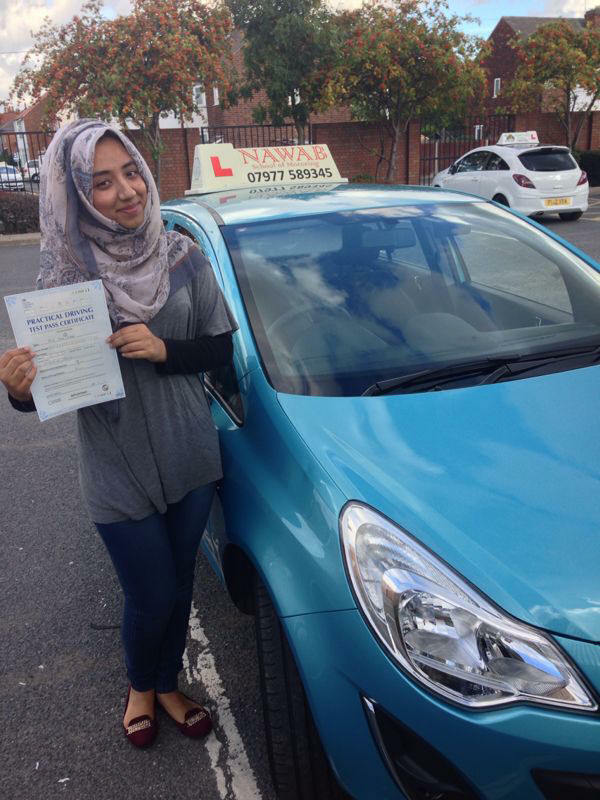 "Learning to drive with Mohammed was an absolute pleasure. He tailored the lessons exactly to my needs, so I ended up taking my test earlier and with more confidence than I thought possible. 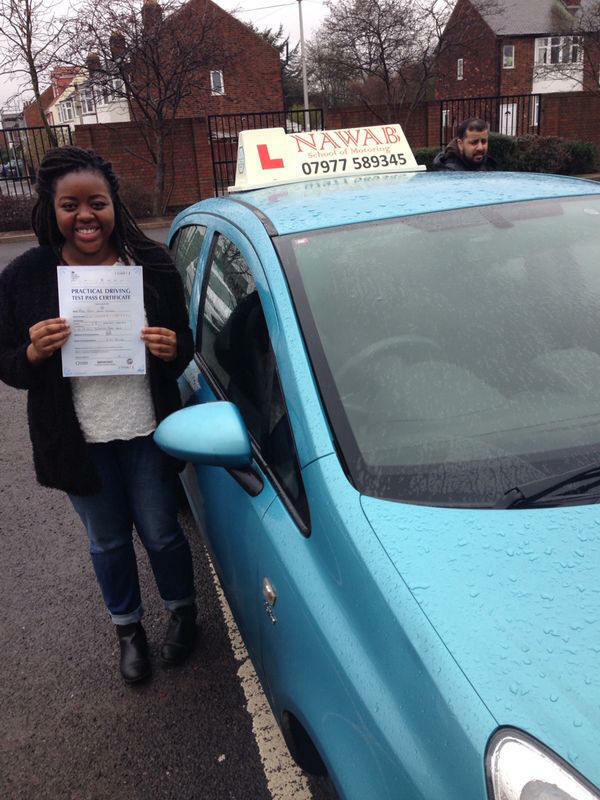 The lessons were always enjoyable and he took all the stress out of the process allowing me to pass first time." 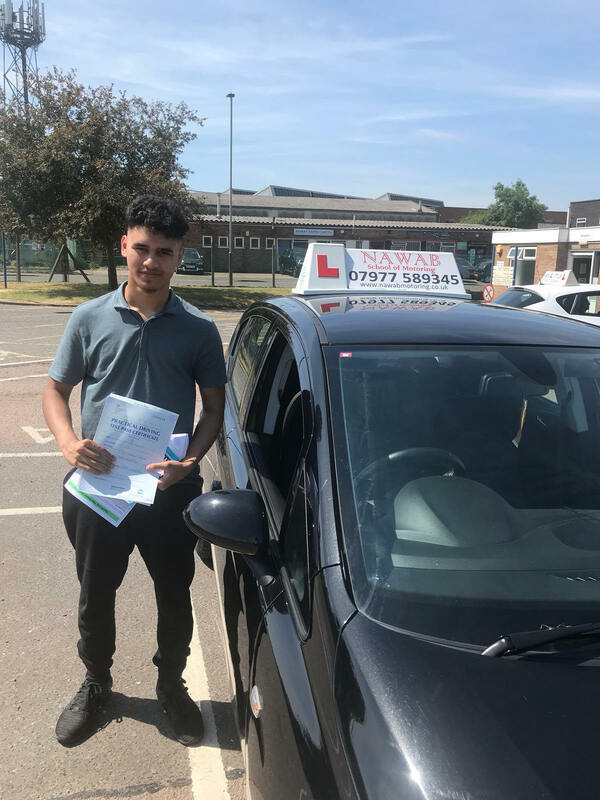 "I couldn't recommend Mohammed highly enough, I changed instructors extremely close to my test and after just a few sessions with him i felt more confident and more able to drive than I had through a whole year of previous lessons. His calm, informative and encouraging attitude is just what is needed when learning. 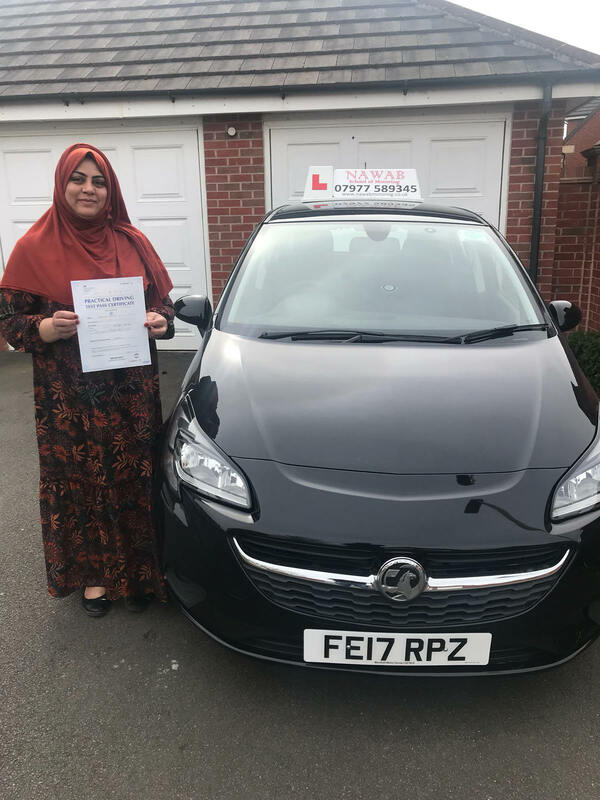 I had no anticipation of passing my test and was over the moon when, thanks to Mohammed, I did so first time..."
"Mohammed Nawab is a brilliant instructor being both patient and a very good teacher, and with his guidance, I passed in about 30 lessons. Not only that, he makes sure he is available to teach you at whichever times you desire and is convenient in the fact that he will pick you up from wherever you are, whether it be from home or school, which was very practical at a good rate. 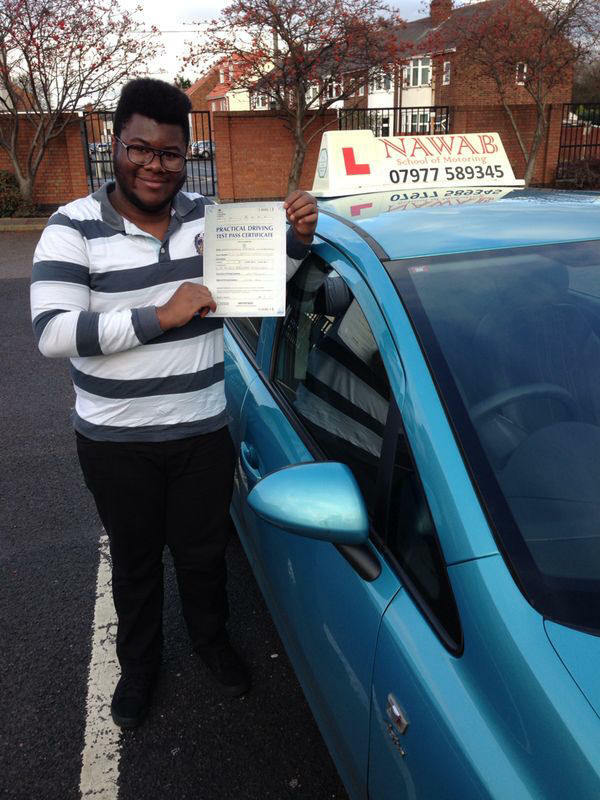 I thoroughly recommend undertaking driving lessons from him." 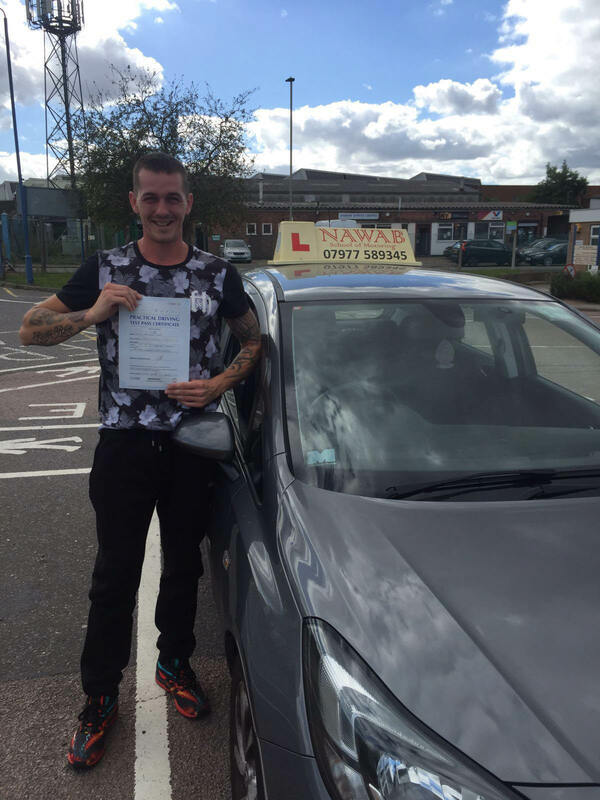 "From day one he has been a very professional and punctual instructor. His teaching maneuvers were very simple and easy to understand with reference points given. He is just an outstanding instructor and would recommend him to anyone." "Mohammed nawab is an excellent instructor. It is very easy to understand and follow his instructions. I realised very early with him that my confidence level under his teaching was very high, compared to my previous instructor. His method of teaching manoeuvres is brilliant too. He advised me to book my practical test at exactly The right moment thus saving me lots of money on unnecessary lessons. Would recommend him to everyone." "Developing driving teaching and learning should be continual and should be seen as a principal activity of the driving school. The aim must be to ensure that teaching reaches the minimum standard of ‘Good’ at all times and that Mohamed Nawab aspire to be ‘Outstanding'!!!" 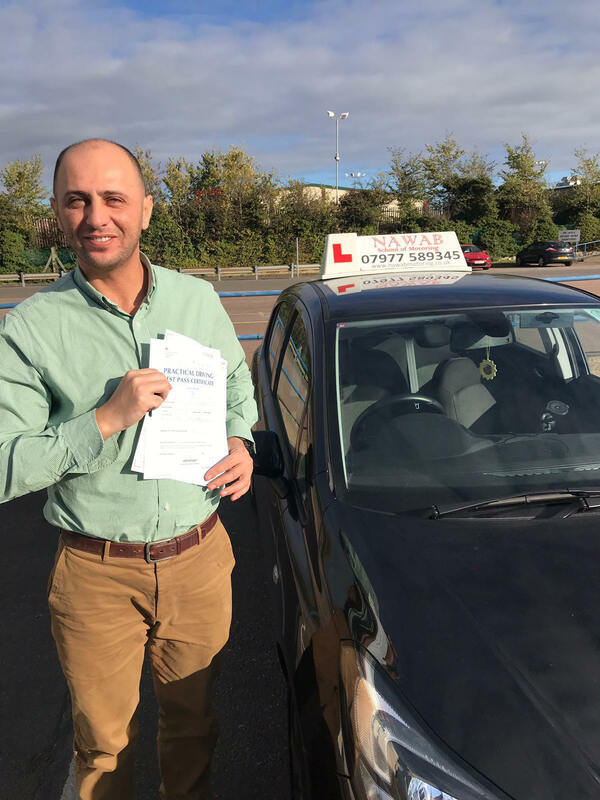 "Having never driven a car I was really nervous but from the first time I met Mohammed I was put at ease, He was very professional and was easy to talk to, and very patient. During the lessons we went most of the test routes which I found very helpful in my test. was quick to assess my level of driving and geared my lessons accordingly. 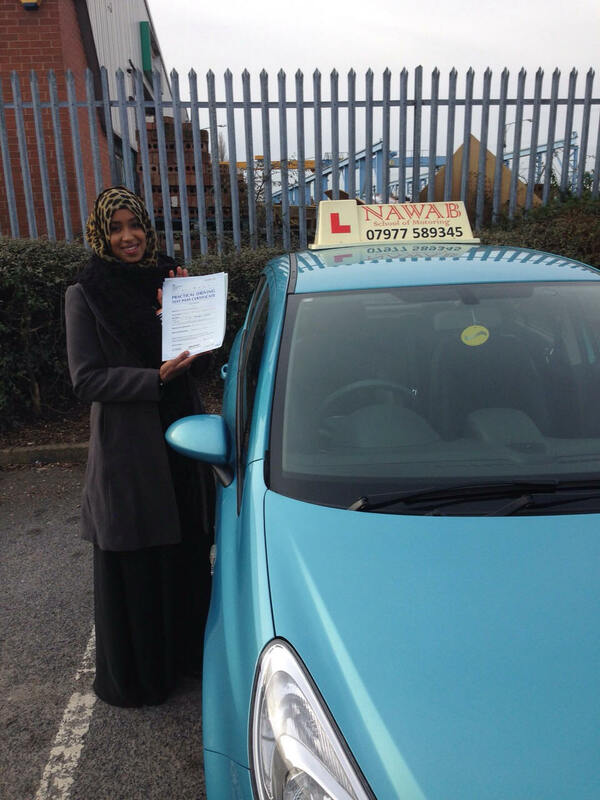 With the help of Mohammed I passed my test first time!! 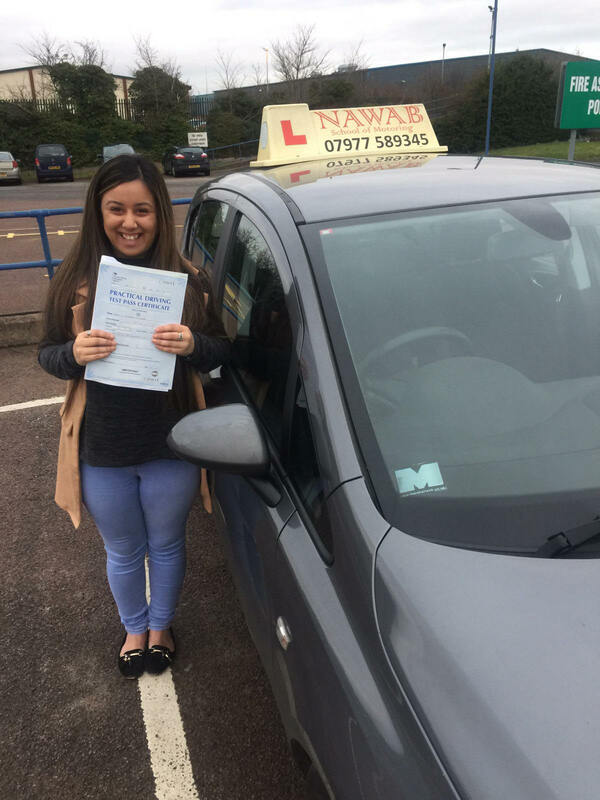 So if your thinking of going with Nawab I really hope all the instructors are as good as Mohammed I can't thank him enough." 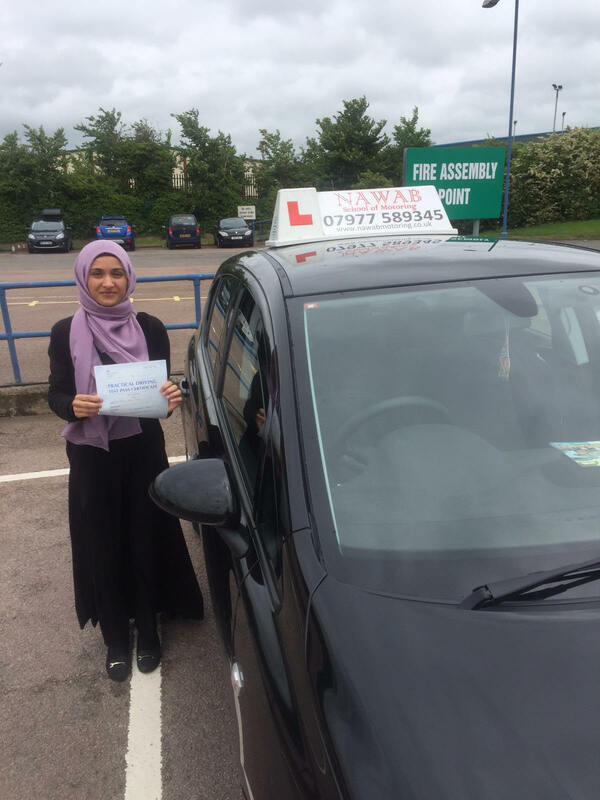 Nawab School Of Motoring - Driving School Leicester - Professional Driving Instructor, Leicester & Luton, UK.